Veteran motorhead/automotive journalists Jeff Zurschmeide and Paul Duchene drive the newest cars so you don't have to... their wisdom in about 300 words. Click on the photos to enlarge. Scroll for more reviews. 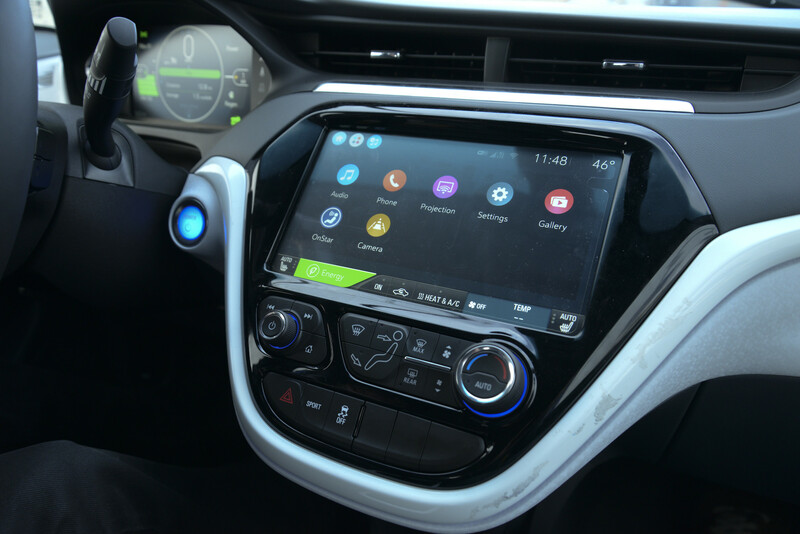 Likes: The Chevrolet Bolt combines Silicon Valley technology with a pretty decent Detroit automobile. The price is reasonable and laptop technology is combined with a lively and enjoyable driving experience. Forget range anxiety: the 200-horsepower Bolt is capable of 238 miles on a full charge and tests suggest that figure is conservative. Top speed is 93 mph (160-mile range at that rate), and 0-60 mph comes up in 6.5 second, with silence urging caution. The Bolt feels sturdy and handles precisely, grounded by the 949-pound underfloor battery pack, which outweighs the body by 134 pounds. 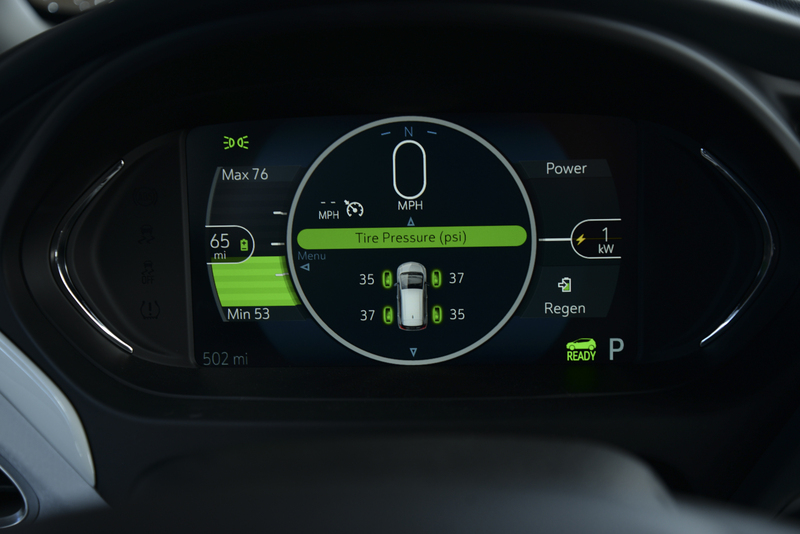 Regenerative braking takes getting used to, but seem effective and steering wheel paddle can also stop car. You can drive the Bolt right away (after the car tests 1400 systems in half a second), but it will take hours to learn its abilities. The mobile app connects with a smartphone. Two screens from LG (the central one is 10.2 inches diagonally) offer comprehensive control packages, including a 360-degree camera, plus front and rear views, climate and energy use displays, programmable teen driving limits and charging controls timed like an alarm clock. The rearview mirror can also be switched to a camera. Wi-Fi can power up to 11 apps in proximity, while OnStar can limit a stolen car to 10 mph and locate it. Driver confidence safety features include low-speed automatic braking, forward collision alert, lane change alert, rear cross traffic alert, auto-dimming headlights and rear park assist. The Bolt’s onboard charger “fills it up” in 8.5 hours, though a 240-volt boost can add 50 miles in two hours and a 480-volt charge adds 90 miles in 30 minutes. Low power alerts give plenty of warning. AM/FM/MP3/XM/CD SatNav with iPod and USB jacks. Automatic climate controls, push button start with smart key. The premium package includes leather interior, heated/cooled front and rear seats, 40/20/40 rear seats acceptable space for rear passengers. 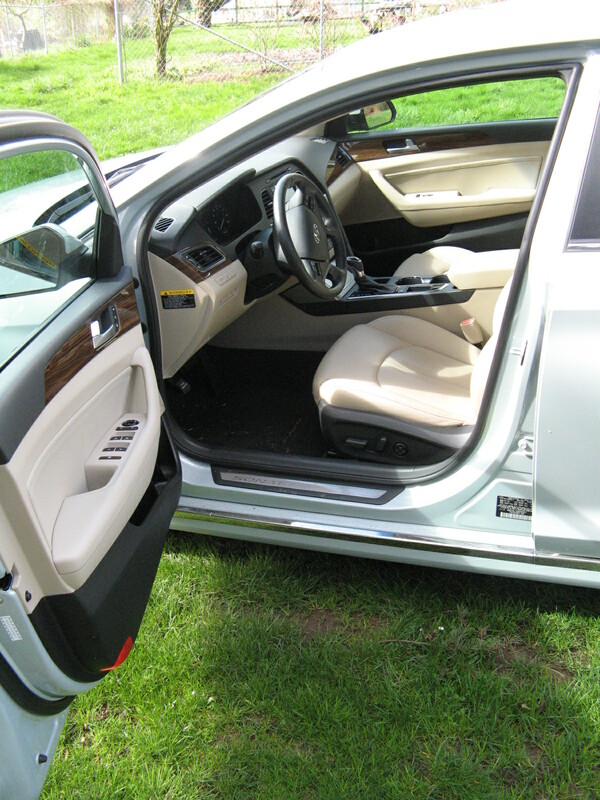 Low trunk floor means chairs can be carried in an upright position. Maximum luggage space is 56.6 cubic feet. 8-year 100,000-mile battery and electric drivetrain warranty, 5 years/60,000 miles roadside assistance and basic On-Star support, 3-year GM complete new vehicle warranty. Gripes: Ride may be too firm for some, and the low-resistance tires are not very sticky. For once you do really need to sit down and listen to the salesman explain the car's features – and you might think about taking notes. Verdict: The Bolt represents a huge step forward for Detroit in the EV world. It delivers the same range as a gasoline-powered car; it’s fast, quiet and affordable. GM also provides a comprehensive dealer network to support it nationwide – which is a significant advantage over Tesla. Expect future models to charge even faster, as batteries improve. When 15-minute proximity charging becomes a reality, the future of the gasoline engine (and the oil industry) will be numbered in months. Likes: Pretty good redesign, with excellent finish, 240 bhp, DOHC, 2-liter Turbo, 4-cylinder. All-wheel drive includes locking central diff, 6-speed auto with manual override, all power, a/c, cruise control and electronic power steering. Safety equipment includes stability/traction control, downhill brake control, hillstart assist, multiple airbags, seatbelt pre-tensioners. Good brakes, handles well. AM/FM/MP3/XM/CD with iPod and USB jacks and Bluetooth hands-free phone. Dual climate controls, push button start with smart key. Eight-inch touchscreen, SatNav with Sirius traffic; premium package includes leather interior, heated/cooled front seats 40/20/40 rear seats recline, panoramic sunroof, auto-dim mirror, cargo cover, heated folding mirrors, rear side-window shades, hands-free power-operated liftgate (you just stand in front of it with the key fob). Ultimate tech package includes 360-degree camera, smart cruise control, automatic emergency braking with pedestrian detection, lane departure warning, blind spot detector. Substantial 71 cubic foot capacity. 10-year, 100,000-mile powertrain warranty, with 5-year roadside assist. Gripes: Mileage only 1 mpg better than 2013, and is unacceptable around town. Adjustable steering a bit numb on all settings. Restricted rear visibility makes backup camera essential, and mirrors must be checked carefully. Turbo model loses 24 bhp this year. It’s supposed to be more driveable, but suffers turbo lag at takeoff, which was particularly noticeable during snowfall. Verdict: I did a double-take when I saw the $40,000 sticker. The Santa Fe Sport is the 5-passenger SWB version of the line and the LWB Santa Fe is 6/7-passenger LWB model. Hyundai seems to have missed a few bets lately, resulting in flat sales and the exit of CEO Dave Zuchowski. Comparison shoppers should check out the new Mazda CX-5, Toyota RAV-4, Honda CRV, Subaru Outback and Ford Escape. 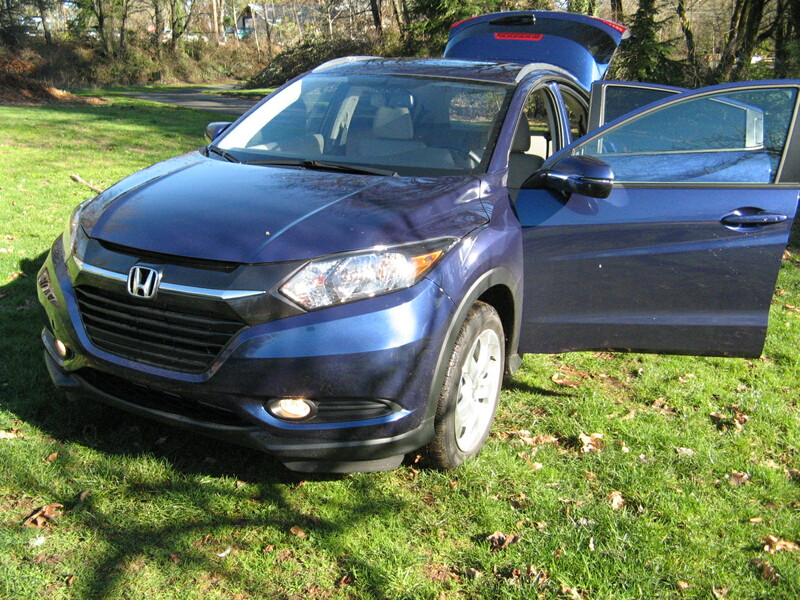 Alternatively, the last Honda HR-V I drove cost about $26,000 and had many of the same options. I’d buy one of those, and take a trip with the money saved. Likes: Extremely capable family mover. 290 horsepower 3.5-liter, VTEC V6 adequate, 9-speed auto is worth using manually (teething troubles have been sorted), active suspension/SH-AWD torque-vectoring combo reassuring. Tri-zone climate control, leather interior, front seats heated/ventilated, driver and passenger seat are 10-way adjustable, second row captain’s seats also heated, multiple safety systems, airbags, rollover sensor. AM/FM/DVD-A/CD/DTS/XM Pandora radio, surround sound, Bluetooth hands-free phone. Power moonroof, power tailgate, navigation with voice recognition and real-time traffic advice, multi-view rear camera, blind spot recognition, rain-sensing wipers. Adaptive cruise control, forward collision warning, collision mitigating braking, lane departure warning, rear cross-traffic warning. Dislikes: Touch screens on dash are a nuisance, and console combination of push-button drive, pull up for reverse and push-button electric handbrake makes no sense. Third seat still tight, but other makes are worse. Start-stop is clunky. Verdict: Competitive entry in its class. Reliable, fast and worth considering. Safety systems notably effective – and tested on Interstate 5, when traffic stopped suddenly in the rain – except for the 2013 Ford Focus behind me. Every warning light lit up on the MDX dash, and I was able to brace for the rear impact. The Ford was severely damaged. The rear bumper on the MDX was creased and part of the underneath valance popped off. You had to look closely to notice the damage. Even though the MDX repair bill was reportedly $2,400 (that’s why your insurance rates are so high) it was probably one third the bill on the Focus. Surprisingly, the Focus airbag was not triggered, but if it was a Takata unit, that might be just as well. Likes: Hyundai wasted little time side-stepping the slow-selling Equus and bringing most of its attributes to a new Genesis. Upgraded and redesigned, it’s a very attractive alternative to a BMW 5-Series - and shoppers for a Lexus LS 460, BMW 7 Series, Mercedes Benz S-Class or Audi A8 might consider doing with a little less pomp and circumstance. 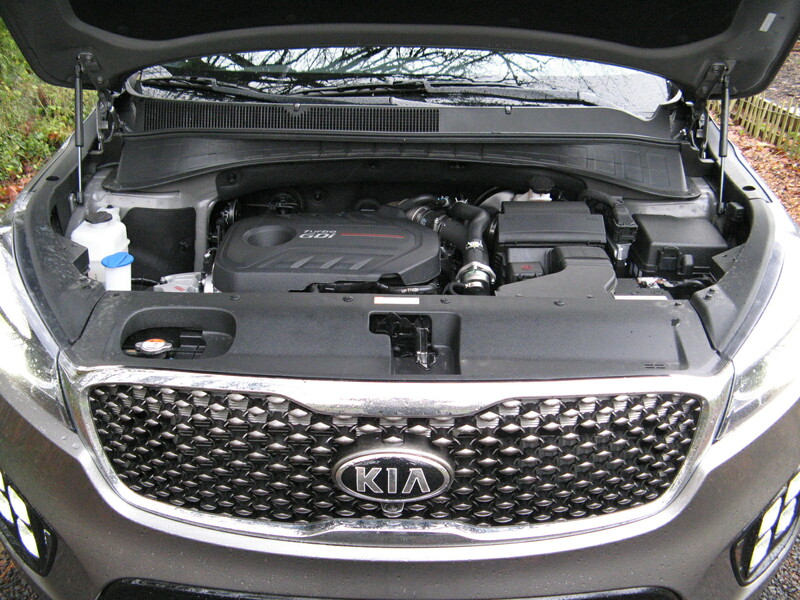 There are two trim levels; this test car was the 3.3 T Premium, with DOHC 365 bhp, turbocharged V-6 engine. The 5.0 Ultimate has a 420 bhp DOHC V8 and a few more luxury options. All-wheel drive is available in both models. Power is delivered through an 8-speed automatic transmission with paddle shifters and sport settings, electronic adaptive suspension and an endless row of gadgets. Lexicon 17-speaker surround-sound stereo with HD, CD/DVD, iPod USB interface. 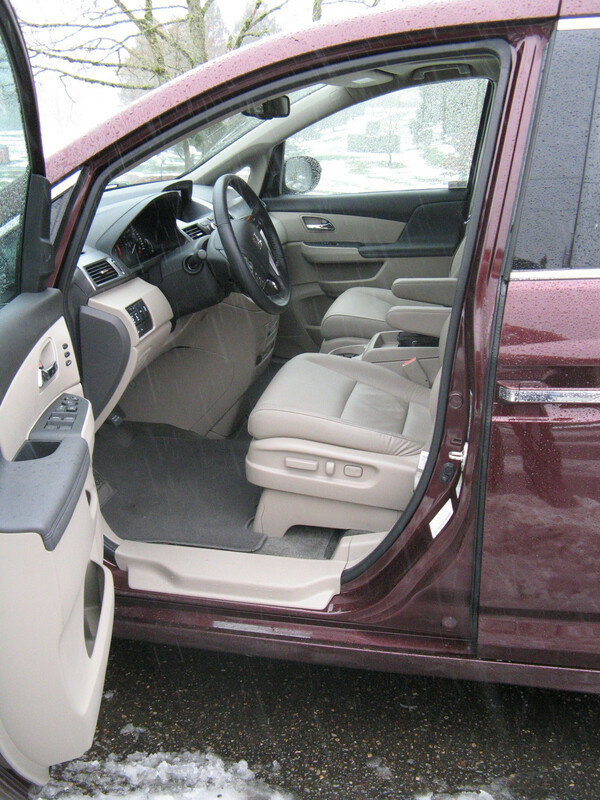 Leather interior with heated and cooled front seats, with a 22-way adjustable driver’s seat and 16-way passenger seat. Nine airbags, including roof-mounted side-curtains. Multi-view camera, blind spot detection system, with rear cross-traffic alert. Pedestrian detection, sleepy driver, lane-departure warning, active front head restraints, electronic stability, traction control and brake assist. Adaptive bi-Xenon headlights, power folding and auto-dimming mirrors, smart cruise control. Rear and side power sun screens, power door and trunk closure. 12.3 inch screen has navigation with traffic conditions, there are rear seat climate controls and stereo controls in the rear console. Handsome 19-inch spoked alloy wheels have tires which actually protect them from curbs. 10-year, 100,000 powertrain warranty, but 3-year, 36,000 mile no-cost maintenance includes valet service. Dislikes: More elegant than Equus but “electric razor” grille isn’t distinctive. Plenty of rear seat room, but no rear tables or entertainment screens. Not really a sport sedan, even on sport settings, but it’s quiet and fast. 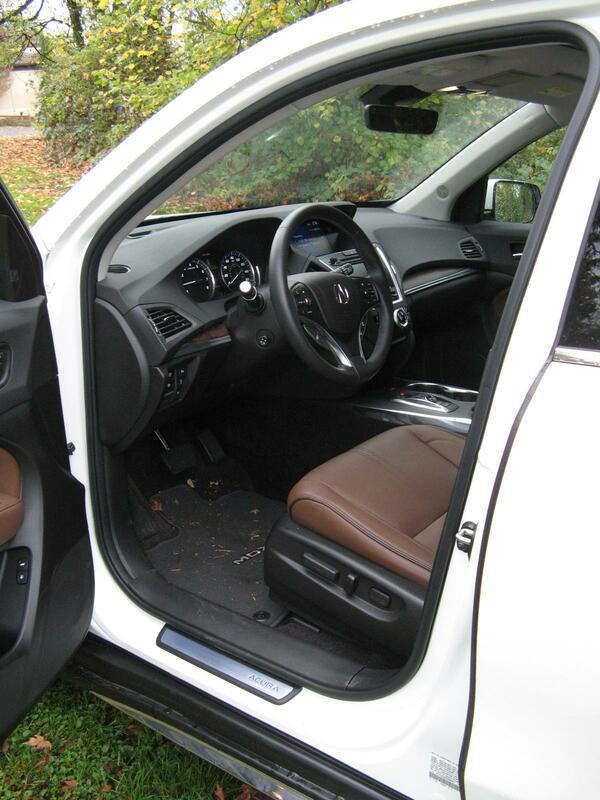 The leather interior is attractive, but seems soft, so who knows how it will wear. I’d like to see AWD standard, and a hybrid option. Verdict: Refined entry in this class and competitively priced. As always, the only problem is branding. Muscling in on BMW, Mercedes-Benz and Lexus isn’t just about excellence, it’s about brand recognition, and corresponding resale. I’d be inclined to lease a G90 and see how it holds up. I’m guessing depreciation could make it a wonderful buy in two or three years, and you’ll KNOW how it was maintained. 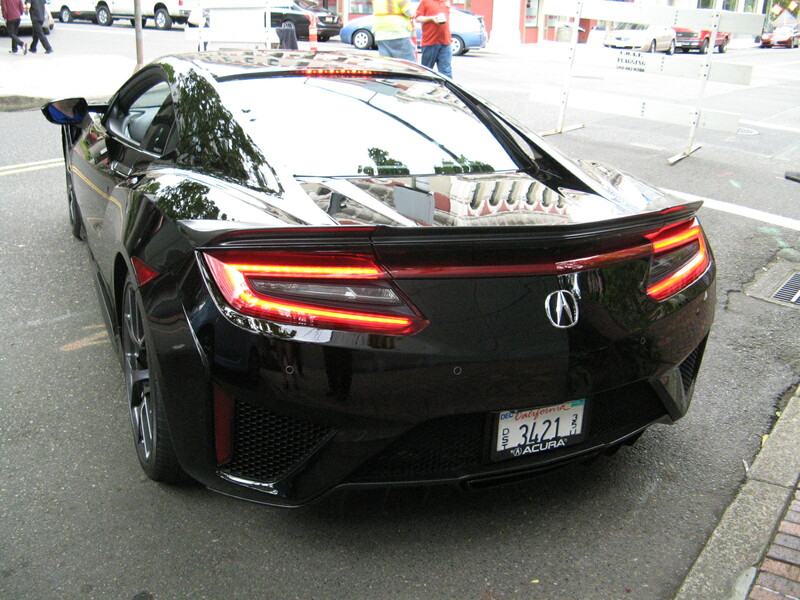 Everybody likes to think of a job where spectators say: “You mean to tell me you get paid for this?” Once a year, the members of the Northwest Automotive Press Association have to suffer the chore of driving about two dozen new (mostly) sports car in three days. Page One and Drive Shop, which actually distribute the cars to journalists the rest of the year sent 10 assistants to keep the cars gassed up, (urgent in the case of the Dodge Viper and Charger Hellcat), washed (for photo ops) and just generally keep the drivers on track. Drivers rotated through the cars every 20 miles. 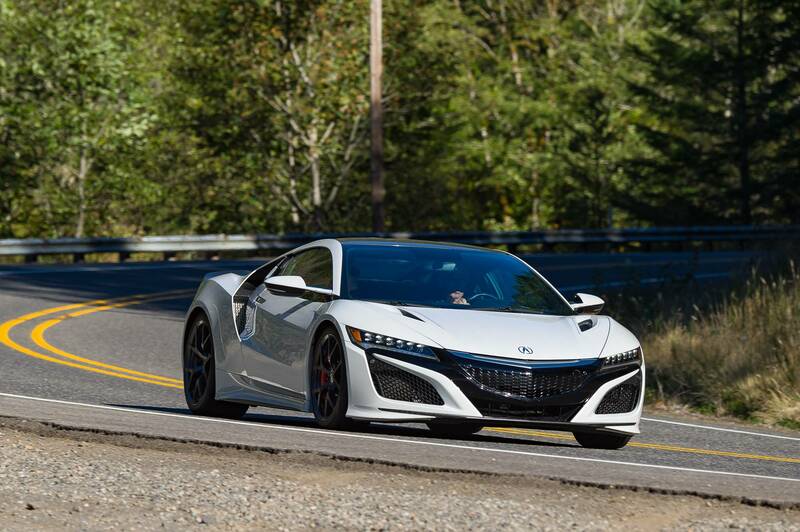 The cars included the new Acura NSX Hybrid Supercar, Audi RS7 sports sedan, BMW M4 Competition retractable hardtop, Buick Cascada convertible, Dodge Charger Hellcat, Dodge Viper Coupe, Fiat 124 Spyder, Ford Shelby GT 350, Honda Accord V6 Coupe, Infiniti Q50 Sport, Jaguar XE Diesel, KIA Cadenza, Lexus GS-F, Mazda MX5 Grand Touring roadster, Mercedes-Benz AMG-SL63 roadster, Mini Convertible, Mitsubishi Lancer, Nissan GT-R, Rolls-Royce Dawn Drop Head Coupe, Subaru BRZ Coupe, Toyota 86 (ex-Scion FRS), Volkswagen Beetle Dune convertible and Volvo S90 sports sedan. The cars are listed in the order I drove them. We started from Portland International Airport and spent two nights at the Resort on the Mountain in Welches. 2-liter, 205 bhp, flat DOHC 4-cylinder engine, 5-speed manual gearbox, RWD. Extraordinary collaboration between Subaru and Toyota (Scion) produced twin entry-level sports cars. Proportionally very much like my 1978 911SC Porsche, but with the power plant in front and 50/50 weight distribution. Still no turbo-charged engine and no 4WD option with the manufacturer’s admonition “No, and don’t ask again.” Much was made of low center of gravity and how having 4WD would raise the car. Most people would take the tradeoff any day, and the prospect of a BRZ with WRX STI performance seems like a no-brainer, even at $10K more. 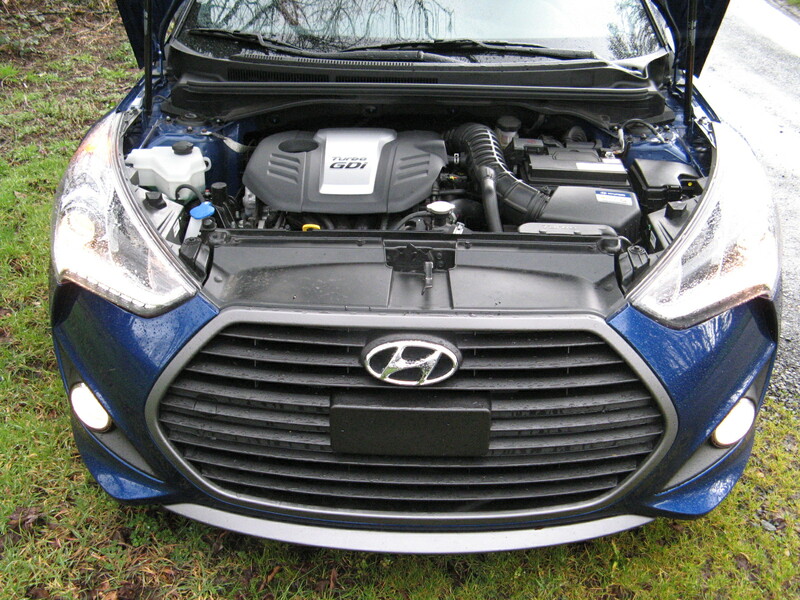 Even Hyundai got the message with the Turbo Veloster. Fun to drive ** Fun to look at ** Could do better, as my school reports used to say. It’s almost 20 years since Toyota brought the first right-hand drive Prius hybrids to Portland for a handful of journalists to test. 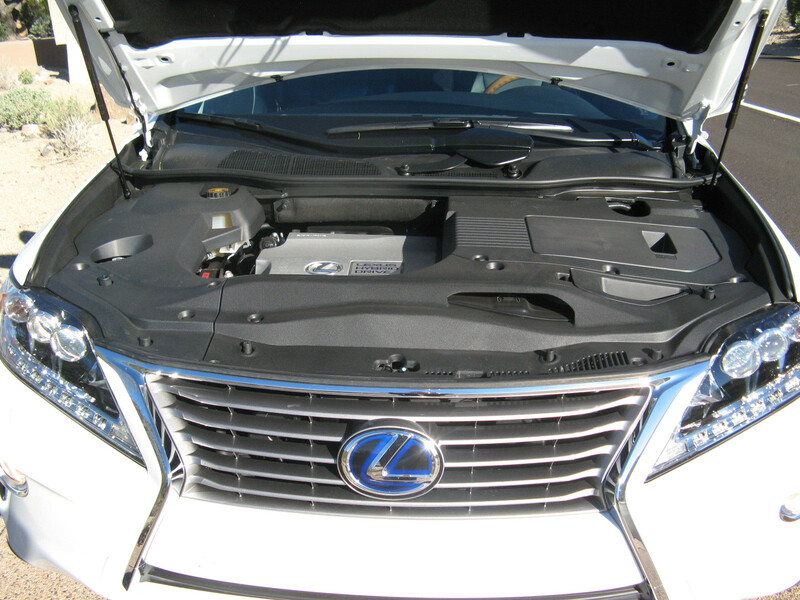 The word hybrid entered the automotive lexicon soon after, and is now commonplace. In June 1997, the cars were curiosities, looking like homely Toyota Corollas. They had minimal instruments in the center of the dashboard and underwhelming performance. My colleagues and I were mystified why the company would go to so much trouble and expense for so little apparent benefit. In 2001, I remember comparing how far I would have to drive a $22,000 Prius returning 50 mpg before I would gain a significant advantage over a $7,000 Hyundai Accent, which could manage 38 mpg. Journalists are never very good at math, but I seem to recall the break-even point was about 300,000 miles - 19 years later, at 15,000 miles per year. Who knew then that a Prius would actually GO 300,000 miles? It’s also probably fair to say it would take three Hyundai Accents to cover that distance. 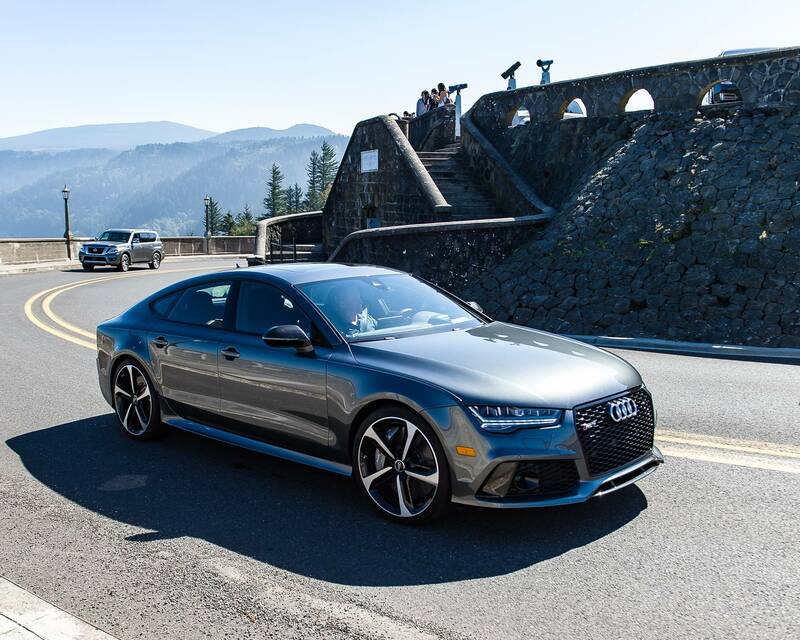 This year saw the third annual Drive Revolution test take place on July 19 in downtown Portland. 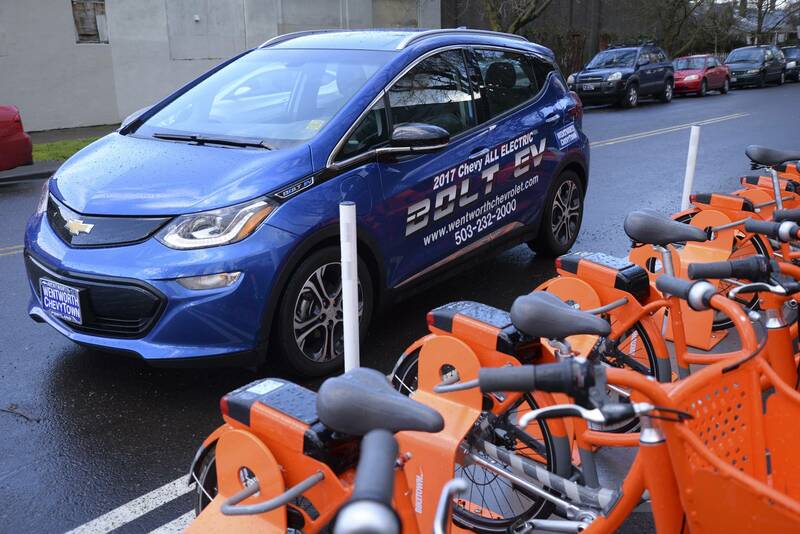 The event polled 20 journalists of the Northwest Automotive Press Association on the merits of 14 hybrid and electric cars. Significantly, there were no diesel offerings this year, that form of propulsion having received a sooty face from Volkswagen’s shenanigans. I concurred with three of the four awards, preferring the Mercedes-Benz 350e hybrid plug-in. The fourth year for this rather short-range missile, but it’s still charming. Very stylish colors, excellent finish, blisteringly quick off the line, but you pay a penalty with about 80 miles between charges. Perhaps best for stoplight racing in a small town with very fast traffic? 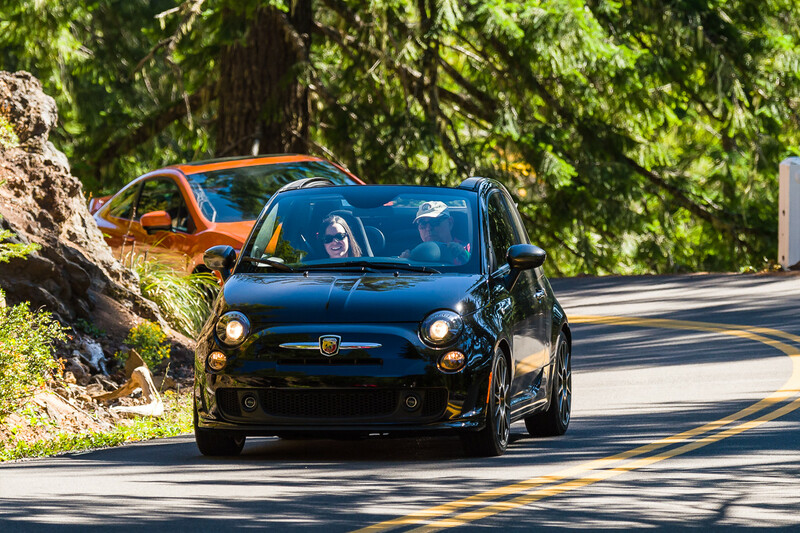 The gasoline Abarth 500 is just about as fast, and you can drive that to New York. Next question? Rating: ****- mostly for fun. Revised to look like a narrow Taurus, with an enormous back seat. Stylish if a little bland exterior; interior a bit plasticky, with cheesy quilting. 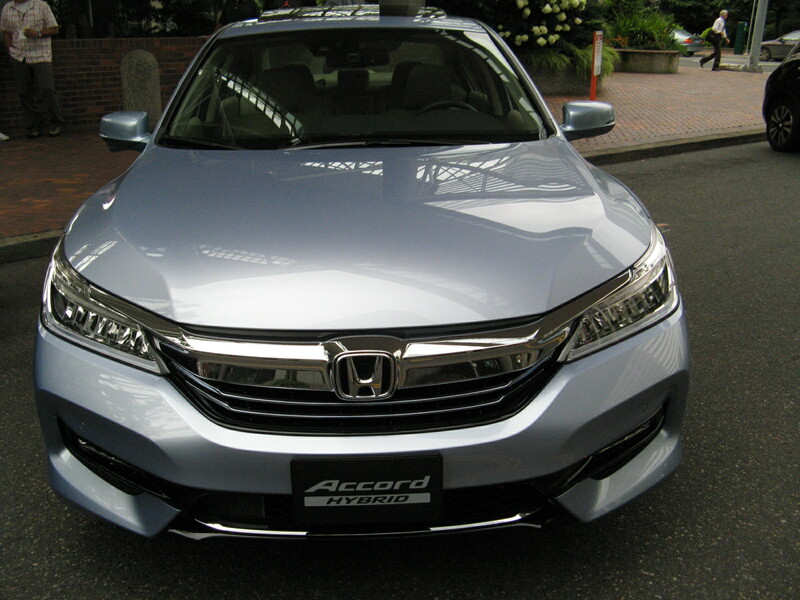 Feels like a real car ,but new Honda Accord Hybrid blows it away and is $3,500 cheaper. Rating: *** - one of those is for improvements. Brilliant redesign of already good car. 2-liter, 212 bhp DOHC 4-cylinder engine with electric direct drive until highway speed, when engine is engaged. Almost 50 mpg, sophisticated, quiet and very quick. 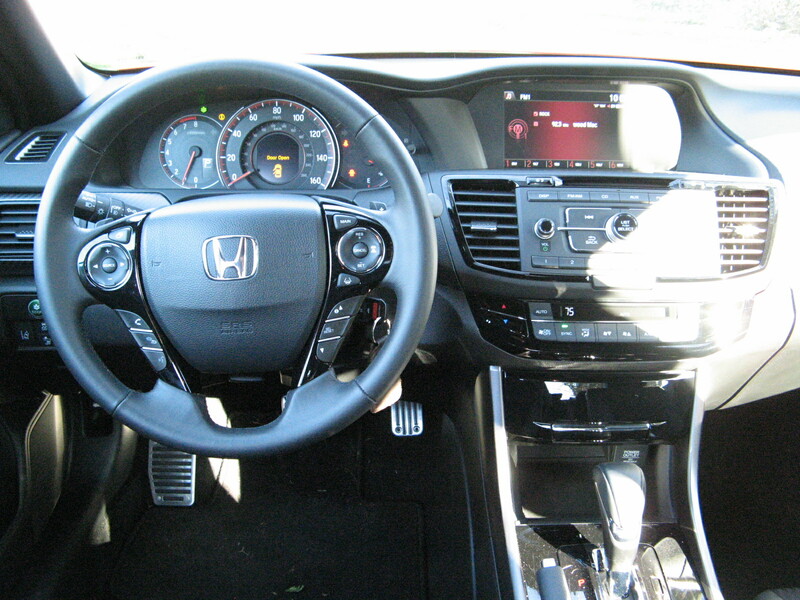 Touring model has every Honda safety, technology and luxury options. Costs about the same as most plug-in electrics, but it’s a real car, with 10 times their range. A no-brainer. Rating: ***** and if there were 10 stars, I’d give it 10. 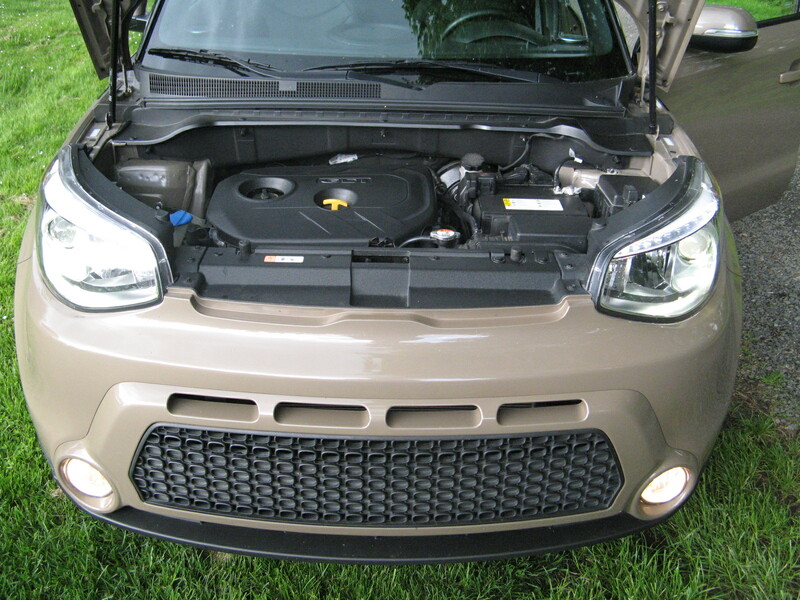 The Kia Soul has been a huge success for the company and the EV is likely to add to the 100,000 sold in the past few years. It has a competitive 93-mile range with a 27KWh lithium battery, a 109 bhp electric motor and a 480 volt fast-charge port. 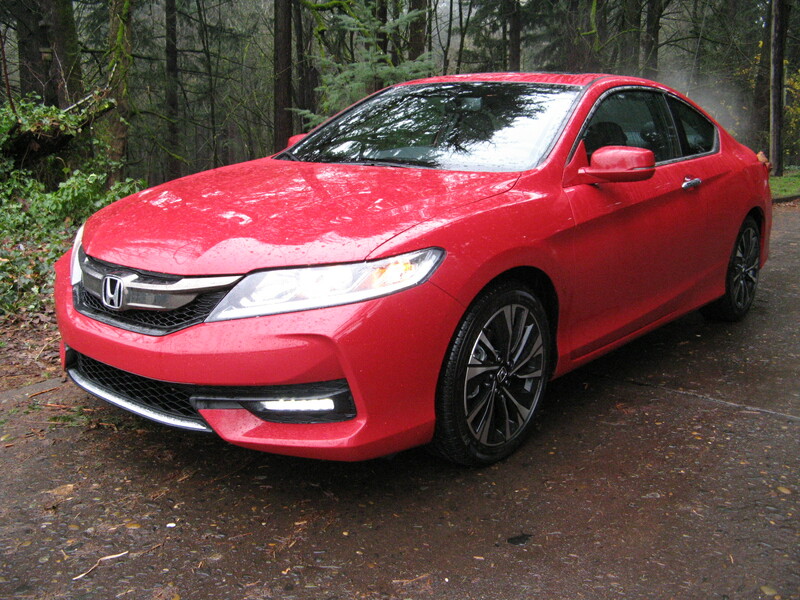 It’s also stylish and loaded with gadgets but even with up to $7,500 in Federal discounts the Honda Accord wins out, unless you aren’t planning to leave town. Too bad that no Souls offer AWD. High time for that. Rating: ***. This was quite a surprise. The price was $10,000 cheaper than the other plug-ins and it was a much better car in every way. In fact it didn’t seem like a plug-in at all, being quite quick and comparatively normal. It seemed like a real car, with improved infotainment (I hate that word), faster processors and a snappy performance despite having a smaller 115hp electric motor, which however gave a 116 mile range. The clear winner in this category, to the surprise of all concerned, I think. Likes: This is probably the Last Hurrah for the 2006 EVO body, but this package offers a bargain-priced usability, provided you don’t care much about creature comforts. 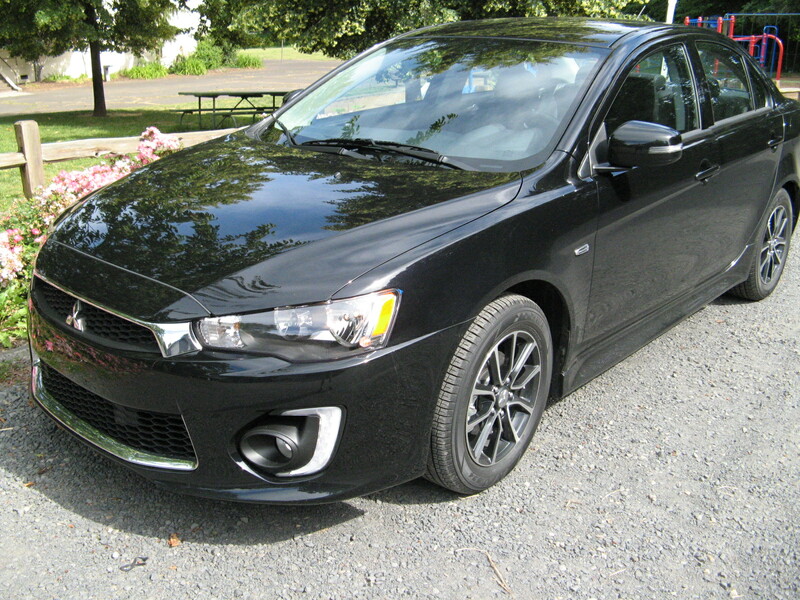 The Lancer’s grille has been modified so it won’t be mistaken for the late, lamented EVO. 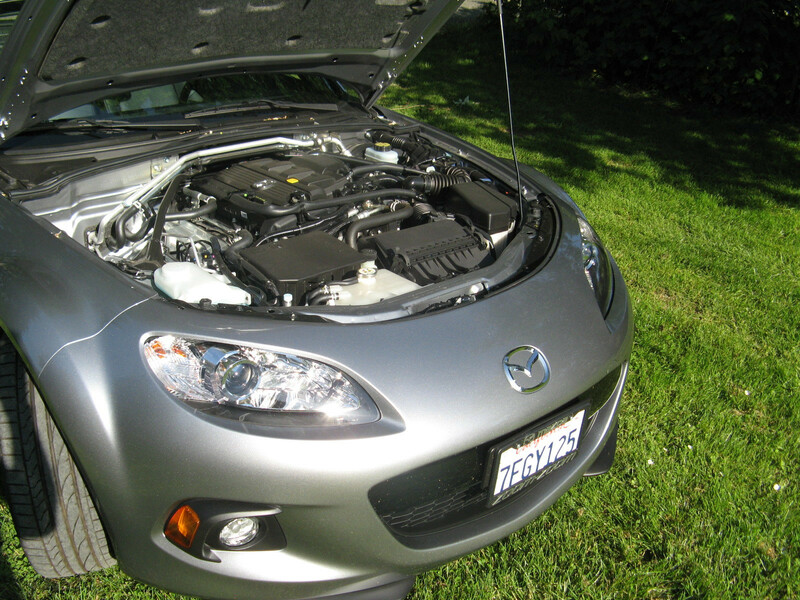 The larger 2.4-liter, twin-cam, 4-cylinder with variable valve timing provides 168 hp, which is adequate. Four-wheel drive offers options of front-wheel, all-wheel, and surprisingly for a car in this bracket a 4-wheel locked setting. Simple climate controls are most welcome (the three wheel controls), 140 watt stereo offers AM/FM/XM/CD, Bluetooth enabled and MP3. There are multiple airbags, ABS, traction control, air-conditioning, power windows/mirrors and remote locks, cruise control, heated leather front seats, back-up camera, rain-sensing wipers. 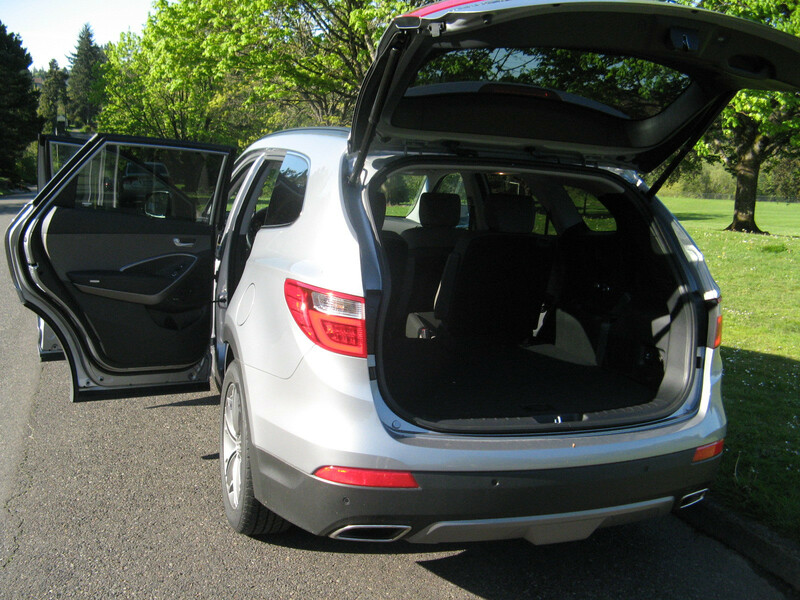 The rear seat folds and splits 60/40, which makes up for the 12-cubic-foot trunk. Dislikes: Annoying CVT saps power; I’d rather have the 5-speed stick, but I suspect it is not available with AWD. Gas mileage averages only 26 mpg, which was OK in 2007, not so much today. Handsome 18-inch wheels do not help road noise (though Honda Civic and Toyota Corolla are noisier). Interior is hard plastic, which modern consumers won’t like (I don’t care). Verdict: There are a number of issues at stake here. The first is how long will Mitsubishi stay in the U.S.? Fortunately they make successful SUVs, heavy trucks and battleships, but the auto division feels like the youngest son’s vanity project. In any case, abandoning the EVO made no sense – a bit like cancelling the Concorde after not redesigning it in 30 years. Most people will buy a Subaru if they want AWD, and a Toyota Camry or Honda Accord if they want a sedan with high 30s highway mileage, while Kia and Hyundai offer more attractive comparables. 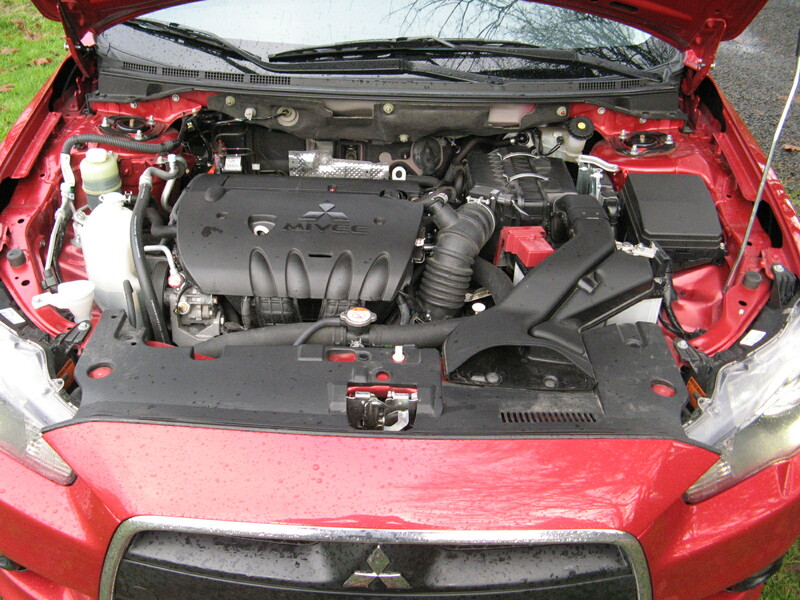 However, the Lancer’s mechanical package makes sense if you live in an area with real winter. This is a competitive car for the money. 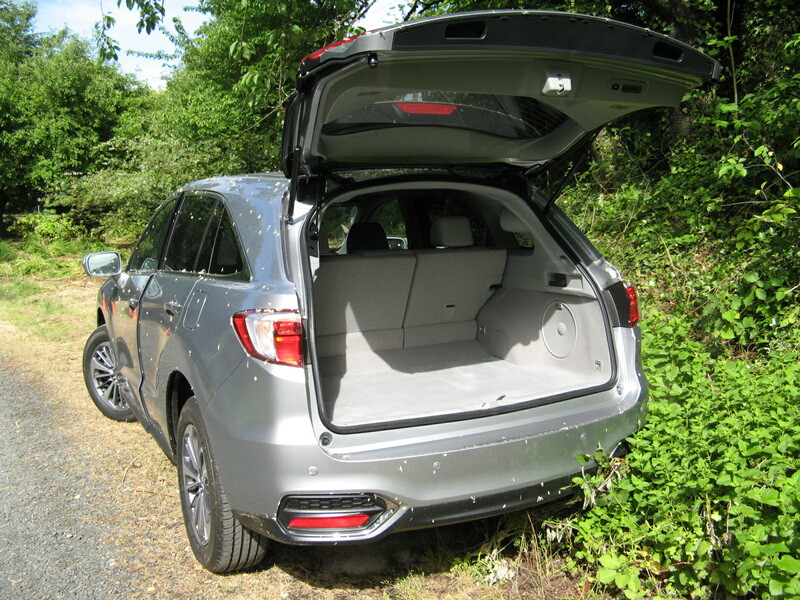 Likes: The RDX was redesigned for 2015 and this year’s model is basically a continuation. But it’s still very competitive in its class. The 3.5-liter, 279 hp SOHC i-VTEC V6 pulls it to 60 mph in 6.5 seconds – which is pretty impressive for 4,000 lbs. It’s smaller than the MDX, but sells nearly as well against a strong market, which includes the Audi Q5, BMW X3, Mercedes-Benz GLC and Volvo XC60. Paddle shifters work a 6-speed automatic transmission; there are ABS disc brakes all-round, stability assist, electronic brake distribution. Instruments are clear, the dash simple, controls obvious, active noise dampening fairly effective. 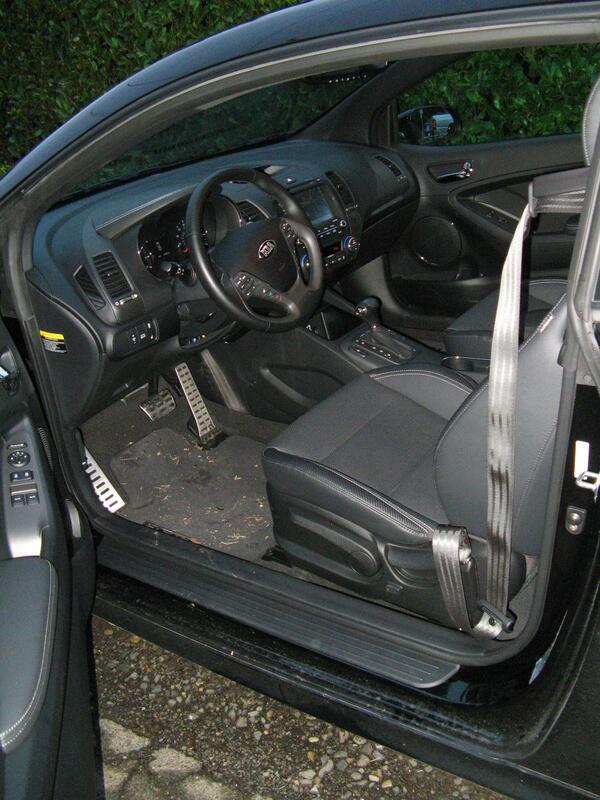 Leather interior, power/heated and cooled front seats, with driver’s memory. Dual climate controls, one-touch windows. Numerous air bags, self-tensioning belts, side curtains and rollover sensor, active headrests, power tailgate, rear camera. More legroom than the X3 with an extra two inches front and back. Buy the Tech package and Advance packages, which deliver as much safety equipment as any in the class. Excellent voice recognition navigation with real time traffic and weather, multi-angle camera and rear cross traffic monitor, 10-speaker surround-sound stereo/CD/XM/MP3, XM USB, blue-tooth etc. AcuraWatch Plus Package includes adaptive cruise control, collision warning, auto braking, cross traffic warning, lane keeping and departure warning. 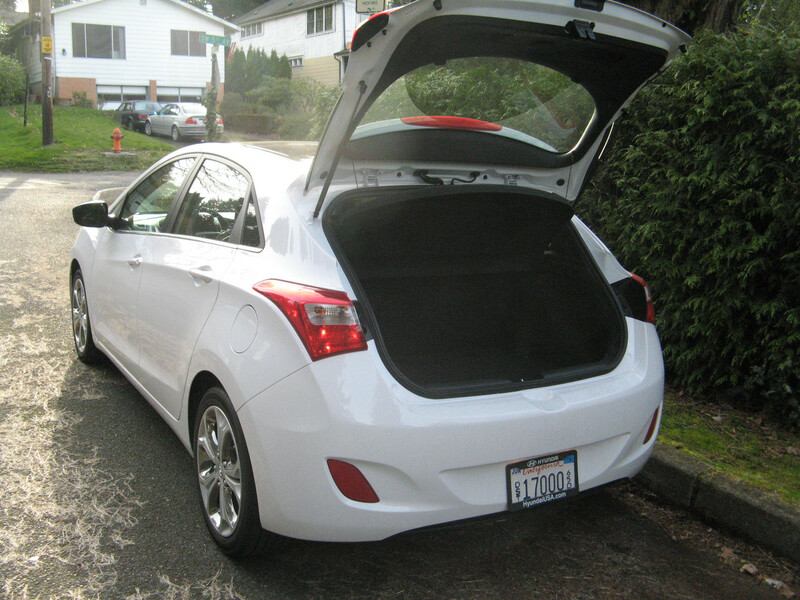 Gripes: Moderate rear space with rear seat up, with 26.1 cubic feet. That’s about the same as the X3, but 20 percent less than the XC60 and 45 percent under the Lexus RX. However folding down the rear seats opens up 61.3 cubic feet which is competitive in the segment. Still has 6-speed automatic transmission while others moving to 8- or 9-speed. Verdict: The fully loaded AWD model is the best buy, costing $5000 less than the Lexus RX, and $10,000 less than the BMW X3. Mid 20s gas mileage on average. The suspension is soft, but dual-valve reactive shocks handle severe bumps well. Luggage space is adequate; if you need more you’ll buy something much larger. The test model was front wheel drive, while AWD costs only about $2,000 more. Why spend $40,000 and not get it, unless you live in Florida? The mileage penalty is insignificant. Likes: After a couple of flubs with the Tribute/Escape, and the slow-selling CX-7, Mazda hit the Crossover ball solidly with the CX-5 which sold 111,450 units last year. Mazda has now turned its attention to a smaller crossover with the new CX-3. It is typically sporty and useful, with positive steering, good handling and firm ride. The Skyactive DOHC 2-liter four-cylinder engine delivers 146 bhp, with direct injection, variable valve-timing and 13:1 compression. Even with AWD it managed a sub 9-second 0-60 mph time. The 6-speed automatic transmission has paddle shifters and the brakes are 4-wheel discs. 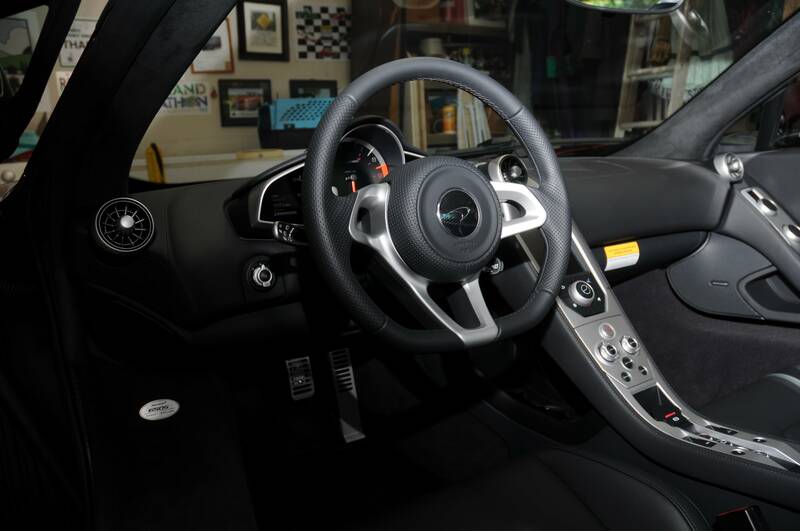 The Grand Touring test car had dual climate controls, heated leather/suede seats and the driver’s seat had 6-way manual adjustments, while the rear seat was split 60/40. The interior was handsomely trimmed in bright contrasting colors and the paint finish typically excellent. Multiple airbags were accompanied by ABS, stability control and hill-launch assist. The stereo was a Bose AM/FM/CD/XM/MP3 with Bluetooth hands-free phone capability and the Nav system benefited from a 7-inch touch screen. Along with blind spot monitoring, the GT I-Activsense package added adaptive cruise control, smart brake support, lane departure warning, rain sensing wipers and high-beam control. Dislikes: Unfortunately the dash followed the misguided design I first saw on the latest MX-5. There was no real speedometer, just a couple of floating numbers, at the bottom of the tach and again in a pointless heads-up display above it. Meanwhile the touch screen projected from the middle of the dash, interrupting a short driver’s view and begging to be accidentally broken off. The technology package costs a whopping $1,950 and falls mostly into the “Huh? Nice gadget” category. The nav screen is frighteningly bright at night until you figure how to turn it down, and correspondingly dark if you turn on the lights in the daytime. Handsome wheels dare you to curb them. 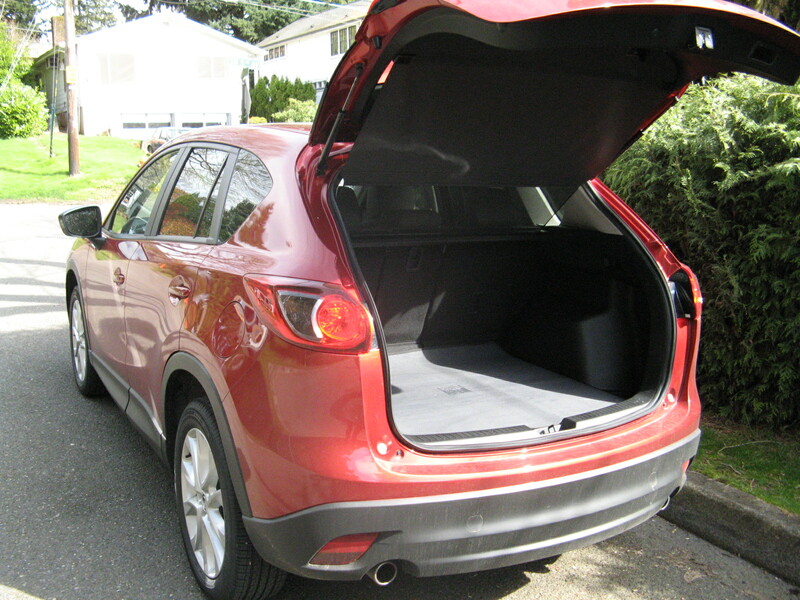 Comparatively, the CX-3 has insufficient luggage space and no back seat room if the front passengers are over 5'5" tall. Verdict: Slicing the market pizza even thinner, Mazda is betting there’s niche under the CX-5 and the bloated Toyota RAV4 and Honda CRV twins. This goes head-to-head with Honda’s new “Harvey” but it’s $4,000 more expensive and quite a bit smaller inside with 44.8 cubic inches with the rear seats folded, against 58.8 in the HR-V. With the back seats up, the CX-3 only has 12.4 cubic feet of storage, and only 10.1 if you get the Bose stereo. Overall, the CX-3 is almost as cramped as the Nissan Juke, though mercifully prettier. Likes: Hotter variation than the original Turbo, but there’s actually a Rally Edition above this. However, this package is $3,000 cheaper than the base Turbo was three years ago. Lively, for a 1.6-liter engine, with 0-60 mph in 6.3 seconds, 0-100 in 16 seconds, via 201 hp twin-scroll turbocharged, direct-injection, DOHC 4-cylinder. Very slick 6-speed manual gearbox big improvement over paddle shift auto, though engaging reverse is practically English, with a pull-up collar. Simple dash, controls easy to understand and use. Projector headlights, four wheel disc brakes. Rear camera is necessary, because of thick C-pillars and high deck. 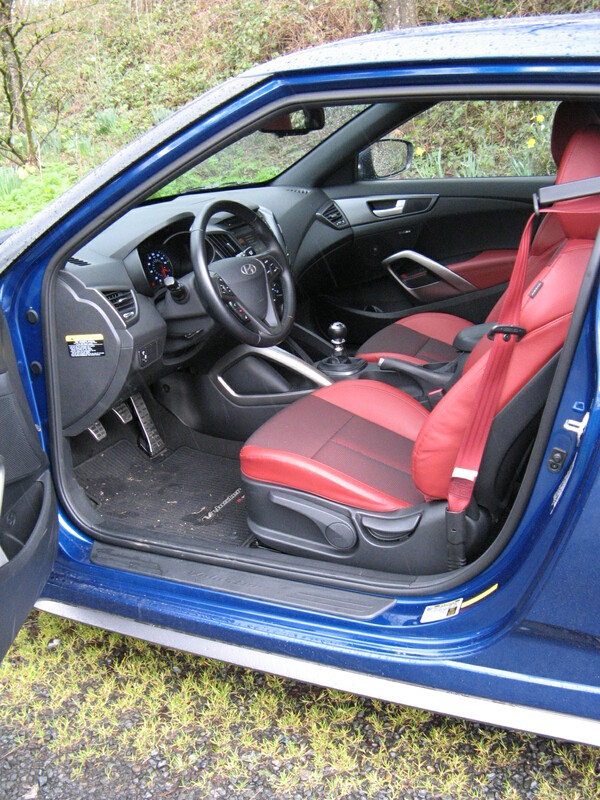 Test car had handsome red leatherette interior. Safety features include multiple airbags and side curtains, traction control, ABS (discs all round), and electronic stability. Superior stereo has AM/FM/CD/XM/MP3 Bluetooth etc., and 7-inch touch screen, 100,000-mile power train warranty and 5-year unlimited mileage roadside assistance. Neat central exhaust at the rear. Rear seat splits 60/40 for genuinely useful space. 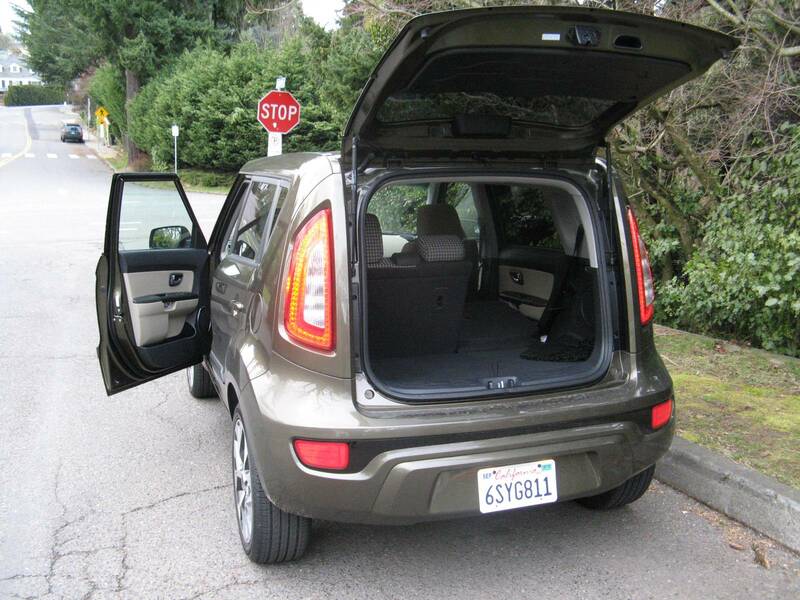 Right hand third door feels like reluctant but welcome solution to rear seat access, which would otherwise be impossible. Gripes: Not as fast as you think, and harsh-riding. Handsome wheels, but $1200 set of Michelin Pilot tires do not look like they last very long and will not protect wheels against curbs. 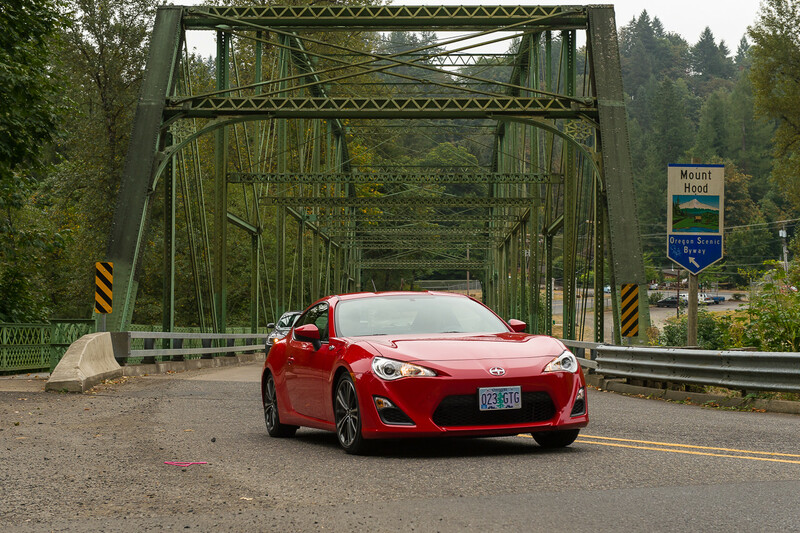 Verdict: Excellent package for the money and about $3,000 less than the Scion FRS and Subaru BRZ twins. Quirky but stylish for what could be just a boxy hatchback. Likes: Elegant sedan whose hybrid is finally redesigned one year late. 193 bhp, 2-liter DOHC 4-cylinder has direct injection and variable valve timing, and is combined with a 38 kw electric for excellent takeoff. 6-speed auto trans is quick-shifting and will delight drivers who dislike droning CVT transmissions used by the competition. Stylish interior is well-finished, controls are simple and obvious and the dash has additional symbols for hybrid functions. Disc brakes all round, dual-zone climate control, multiple air bags and curtains, active head rests and belt pre-tensioners, ABS, traction control, electronic stability, power windows, mirrors, remote locking. Limited package includes leather interior with heated and cooled front seats with memory settings, heated back seats, driver’s seat is 8-way adjustable, passenger side is 6-way. 17-inch wheels are actually protected by tires from curbs, you get xenon headlights, blind spot monitoring and rear cross traffic alert. 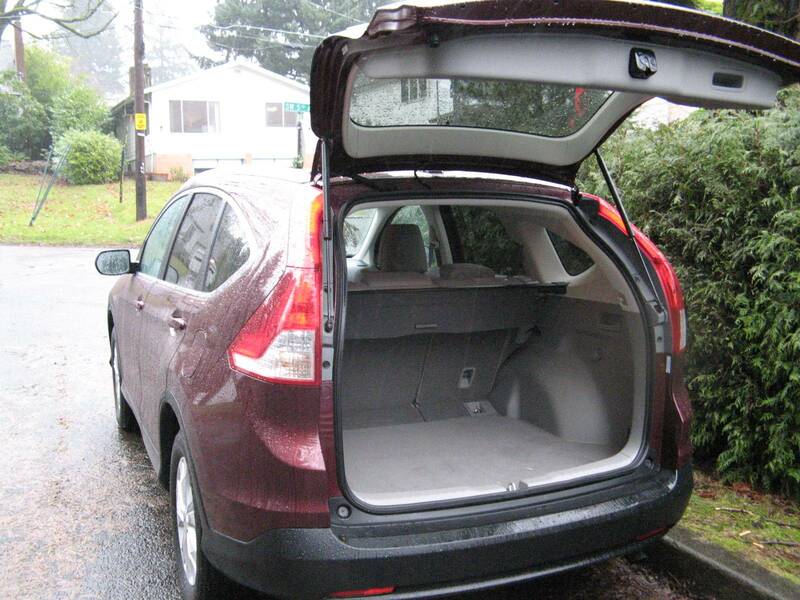 60/40 split back seat is OK for adults and increases 13.3 cubic feet size, which is generous for a hybrid. 7-speaker AM/FM/CD/MP3 XM stereo, Bluetooth. 100,000-mile, 10-year drivetrain warranty. Surprisingly quiet on the highway. Effective Blue Link is Hyundai’s version of On Star. Dislikes: None to speak of, though the non-metallic pale gray-green suits European tastes, like the pale gray which plagued early Audi TTs. Europeans and Japanese like such colors, we don’t. The 5-door hatchback is still a hard sell in the U.S. as well. Verdict: Pretty car, right in the fight in price and performance, with distinctive good looks and fine finish. Solves the “sneak attack” problem of electric cars by providing an engine noise to warn pedestrians when running below 25 mph. Alone among hybrids, the Sonata also gets better mileage on the highway than in the city, thanks to a smaller engine. If you’re shopping, the Honda Accord gets the best mileage at 47 mpg combined, while the Toyota Camry is comparable to the Sonata. 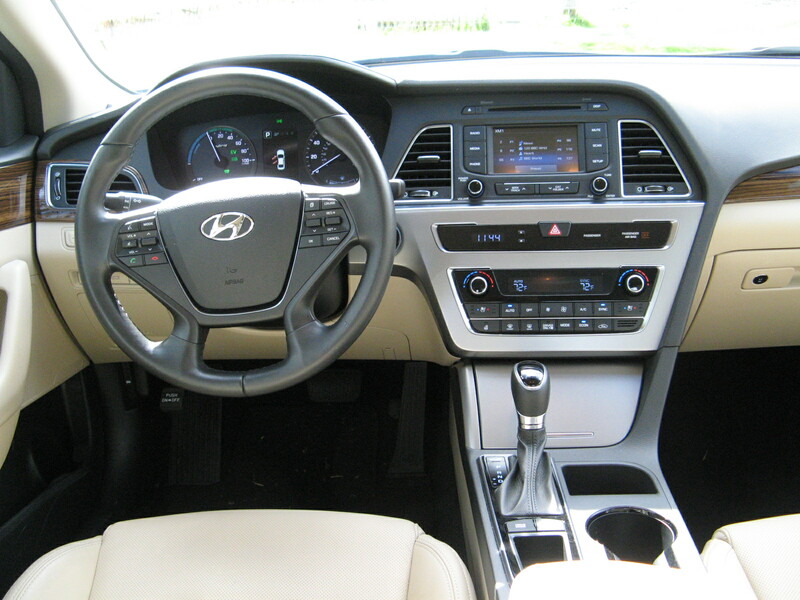 However, both these designs are very dull, while the Sonata is smoothly attractive. In a field where looks usually place last, that’s a solid edge. Likes: Better looking than the last example I drove three years ago. Very nice paint job, handsome 19” mag wheels. 2.4-liter, 189 hp V-TEC, DOHC 4-cylinder engine with variable cylinder management, 10 airbags, vehicle stability assist, brake assist, tire pressure monitoring, pre-tension seat belts, active front head restraints. Handling, brakes and electric steering capable. Collision mitigation, braking adaptive cruise control, lane assist, road departure mitigation. Solid finish, plenty of room, smart instrument layout, dual-zone climate control, power driver’s seat, windows, locks, huge trunk with 60/40 rear seat split, rear view camera. 160-Watt AM/FM/6CD/MP3 radio with SMS text messaging, Pandora and Bluetooth. Will probably last 300,000 miles. Dislikes: I can’t break down the Sport sales last year but I suspect the numbers are minimal. It’s a Plain Jane, with no leather, no heated seats, no navigation, no XM radio and not even a right hand mirror blind spot camera. It’s $8K cheaper than the loaded V6 version, but it’s not fast, has lots of highway noise and the CVT transmission is annoying. Mileage still disappointing; with 23.5 mpg around town, 35 mpg highway seems unlikely. Cloth interior is cheap for an Accord. Unlocking doors to let passengers out is a pain. Mag wheels can be curbed. Verdict: The remains a good lesson in not cutting corners, and I thought Honda learned their lesson in the unsalable 2013 Civic cheapie. The upgraded version of this car is significantly better in all regards and will be much more fun to own. I’d opt for a low-mileage or leftover 2014 V6 and leave this to drivers whose lose arguments with their inner cheapskate. 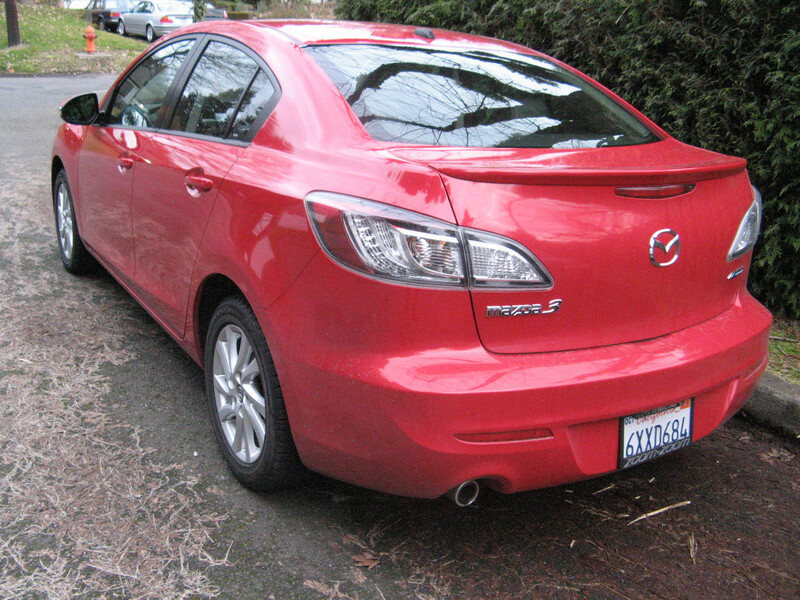 Likes: Mazdas have an individual signature, much like BMW which usually makes them enjoyably driveable. This test car had the larger 2.5-liter DOHC Skyactive high-compression engine, generating 184 bhp but still returning 37 mpg on the highway. The bigger engine is good for 7.5 seconds from 0-60 mph and it’s one of the fastest cars in its class. The economy/performance package revolves around high compression (13:1) and long intakes that go 4-2-1, so that the extra heat can be dissipated. The 6-speed automatic transmission has paddle shifters, with rev-monitoring for downshifts. 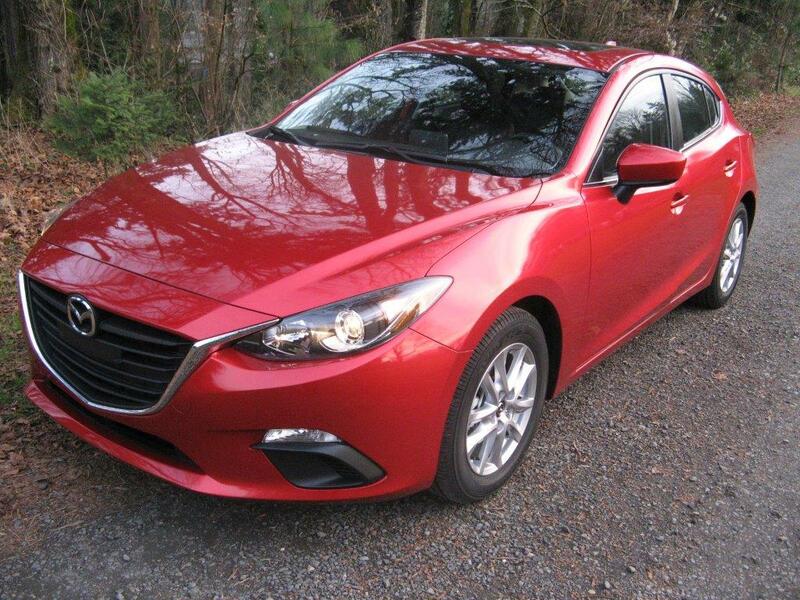 The exterior finish is excellent, and this car glittered in Soul Red metallic paint with a moon roof. Handling is excellent, thanks to front/rear sway bars, the electronic power steering is responsive and there are disc brakes all round. 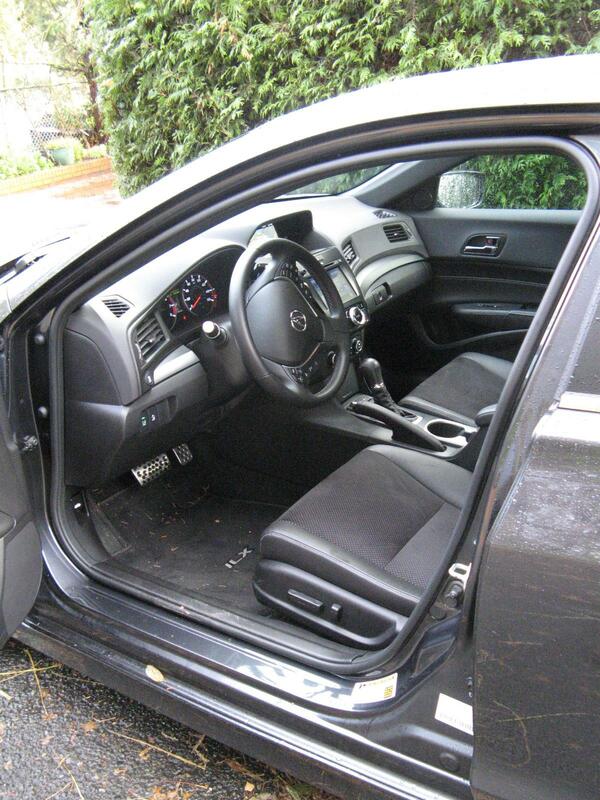 The black and white leather interior is fairly startling, but well-finished, and the front seats are heated. The 7-inch screen included navigation, and the stereo delivers the usual AM/FM/CD/XM/MP3 with Bluetooth hands-free phone capability. 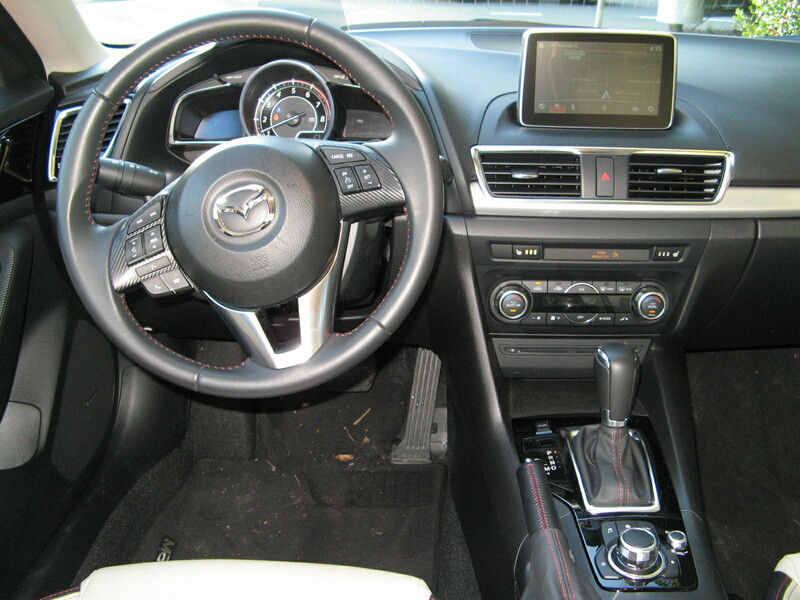 Dislikes: My last review of the 2014 Mazda 3 commented favorably on the simple dash controls. Sadly, somebody could not leave well enough alone. The dash has unfortunately borrowed from the new MX5, with a central screen poking up in the line of sight and fixed in place. Worse, it is also a touch screen for a number of controls. The tachometer is all the driver has in front of him/her, with small double digits bottom right for a speedometer and the same number repeated on a heads-up screen as well (why?). There is no button to turn on the radio anywhere obvious, though an Audi/BMW rotating wheel is placed on the console. Road noise is the usual problem. The appearance package costs a whopping $1,750 for a bunch of plastic add-ons; or perhaps you should buy an old 1990s Protégé as a work car instead? Verdict: As much as I liked this car’s appearance initially, driving it was an exercise in frustration. The counter-intuitive dash layout is as bad as a 1990s GM design, which changed every year and was mostly concerned with not being like everybody else. What ever happened to SIMPLE? Perhaps it’s time to remind the folks at Mazda that the Japanese and German universal dash pattern dates back to 1975. Speedometer and tachometer in front of me. Fuel gauge to the left, temperature to the right. Lights/turn signals on left stalk; wiper/washed on right stalk, three climate control wheels on the center console - that you only have to look at once. Fan speed, temperature, mode. Put the other controls where you like, but let them be something I can find by touch after the first or second time. Or is this part of a plan to make me WANT a self-driving car? Sometimes I wonder. Likes: Redesigned in 2014 the Forte is available as a sedan hatchback or coupe (that is Koup). The Koup SX is the subject of this test and it’s very well equipped for the price. The 1.6-liter turbocharged DOHC, 4-cylinder engine has direct injection and delivers 201 bhp with a satisfying rush, managing 0-60 mph in 7 seconds. The six-speed automatic transmission has paddle shifters and returns 30 mpg highway, and the car is fitted with 4-wheel disc brakes. Basic equipment includes multiple airbags, anchors and tethers for children, ABS, traction control, electronic stability, hill start assist and tire pressure monitoring. The interior features air conditioning, power windows and doors and AM/FM/CD/MP3/XM, USB and auxiliary jacks Bluetooth, push button start with a smart key, cruise control and a tilt-telescope wheel. Outside there are LED lights, fog lights, power folding outside mirrors with turn signals and puddle lights beneath them. 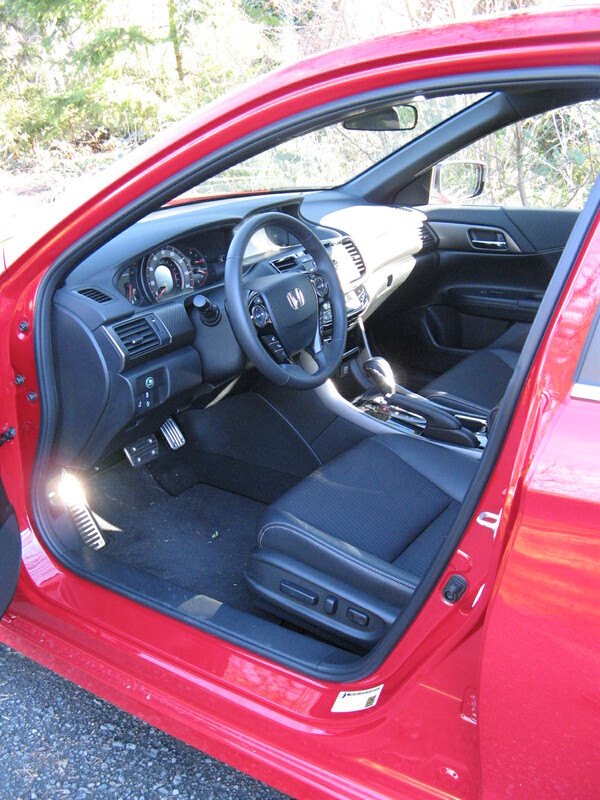 The SX package includes power tilt/slide sunroof, heated leather seats, with the driver’s seat also cooled. The steering wheel is also heated. 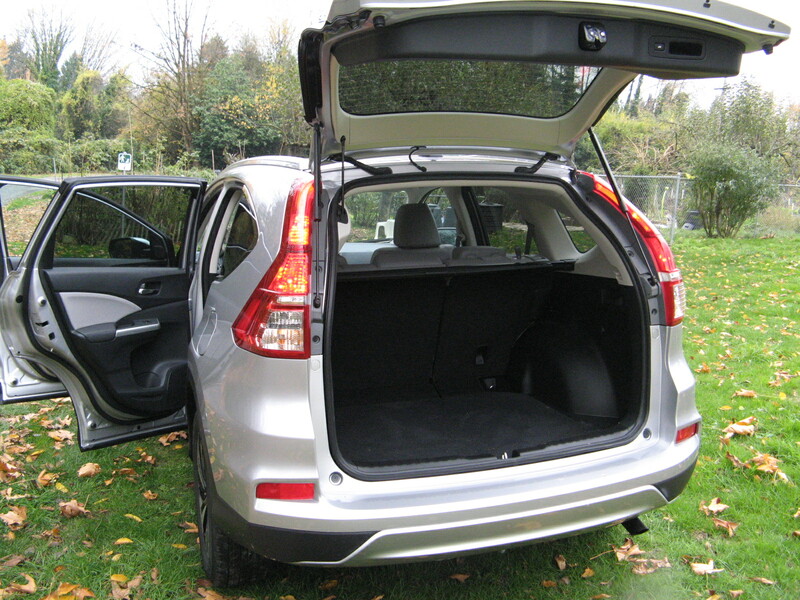 The rear seats splits 40/60 and folds for a useful carrying space. The SX technology package includes xenon headlights, dual zone climate control, navigation system with Sirius traffic, rear camera and 4.2-inch color screen. 10 year 100,000 power train warranty; 5-year 60,000 mile basic warranty and roadside assistance. Gripes: There’s a firm ride and then there’s a hard one. This is definitely hard, and winter chuckholes hidden by puddles left me concerned that I’d bend a wheel. The SX package costs $1,900 as does the SX Technology package. Yet the car is so reasonably priced at $21,590 in base form, it’s hard to see why they don’t just throw everything in for $25,000. Verdict: Kia has a solid hit with this car. It’s excellent value for money and more stylish than the rather bland Honda Civic. Sales jumped 10,000 to almost 79,000 units in 2015, but there’s no breakdown on how many are Koups. This is a legitimate contender in its class and well worth a test drive. 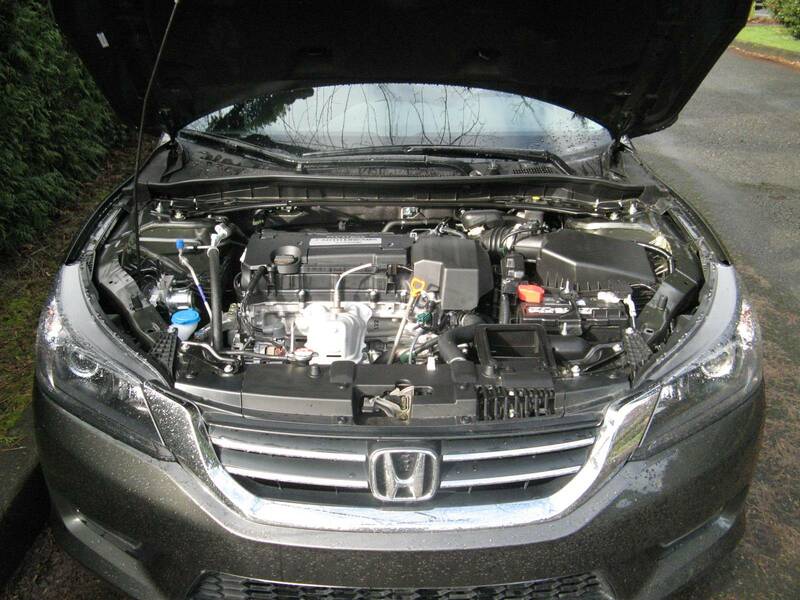 Likes: Brand new baby crossover from Honda is based on the Fit chassis. As the CR-V keeps on getting bigger and the Pilot is now huge, Honda reckons there’s a gap at the bottom of the market. And they may be right. The HaRVey is small enough to be convenient, economical enough that gas can double in price and you still won’t care, and smart enough to make very good use of its available space. It’s powered by a 141 bhp 1.8-liter SOHC 4-cylinder with variable valve timing. The AWD version was the test vehicle and only available with continuously variable transmission, but it works more quickly than some, and it has paddle shifters for fidgety drivers. Mechanically the HR-V has 4-wheel disc brakes multiple airbags and side curtains and a rollover sensor. It has stability assist, ABS brakes, brake assist, electronic brake distribution and a tire pressure monitor. Power door mirrors are heated The seats are leather, as is the steering wheel cover, and the 7-inch touch screen has navigation with voice recognition. The stereo is AM/FM/HD/XM/HD traffic, Bluetooth hands-free, Pandora interface and SMS text messaging. There’s a rear camera, lane watch, auto climate control with pollen filters and heated front seats. The back seat splits 60/40 and fold flat. 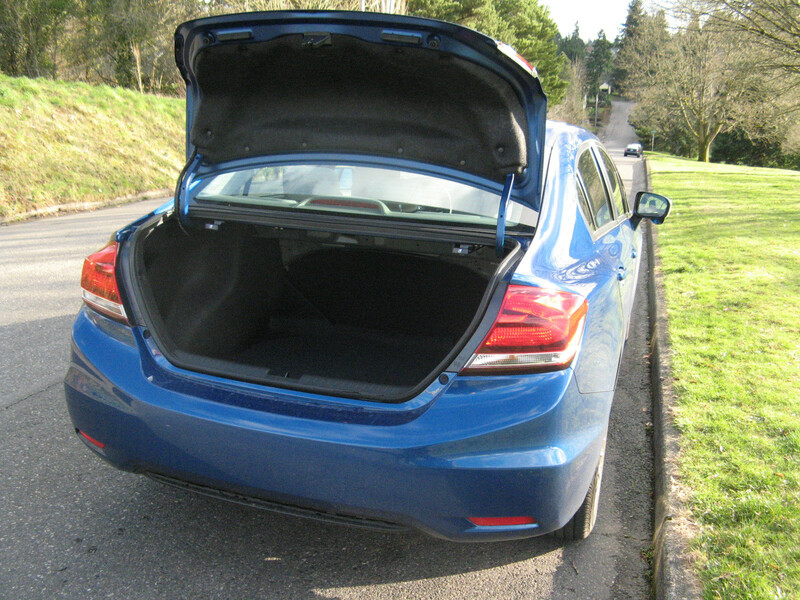 With the back seat up the trunk is 23 cubic feet, which rises to 57.6 when the seat is down. Excellent all-round visibility. Deep central console is very convenient. Handles well, pleasantly neutral, with electric power steering. Dislikes: No radio knob is annoying, as is the touch screen generally. The steering wheel could use more adjustment. Horsepower is marginal with 4WD, and towing limited. CRV transmission is noisy and at 0-60 mph in 9.7 seconds it is not fast. I’d rather have a conventional handbrake instead of an electronic one. Verdict: Honda seems to have put its finger very neatly on a new category, and for the first time that I can remember, I’d actually buy one of these. All-wheel drive really ices the deal here, and at a very competitive price. If you REALLY don’t need anything as big as the new CR-V, buy a HaRVey and take a world trip with the $10,000 (that’s right) that you’ll save. Go on, give yourself permission. How many more summers have you got? Likes: 3.5-liter, 278 hp V-TEC, V6 with variable cylinder management does 0-60 mph in 6.1 seconds, with lovely 6-speed manual. Styling tweaked to be a bit more aggressive and body stiffened. Highway noise diminished somewhat. 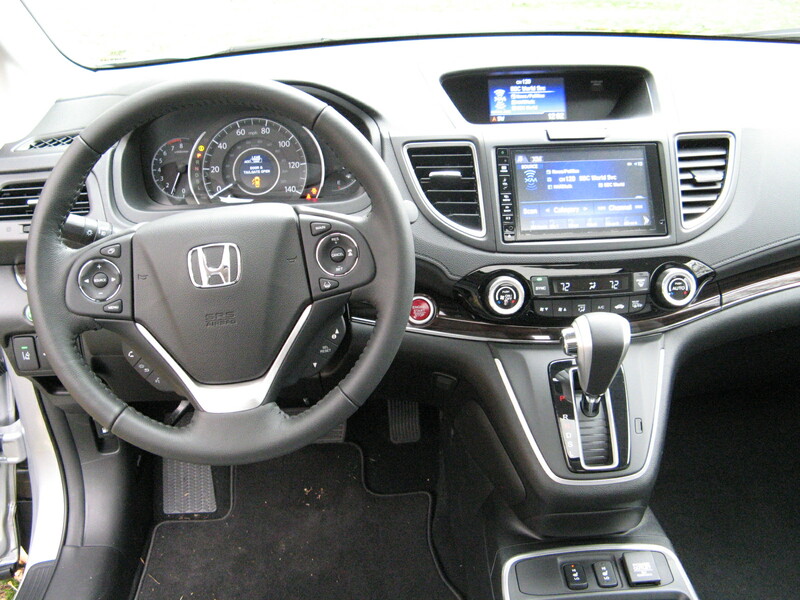 Honda’s touch screen compatible with Android and Apple CarPlay enabling a number of apps to be used. Adaptive cruise control, lane departure warning, 10 airbags, vehicle stability assist, electronic brake distribution, tire pressure monitoring, pre-tension seat belts, active front head restraints, rollover sensor with side bags. Simple dual-zone climate control. Handling intuitively capable, brakes excellent. Superior interior finish, smart instrument layout, heated leather seats, huge trunk, 60/40 split rear seat and pass-through, decent navigation, with voice recognition, rearview camera and lane-change camera on right mirror, when turn signal is used. Stereo offers seven speakers, AM/FM, 6CD, MP3, XM, Pandora, and Bluetooth. Dislikes: Adaptive cruise control quick to brake, slow to speed up, and can’t be turned off. Tires barely protect rims from curbs. No volume button for stereo. Belt line too high for your elbow, armrest too low. Rear seat cramped with restricted vision. Rearview camera vital with high trunk. 18 mpg no longer competitive, but if gas prices stay low that may not matter. Verdict: Still very competitive in its segment, but with niggling annoyances. You might buy a sensible sedan, but a sports coupe needs more pizzazz to be an emotional purchase. It’s a good car in many ways, and it will probably go 300,000 miles, but it’s not a great one. As long as Hyundai and Kia are taking styling chances, Honda must do the same. Likes: The Kia Sorento remains the company’s #3 best seller, with 103,377 sold through the end of November 2015, trailing only the Optima sedan and Soul compact wagon. It’s larger than the Toyota RAV-4 and Honda CR-V, and the optional third seat has room for adults. 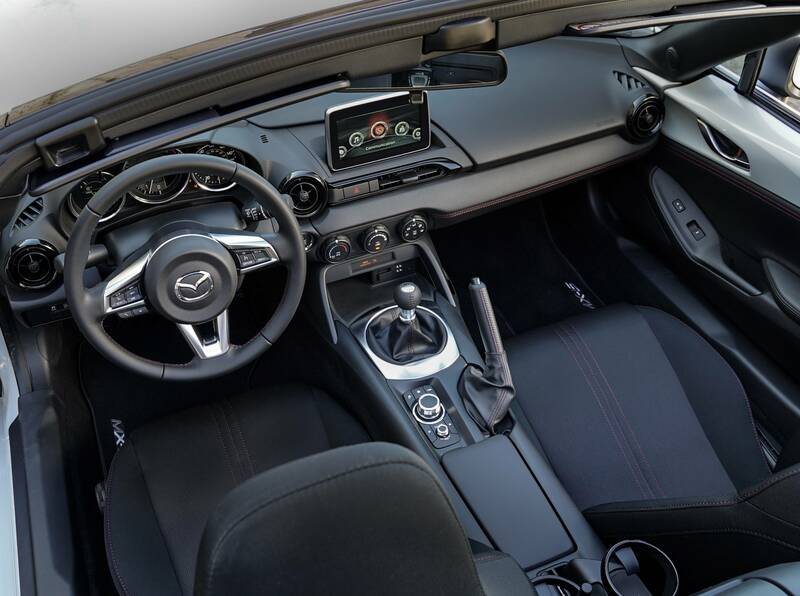 The 2016 model gains an extra 2 inches of legroom in the back and wheelbase is 3 inches longer. The biggest engine is the 290 bhp 3.3-liter V6, but the test vehicle had new turbo-charged 2-liter, 4-cylinder engine, generating 240 bhp, thanks to direct injection. With the weight of all-wheel-drive, 0-60 is 8.7 seconds, with a 6-speed automatic transmission and Sportmatic manual shifting, and the AWD has a center locking differential. Safety features include front and side airbags and curtains and active headrests. 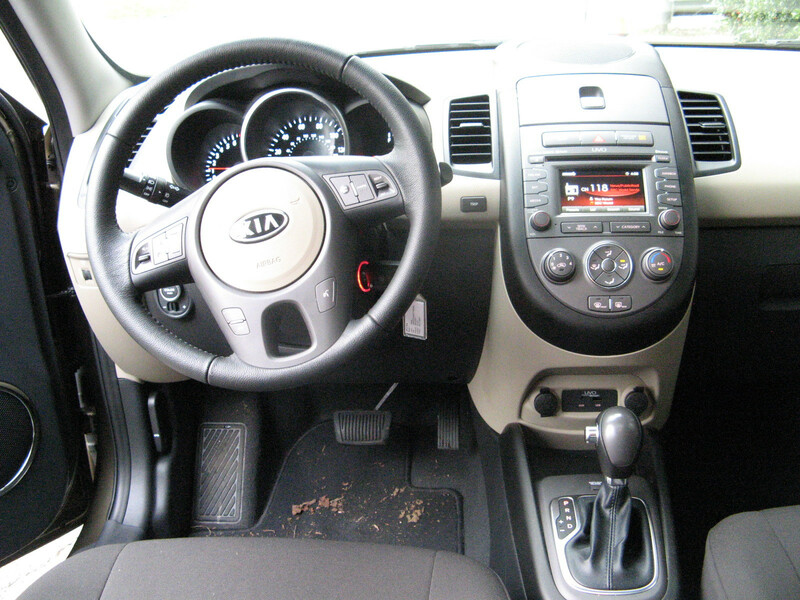 Major changes have occurred in the interior, with two-tone colors, while hard plastic has been replaced by softer materials. It’s quiet at speed, with capable handling, excellent steering, and brakes. Infinity stereo/CD/XM/MP3 Bluetooth, etc. 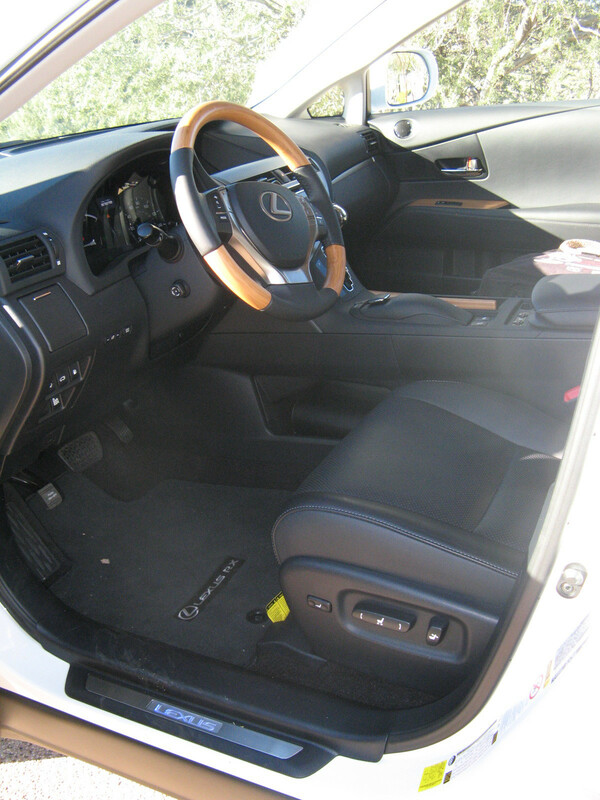 Leather seats; the front ones are heated and ventilated. Straightforward navigation system, backup camera, power folding mirrors. Dual zone climate control, panoramic roof with power sunshade, power lift gate. Technology package costs $2,500 but adds lane departure warning, forward collision warning, intelligent cruise control and surround view monitor, whose cameras offer various combinations of blind spot vision. Gripes: Bigger than you think when it comes to parking. Mileage is marginal with the extra weight of AWD, and you’ll be working the Turbo 4-cylinder hard. You might want the V6 for towing capability. Verdict: With a starting price of $41,700, this is AWD model is aimed squarely at the best-selling Toyota Highlander, and was reportedly modeled on the Jeep Grand Cherokee. 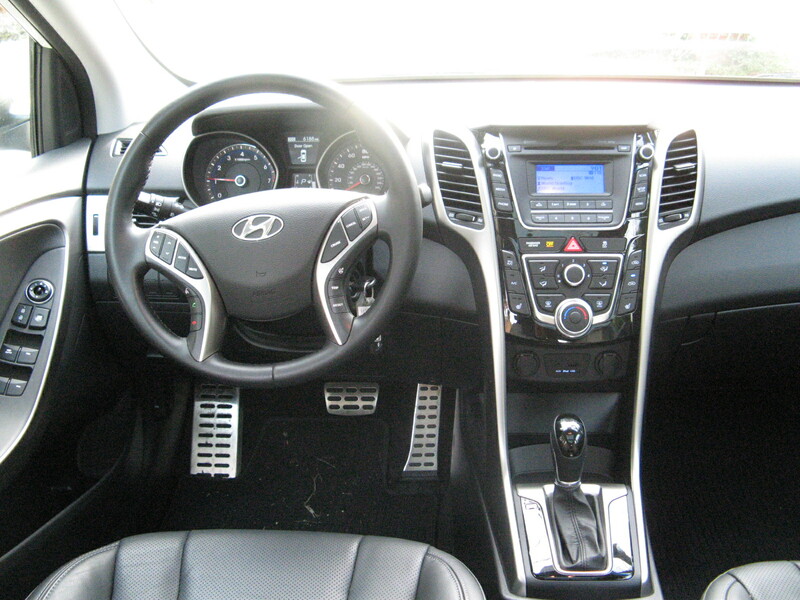 It’s a significant step up for the Sonata, and competitively priced. If you’ve outgrown the Subaru Outback, Toyota RAV-4 or Honda CR-V and still think the Highlander is too big, this might be your niche vehicle. Likes: Considering how old this body style is (around 10 years now), it’s held up quite well, as far as appearance and performance. The larger 2.4-liter, twin-cam, 4-cylinder with variable valve timing provides 168 hp, which is enough, and the grille mirrors the discontinued EVO. Simple climate controls, AM/FM/XM/CD, Bluetooth enabled and MP3. Multiple airbags, ABS, traction control, air-conditioning, power windows/mirrors and remote locks, cruise control, 6-way driver’s seat, 4-way passenger’s seat and back-up camera. Navigation Package adds a 7-inch touch screen, real time traffic and 3D mapping and leather seats, Rockford-Fosgate 710-watt stereo, auto-off HID headlights, rain-sensing wipers and power moon roof. Rear seat folds and splits 60/40. Dislikes: Annoying CVT saps power, even though it has paddle shifters and thinks it has real gears. Gas mileage averages only 26 mpg, which would have been OK in 2007. GT model’s 18-inch wheels do not help road noise, though it’s still better than Honda. Interior is hard plastic, which might be OK on the EVO, but this is supposed to be more sophisticated. Trunk barely adequate at 11.8 cubic feet. Navigation package is nice, but at $5,150 it had better be. Verdict: Without the SE’s AWD, or the Ralliart’s turbocharged power, the GT comes up short. Most people will buy a Subaru if they want AWD, and a Toyota Camry or Honda Accord if they want a sedan with high 30s highway mileage. Kia and Hyundai offer more attractive comparables, and time has passed the Lancer by. Without the EVO as a halo car it’s hard to see why Mitsubishi stays in this market. On the bright side – and believe it or not there is one – the Lancer GT I drove indicated 18,000 hard-used test miles, and it appeared to have held up very well. Likes: Underwhelming 150 hp engine is gone and only the 201 bhp DOHC 16 valve 2.4-liter 4-cylinder is available. OK on power now, but 8-speed dual-clutch transmission with paddle shifters is big improvement over 5-speed auto and even has a torque converter for smooth starts. Chassis stiffened to be more sure-footed, body design sharpened, with jewel-eye strip of LED headlights. Four-wheel disc brakes, traction control, stability assist, 10 air bags, dual-zone air conditioning, moon roof, navigation with voice recognition, heated power mirrors, power seats and windows, keyless entry. Leather seats with suede inserts, heated front with 8-way driver seat. Decent stereo with AM/FM/CD/XM/MP3 Bluetooth USB interface. Tech package includes central touch screen, navigation, multi-view rear camera, collision warning, lane departure alert and intervention, adaptive cruise control. Handsome 18-inch mag wheels. Gripes: Still noisy at highway speeds. 30 control buttons far too many. Interior quality below competitors, with much hard plastic. 25 mpg not impressive in this category. No spare tire (try fixing a cut sidewall with a bottle of goop). 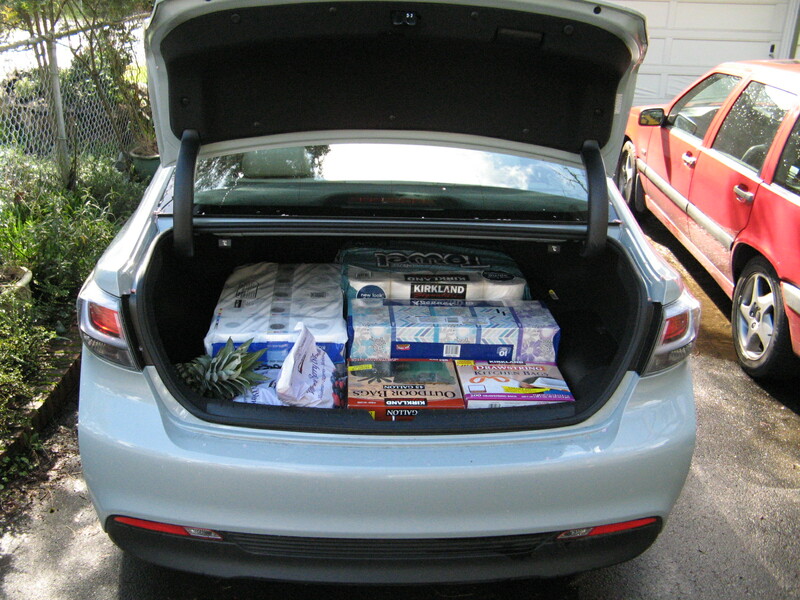 Trunk average at 12.3 cubic feet. 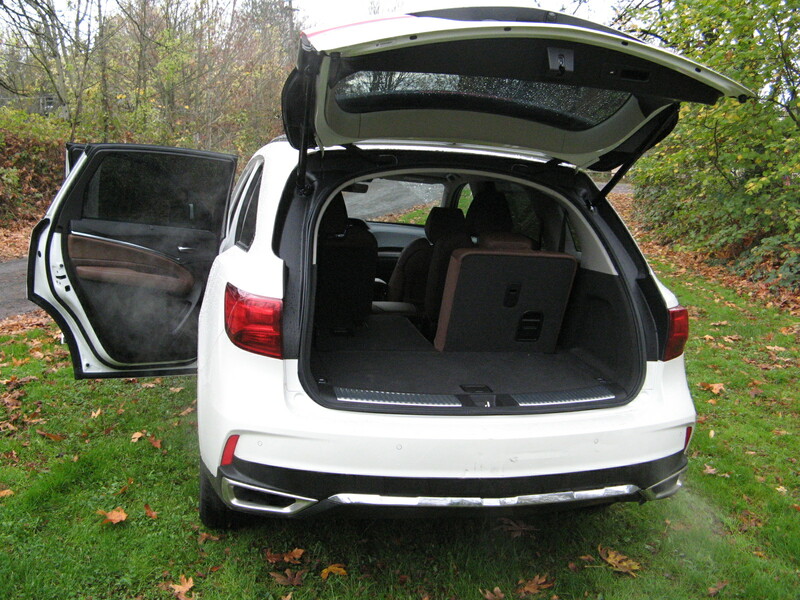 Rear seat folds but does not split, so no passengers back there if you have a big parcel. Verdict: Dear me, some of my notes from 2013 still apply. 40 mpg is the new 30, and when bigger cars like the Honda Accord get the same mileage as this, and the comparative Toyota Corolla gets 42 mpg, somebody at Acura was surfing the web during office hours. Tweaking the Civic (this body in Europe) won’t cut it. It needs a rethink as extensive as the Fit; the bar in this category has been raised a lot. As a Civic this would cost about $26,000. Would you pay $36,000 for a Honda Civic? I thought not. Me neither. Buy an Accord or a Camry; have more room and decent resale too. Likes: Hyundai completely overhauled the Tucson for 2016 and came up with a larger more competitive offering in the small SUV class. While the 2WD version starts at a thrifty $22,700, the Limited AWD test model had a list of options as long as your arm – some of which aren’t available on the competition. The 175 bhp turbo-charged, direct injection engine displaces only 1.6 liters, but 195 lb feet of torque kicks in at 1,500 rpm and the 7-speed dual-clutch transmission shifts quickly and smoothly. All-wheel drive includes active on-demand system with locking central diff, manual override, cruise control and tilt-telescope wheel. Safety equipment includes stability/traction control, downhill brake control, hillstart assist, multiple airbags, seatbelt pre-tensioners, active head-rests and rollover sensors. Excellent disc brakes all round, suspension is now more sophisticated. AM/FM/MP3/XM/CD with iPod and USB jacks and Bluetooth hands-free phone and 8-inch color touch screen. Dual climate controls, push button start with smart key, rear view camera, blind spot detection and rear cross-traffic sensor, hands-free liftgate. 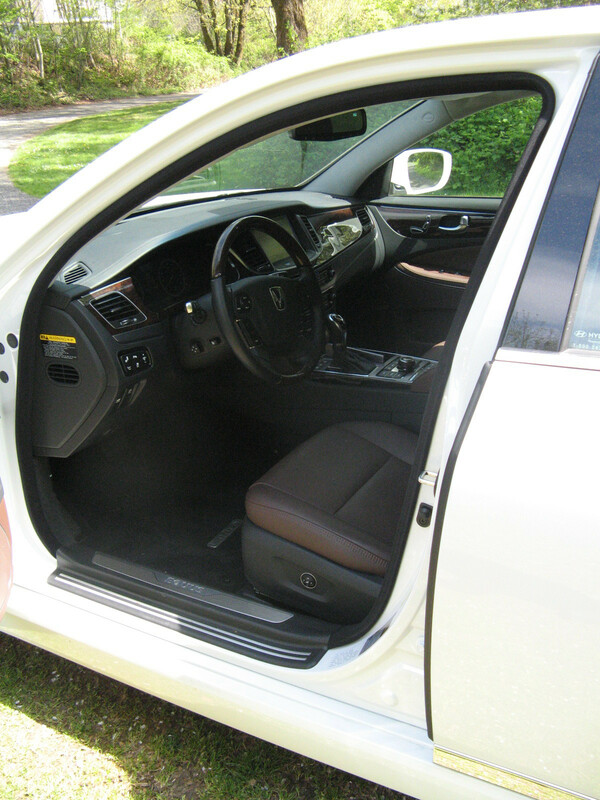 Limited package includes leather interior, heated front and rear seats seats with power driver’s seat and lumbar support. Rear seats split 60/40 and recline. 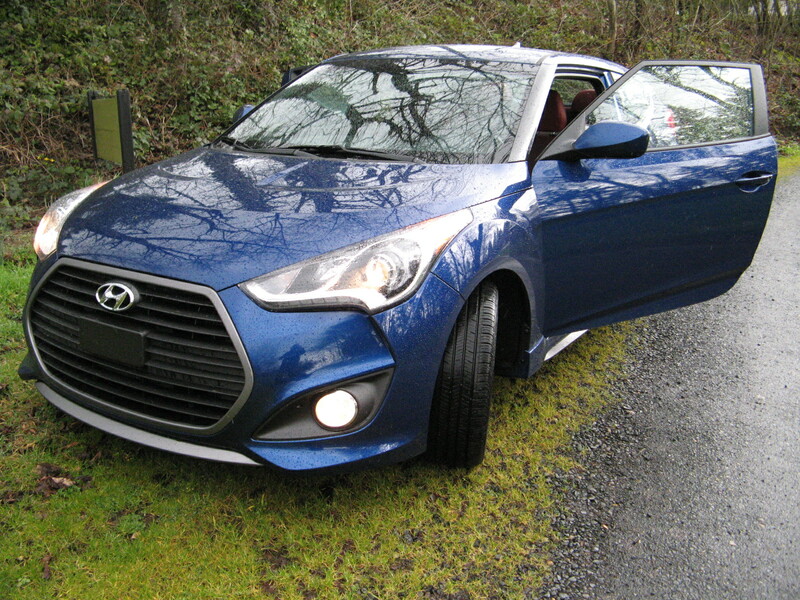 Ultimate package includes adaptive xenon headlights, rear parking sensors, panoramic sunroof, an upgraded gauge cluster with a color trip computer, heated/ventilated front seats, heated rear seats, lane-departure warning and forward collision system with pedestrian sensor and automatic braking. Now up to 31 cubic feet storage with rear seats up, 62 cubic feet with seats down. Auto-dim mirror, cargo cover, heated mirrors. 10-year, 100,000-mile power train warranty, with 5-year roadside assist. Gripes: Handsome 19-inch mag wheels could use wider tires to protect them from curbs. 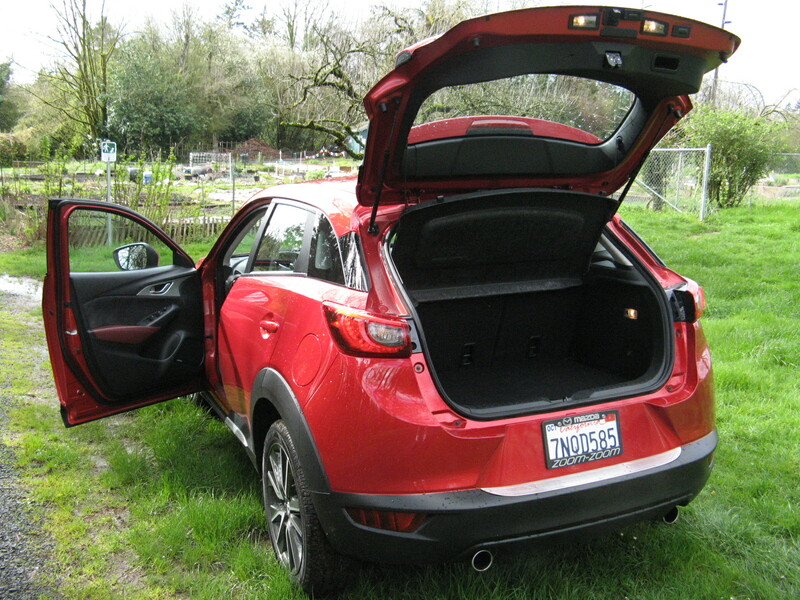 Verdict: Comparison shoppers should check out the Mazda CX-5, Toyota RAV-4, Honda CRV, Subaru Outback and Ford Escape, especially if they want more interior space. But the Tucson is faster than you expect, and easy to live with. It represents excellent value, with the highline Limited offering options usually found on more expensive models. Likes: The benchmark for small SUVs and the segment leader for 10 years, with 288,531 sold through October 2015. That’s 30,000 ahead of Toyota’s RAV-4, 50,000 ahead of the Nissan Rogue and three times Mazda’s CX-5 sales. The 2016 CR-V’s top-line Touring model has leather seats, power tailgate and every single bell and whistle you can imagine, including lane-keeping assistance and adaptive cruise control. Push-button start, 185 hp, 2.4-liter DOHC 16-valve, 4-cylinder engine with variable valve timing, and continuously variable transmission. Full-time, intelligent all-wheel drive, multiple airbags, dual stage airbags, side screens, rollover sensor vehicle stability assist, electronic 4-wheel disc brake distribution, brake assist, tire pressure monitoring. Dual-zone climate control. Handling, brakes and steering are intuitively capable, includes adaptive cruise control, lane departure warning, blind spot monitor. Intelligent use of space inside with simple controls, heated leather front seats, huge storage area with covered rear, 40/60 split rear seat, rear heater/cooling vents, rear seat folds flat. Decent navigation, with voice recognition and rearview camera. 7-inch info screen, HD AM/FM/6CD/MP3/XM radio, Pandora, blue tooth, USB interface. Dislikes: No radio knob is annoying, as is touch screen generally. Steering wheel could use more adjustment. Horsepower marginal with 4WD, and towing limited. Verdict: The compact SUV segment remains competitive but this is still the best bet, with excellent resale and moderate maintenance costs. Redesign is more aggressive, though that’s a bit like having a fierce poodle. Lots lots of interior space, and will last for 250,000 miles. Some buyers will balk at no 3rd seat and modest power output. Likes: The last generation of Mitsubishi’s original mind-blowing, street-legal rally cars - the scourge of Subaru WRX drivers. Time has passed it by (and the Evo VIII was quicker), but it still has the bones of a bonafide muscle car. Turbo-charged, DOHC 16-valve 2-liter 4-cylinder engine cranks out 291 bhp, and returns 0-60 in 5 seconds. Top speed is electronically limited to 155 mph, but tuners can double that horsepower and see 175+ mph. Rack-and-pinion steering, MacPherson strut front, and multilink rear suspension. Six-speed, twin-clutch, paddle-shift Sportronic transmission; properly described super all-wheel control (S-AWC) and a balance switch on the console which varies power distribution front to back. Nifty yaw control figures out which wheel is slipping, and balances power delivery on each axle. 13-inch Brembo discs stop it like it goes - quickly. Simple, triple-wheel climate controls, Rockford-Fosgate AM/FM/XM/CD, Bluetooth enabled and MP3. Multiple airbags, ABS, air-conditioning, power windows/mirrors and remote locks, cruise control. Dislikes: Jerky power delivery at light throttle. Dismal gas mileage for these days – about 16 mpg. Hard plastic finishes inside, and primitive dash controls. Relatively useless 7 cubic-foot trunk cramped by sub-woofer. No rear camera, no nav. Vital Recaro buckets replaced by slippery leather lounge chairs for fat people. Where’s the huge wing? Who wants to be anonymous? Verdict: This is the end of the line. With 1300 Final Editions bound for the U.S. with a 5-speed stick, Mitsubishi lowers the curtain on its muscle car. One wonder how many the company could have sold if they’d just built more, instead of those dismal Lancer airport rental cars. The Evo’s time is already past, but really good survivors will always command a premium. Don’t you wish you’d kept your 1970s Pontiac Trans Am, Dodge Challenger T/A, Chevrolet Camaro Z/28, or Ford Mustang Boss 302? Don’t you STILL talk about it? I thought so. The rush is unforgettable. In a free and frank exchange of views, I differ with Jeff’s evaluation of the 2016 Mazda MX-5 (which is several reviews below this one). There’s a lot to like about the new car, but at heart it’s derivative, while the old model was – literally - a breath of fresh air. 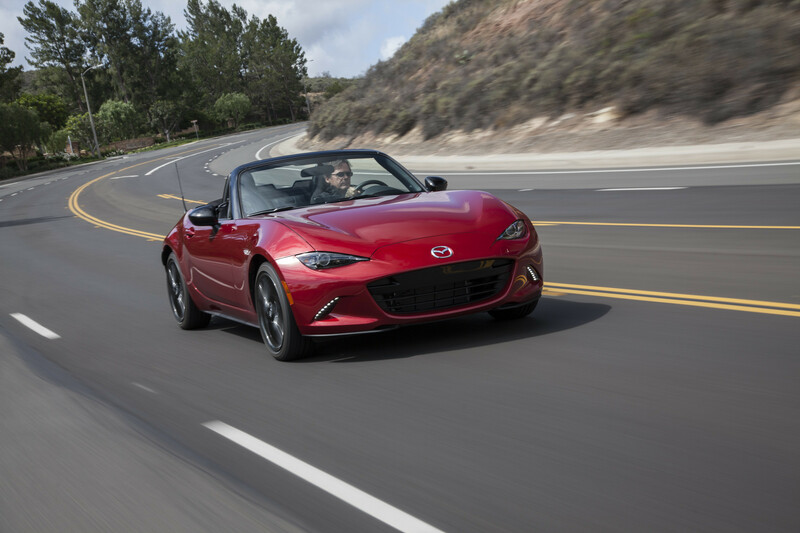 Likes: The new Mazda MX5 Miata is a complete departure from the 25-year-old original models. It is lighter, bigger, faster, and more economical, with a 155 bhp 2-liter, DOHC 4-cylinder engine, now set 2 inches further back to improve balance. The 6-speed manual gearbox is even slicker than before, the one-handed manual top even better, folding down “top up” instead of inside-out, as usual. It has a single latch, and a pre-load spring, so when you unlock it to raise it, it pops up to your hand and is balanced so it can be closed easily. The test version was the top-of-the line Club with navigation in the 7-inch screen, Brembo brakes, Bilstein shocks BBS 17” forged wheels, posi-traction and spoilers front and rear. 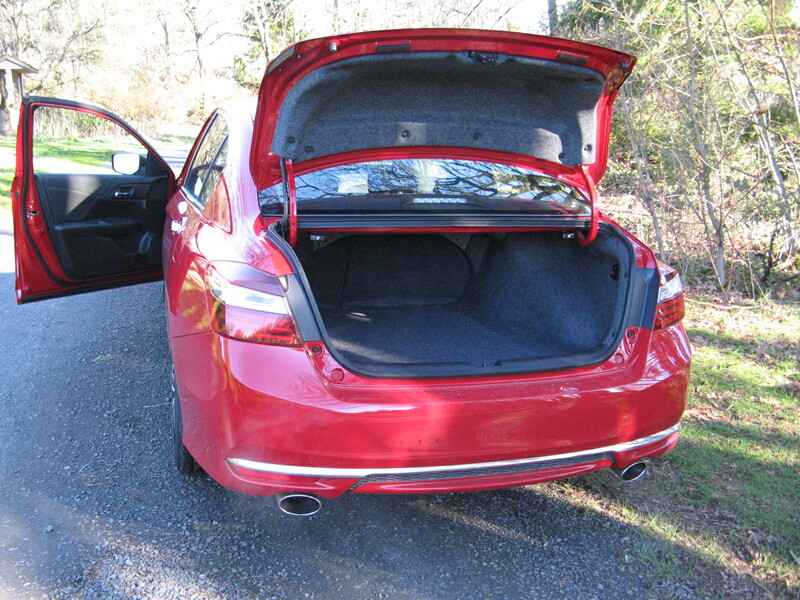 The trunk appears larger and deeper, without a spare wheel taking up space. Power windows accompanied power door locks. Power rack-and-pinion steering is now electric and more neutral, with traction control and dynamic stability. Safety equipment includes multiple airbags. AM/FM/MP3/XM/CD with iPod and USB jacks. Automatic climate controls, push-button start with smart key. Gripes: Car is two inches bigger in every direction than original model, but interior is claustrophobic, with lower seats and higher beltline. The dash actually seems closer than outgoing model. No glove box in dash, and space between/behind seats is unreachable while driving. 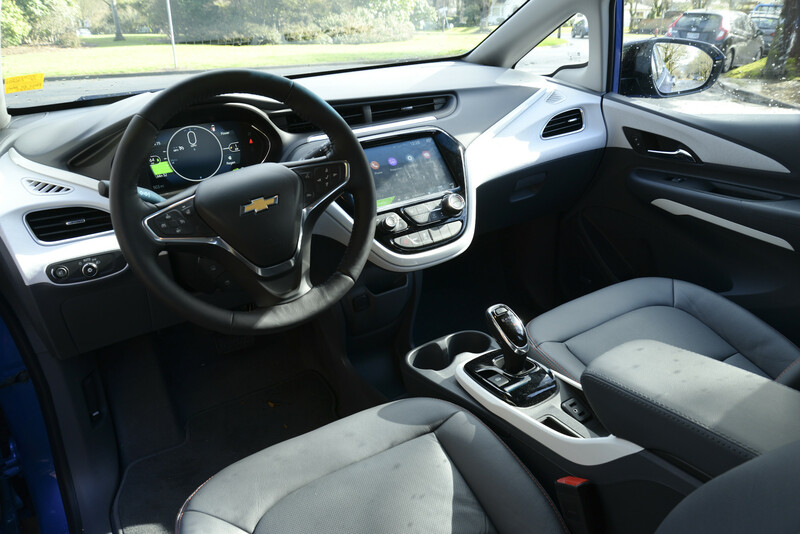 All electronic functions except climate control performed on 7-inch central screen, which is clumsily perched on dash and does not fold, retract or remove, asking to be broken off. It begs to double as an electronic rearview mirror, which could at least show you what’s inside the storage compartment. The cup holder is behind the driver’s elbow. No spare tire, and tire pressure warning light offers little comfort. Fix-a-flat bottle will not plug a cut sidewall. Optional front air dam lower than supermarket parking blocks. Verdict: OK, here’s where I break from my colleagues. This design is a shameless rip-off of the Jaguar F-type, from the nose to the taillights. Trouble is, it’s too short, looking like a weigh lifter who’s 5 feet 5 inches tall and weighs 250 lbs. The overall impression is that it’s trying to sneak up on the BMW Z4 market, lacking only a couple of swoops on the outside and a much more sophisticated interior. Separating basic dash controls into steering wheel and console means taking your eyes off the road for many functions. The central screen is annoyingly intrusive and actually detracts from the driving experience. Thankfully my wife still has a 1994 R-Type, whose jaunty insouciance, trim size and simplicity remind me why the basic design lasted for 25 years, and sold almost 1 million examples. Don’t expect this to be around that long. Likes: With the 2013 model, Acura’s RDX grew bigger, taller and simpler – and doubled its sales. 2016's 3.5-liter, 279 hp SOHC i-VTEC V6, now pulls it to 60 mph in 5.8 seconds – which was sports car territory not too long ago, and pretty stunning for 4,000 lbs. It’s been refreshed rather than redesigned, and still has the shiny beak (though smaller) and an array of LED headlights, running lights and taillights. It’s smaller than the MDX, but sells nearly as well against a strong market, which includes the Audi Q5, BMW X3, Mercedes-Benz GLK and Volvo XC60, and now has a simpler AWD system. Paddle shifters work a 6-speed automatic transmission, if you’re fidgety; there are ABS disc brakes all-round, stability assist, electronic brake distribution. Instruments are clear, the dash simple, controls obvious, active noise dampening fairly effective. 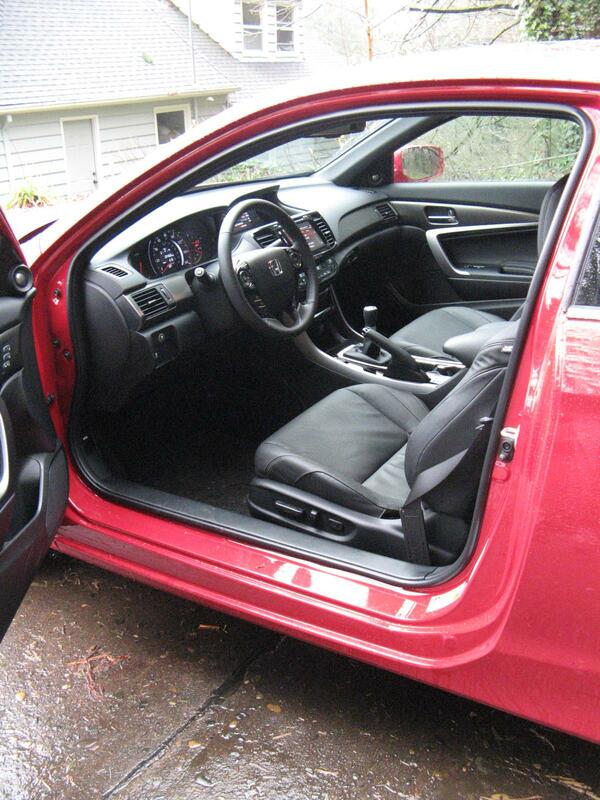 Leather interior, power/heated and cooled front seats, with driver’s memory. Dual climate controls, one-touch windows. Numerous air bags, self-tensioning belts, side curtains and rollover sensor, active headrests, power tailgate, rear camera. More legroom than the X3 with an extra two inches front and back. Technology package gives you two screens, though some functions are shared. Excellent voice recognition navigation with real time traffic and weather, multi-angle camera and rear cross traffic monitor, 10-speaker surround-sound stereo/CD/XM/MP3, XM USB, blue-tooth etc. AcuraWatch Plus Package includes adaptive cruise control, collision warning, auto braking and lane keeping. Gripes: Not as much luggage capacity as its competitors, with 26.1 cubic feet. That’s about the same as the X3, but 20 percent less than the XC60 and 45 percent under the Lexus RX. Deactivated cylinders help highway mileage but direct fuel injection is inexplicably lacking and would make it even quicker, and probably more economical. Verdict: Extremely competitive in its segment. 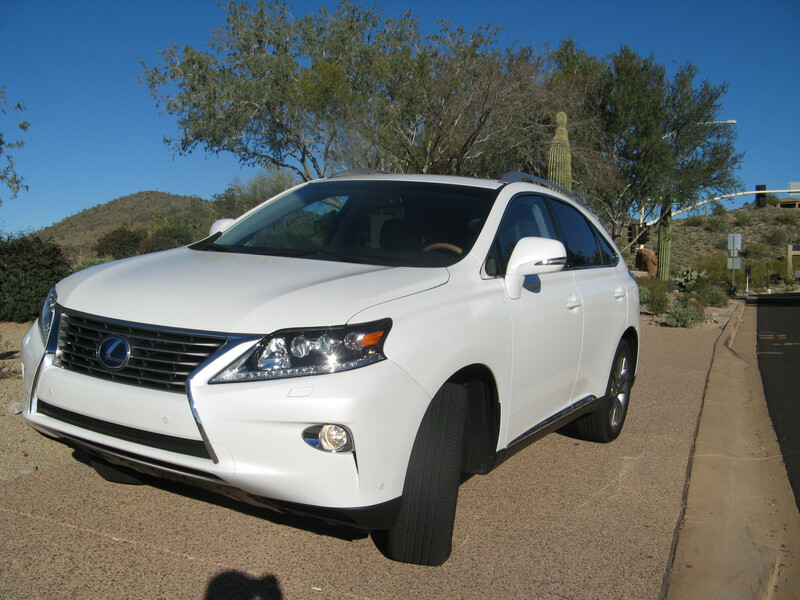 The fully loaded test model is the best buy, costing $5,000 less than the Lexus RX, and $10,000 less than the BMW X3. I scored 27 mpg on the highway and lows 20s in town, so it’s comparable. The suspension is softer than past models, but dual-valve reactive shocks handle severe bumps well. Eight inches of ground clearance is useful. The luggage space is adequate, and if you need more you’ll buy something much larger. Let’s hope direct injection arrives next year, along with a 9-speed automatic transmission. Everything about this car is fantastic. It drives like a lightweight dream, has more usable power than its predecessor, it's comfortable, it looks great, it even has navigation. You'll drive this car faster and better than anything else because it demands to be driven with verve and panache - and the car will reward you with great handling, acceleration, and a sense that everything is right in the world. 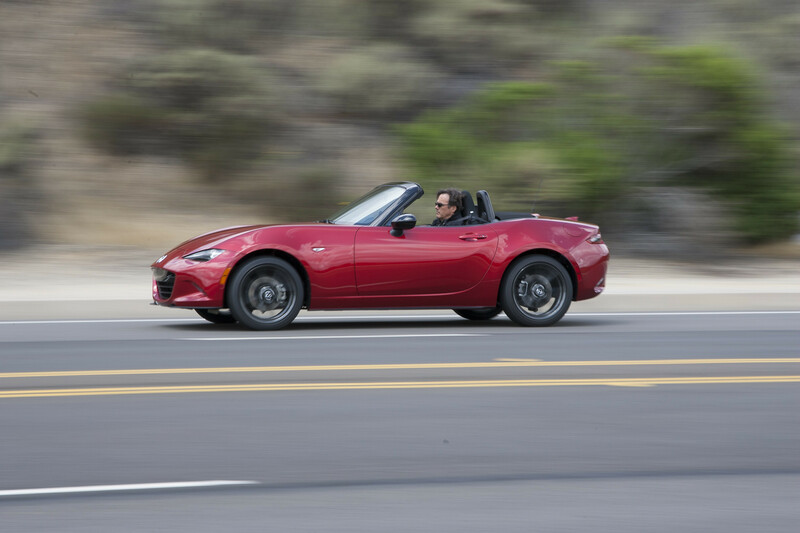 The only way this car could be better is if it was free - when you adjust for inflation, this new Miata is already cheaper than the original Miata was back in 1990. Shut up and buy one already. The new fourth-generation Mazda MX-5 Miata is quite simply the best Miata ever made. Which makes it the best small-displacement sports car ever made. 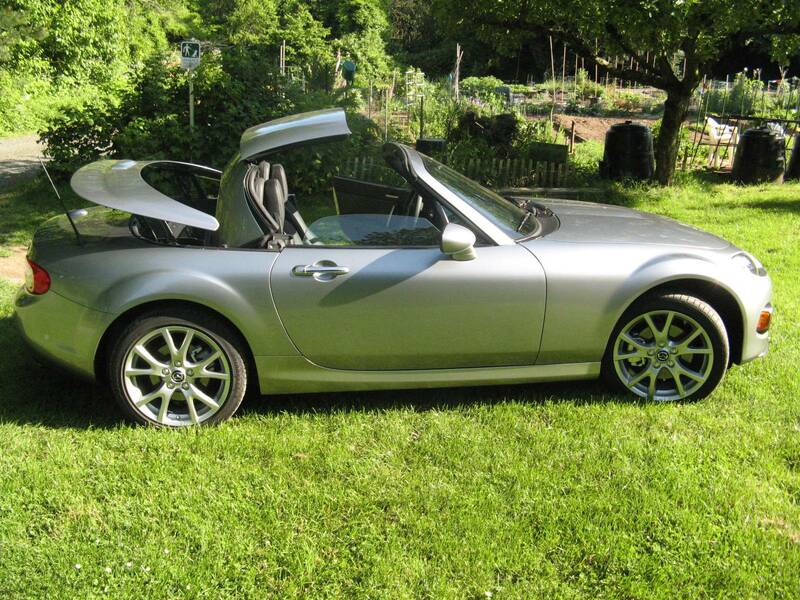 This car has everything you ever loved about a Miata in a newer, lighter, better, more refined package. If you get within 50 feet of one, you're going to want it. If you get in and drive it, be prepared to call your credit union and get out your checkbook. Gas Mileage: You're kidding, right? 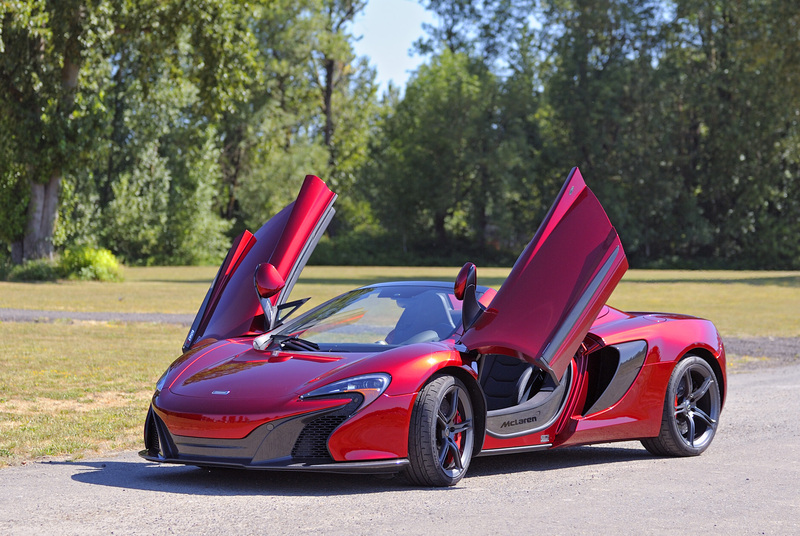 The McLaren 650S offers chest-pounding, breath-holding, knee-weakening high performance. Seriously, this car is as close as you're going to get to flying a fighter jet at ground level. It looks fantastic, and it's super comfortable. The automatic convertible hardtop works perfectly and everywhere you go, people are going to be looking at you and nothing else. Wherever you go, people are going to be looking at you and nothing else. Like, for instance, the road in front of them. Driving this car on the highway is scary - not because of the McLaren, because it does everything well - but because the guy next to you is leaning out the window of his minivan and weaving all over the place trying to take a picture of you with his phone. And it'll happen again 2 miles later with a different car. 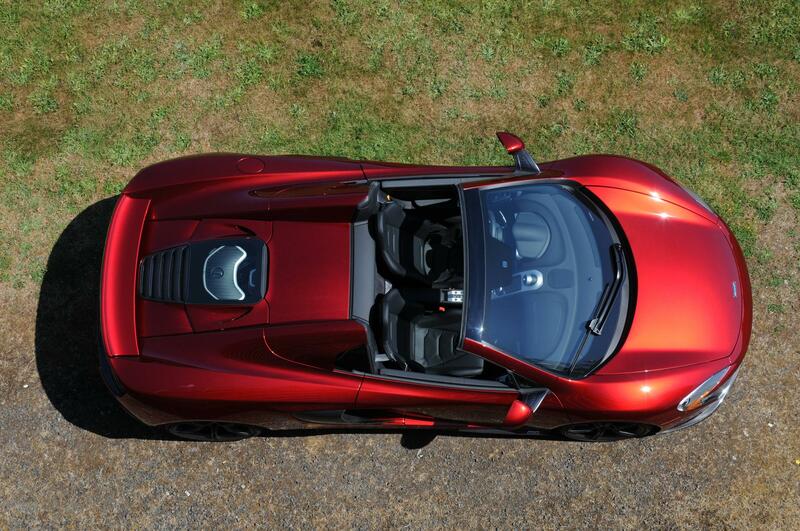 The McLaren is a tremendous car - with a tremendous price tag. This is not a car that anyone buys because it makes sense - you buy it because you want the most amazing, ultimate, and over-the-top car on the market. And that's precisely what you get. 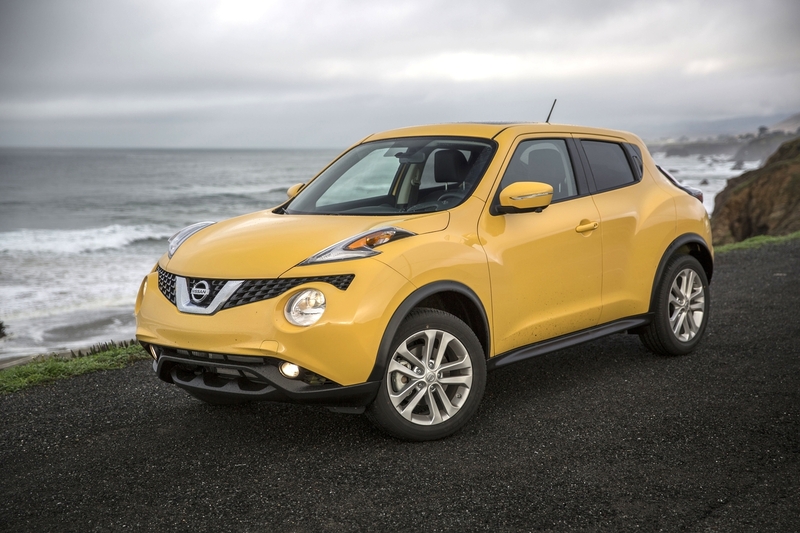 The Juke is small, nimble, sporty, and affordable in the world of compact crossovers. If you like the styling, then the styling is nicely done – but you’ll either like it or not. Engine power is good at 188 hp from a 1.6-liter turbocharged plant. All-wheel-drive is an available option on all models. 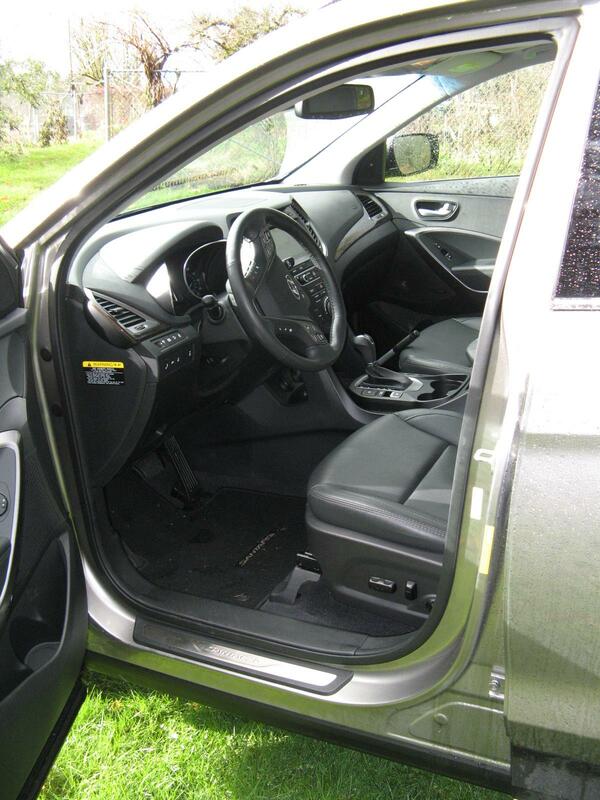 Four doors for convenient access and all mod cons in the driver compartment. 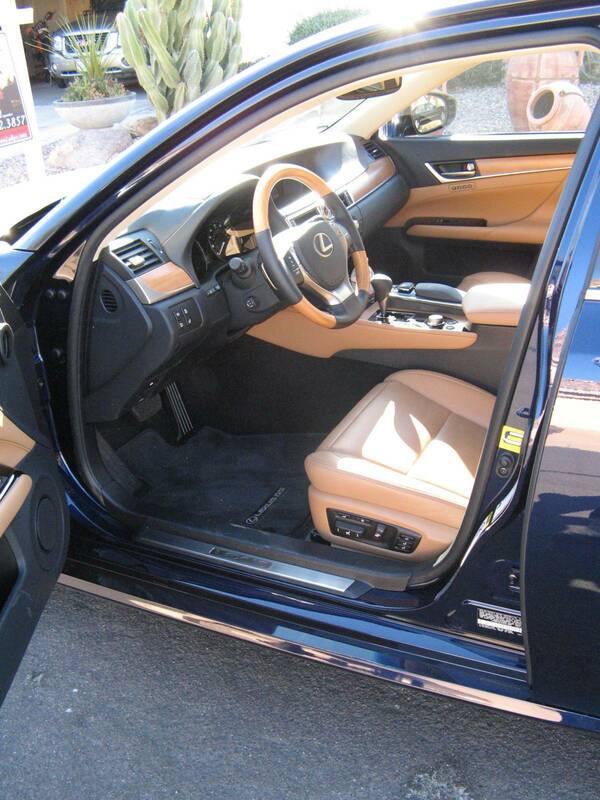 We had the top-luxury SL trim level with navigation and super stereo, plus heated leather seats. The nav/control screen was kind of small at 5.8 inches, but everything is usable. Safety gear is complete with lots of air bags, ABS, traction and stability controls, and a full alarm and tracking system. 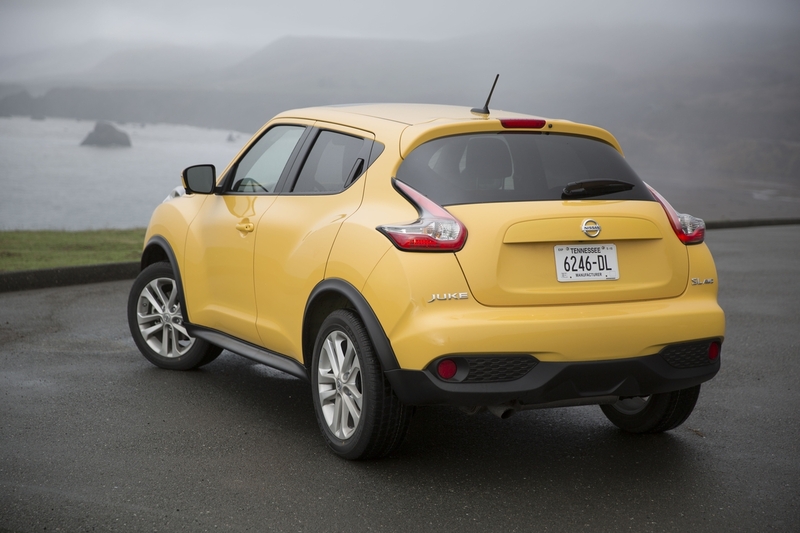 Nissan also gives you a great color palette, and you can customize your Juke to your preferences. The test car was dark blue, with a deep red-on-black interior scheme. Sounds funny, but it works. The continuously variable transmission is the curse of this decade. 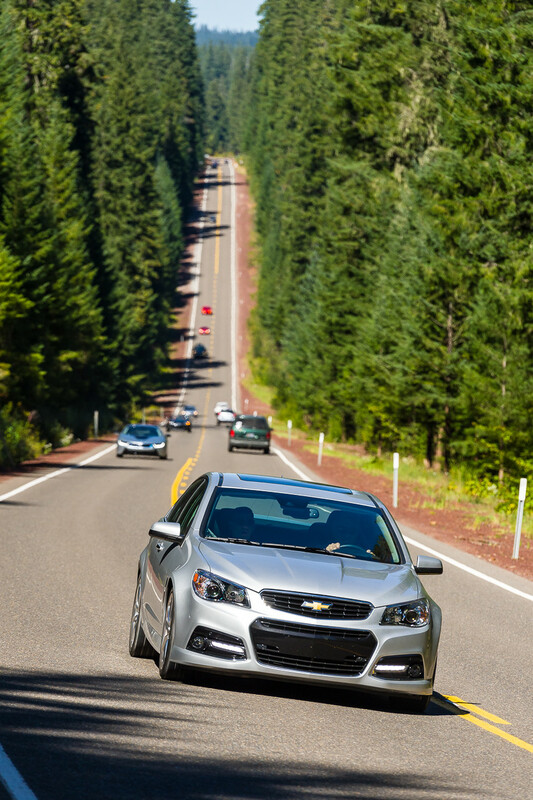 Manufacturers across the board are switching to CVT for its fuel economy benefits, but it’s just dreadful for the driving experience. 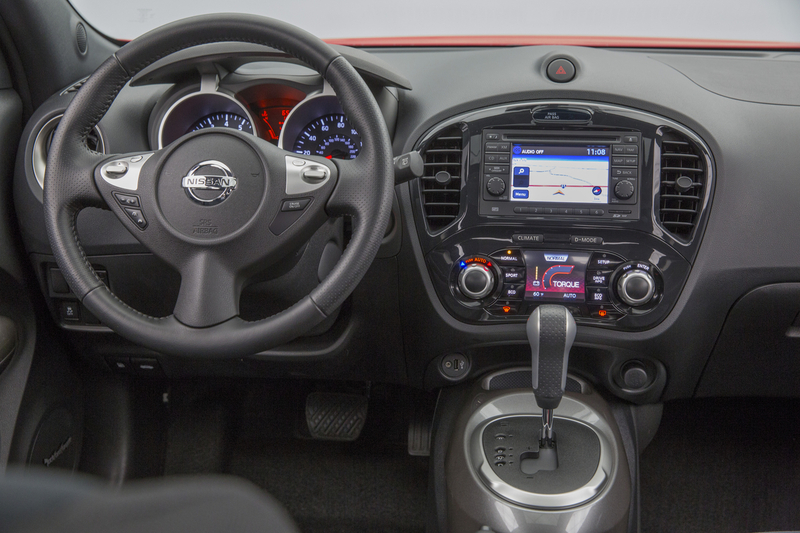 The Juke S, SV, and SL trim levels offer only the CVT – a great reason to test-drive the Juke NISMO or NISMO RS, with a standard 6-speed manual. I didn’t want to like the Nissan Juke. I’m not a fan of the exterior styling, nor of the CVT driving experience. But in the space of a week, I have to say the spunky little Juke won me over – to a point. I found that I looked forward to driving the Juke because it was peppy (even with the soul-sucking CVT) and nimble, plus it was comfortable and useful. What really happened is that I saw what Nissan did right with this car, and it made me wish they’d sent me the hot rod NISMO RS Juke with the 215 hp engine and the 6-speed manual transmission and torque-vectoring All-Wheel-Drive. That’s a car I’d like to have in my own driveway. Likes: It dates me to recall how elegant the 1993 Lexus 300 was at its introduction, and 22 years later the idea of a Super Camry is almost forgotten. 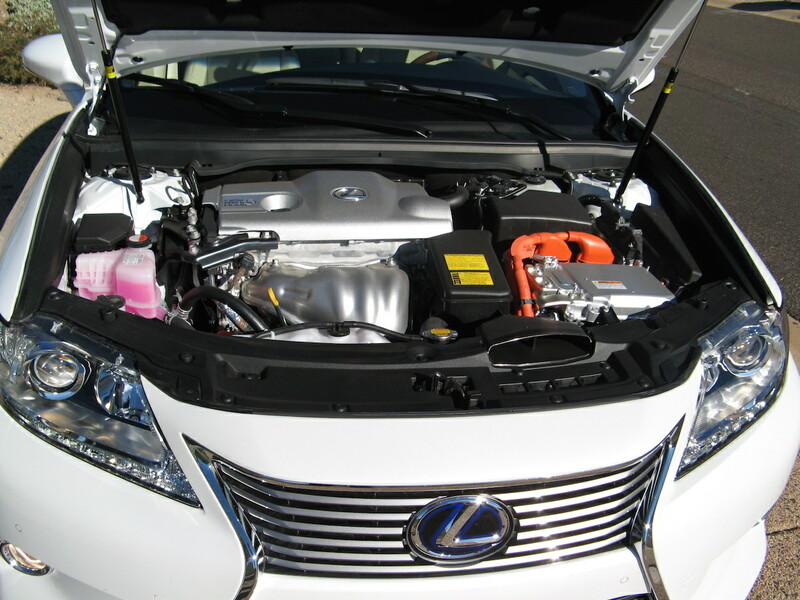 The 2012 redesign of the hybrid power train upped the ES 300h power to 200 bhp and also introduced the idea of sandwiching insulation between body panels to produce one of the quietest sedans on the road. Notably lacking is the road roar occasioned by low-profile tires and hard suspension bushings, which practically defeats the stereo on Hondas and Nissans at 60 mph. The Prius-based hybrid power train is extremely well integrated, with a 0-60 time of about 8 seconds and a stealth mode up to 25 mph. Especially in Sport mode, initial torque makes it hard to believe this is only a 2.5-liter DOHC 4-cylinder engine, and it’s silent and stable at speed. Additional gadgets include ABS with electronic brake force distribution, stability control, numerous airbags, brake assist and smart stop technology. Push-button startup is convenient (and practically universal now) and an eight-inch touch screen offers navigation with voice-command and real-time weather and traffic conditions. 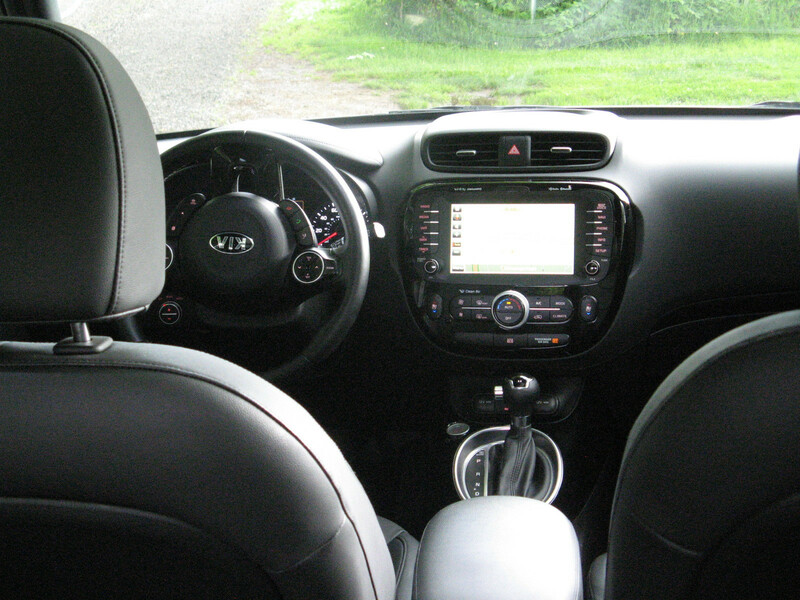 The stereo includes MP3 and USB ports, Sirius XM and Bluetooth hands-free phoning. The test car had the Premium Package with handsome leather interior, heated and cooled front seats, and dual-zone climate control. The ES 300h is stuffed with airbags: driver and passenger have front, side and knee, rear seats have side airbags and all have side curtains and seatbelt pre-tensioners. Automatic collision notification is accompanied by stolen vehicle tracker and an emergency assist button. The battery pack still leaves room for a useful trunk, and that weight so far back actually improves handling. Gripes: I’m not wild about the spindle nose, which has spread across the Lexus lineup as invasively as Lesser Celandine. Excellent fog lights and projector bulb headlights are unaccountably accompanied by old-fashioned filament high beams. Brakes feel a little grabby at first, but you adjust. Verdict: A terrific all-rounder, and a bargain to boot. A week of covering auctions across Scottsdale, Phoenix and Fort McDowell cost a miniscule amount, using only 8.2 gallons for an average of 42 mpg. For those of you who sniff at the “Ideal Buick” aspect of the ES 300, let me observe Buick should be so lucky to have a model this successful. 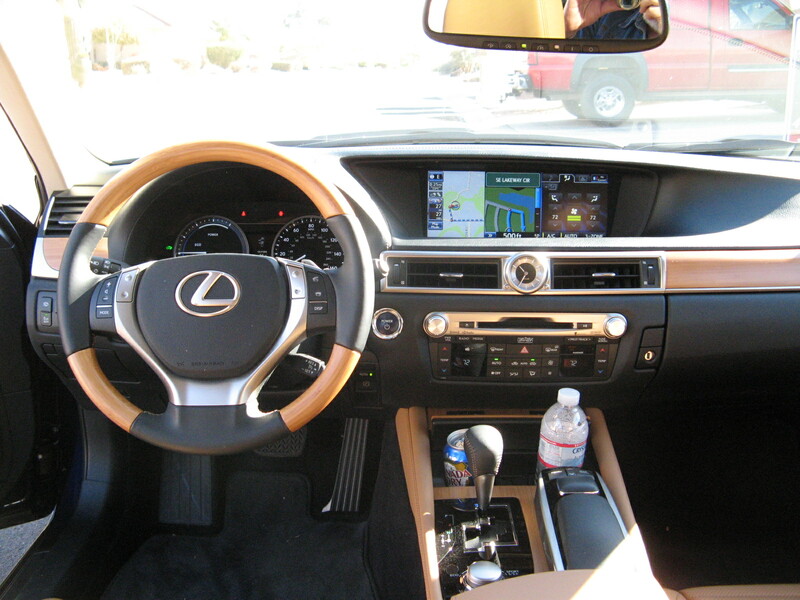 The ES 300 line accounts for HALF the 170,000 or so Lexus sedans sold each year. At $10,000 less than a BMW 3 Series Hybrid, it’s a no-brainer. 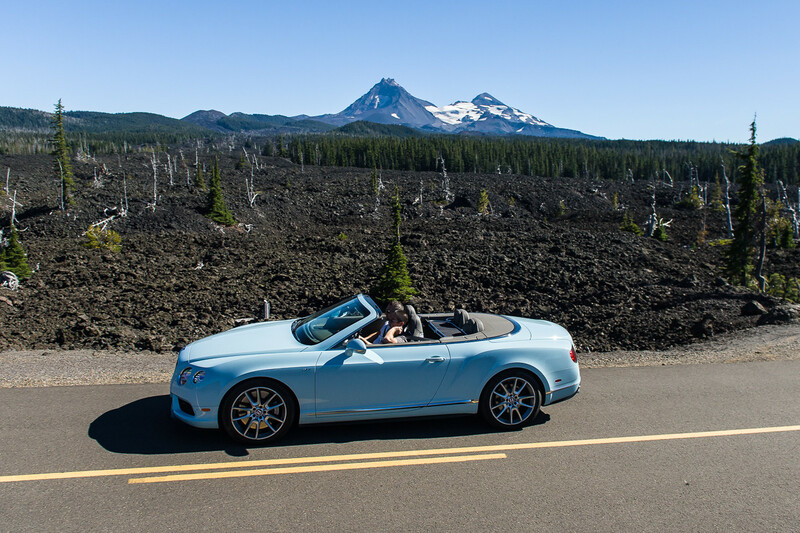 The Run to the Sun has been the premier new car driving event in the Northwest for more than 20 years. Both journalists and manufacturers love it, as it combines spectacular scenery with 500 miles of twisting roads and relatively little traffic. 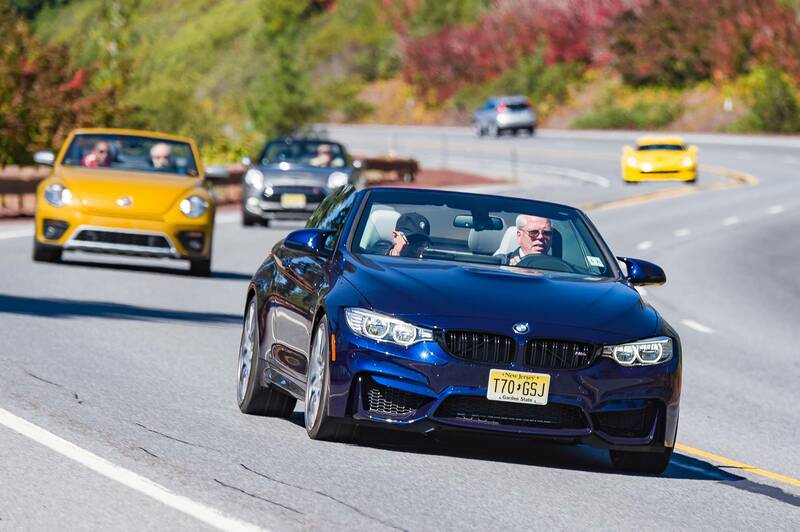 The quality of vehicles provided for the test has gone up steadily over the years, but everyone agreed that the 2014 event, which took place September 10-11, showcased the best-ever lineup. 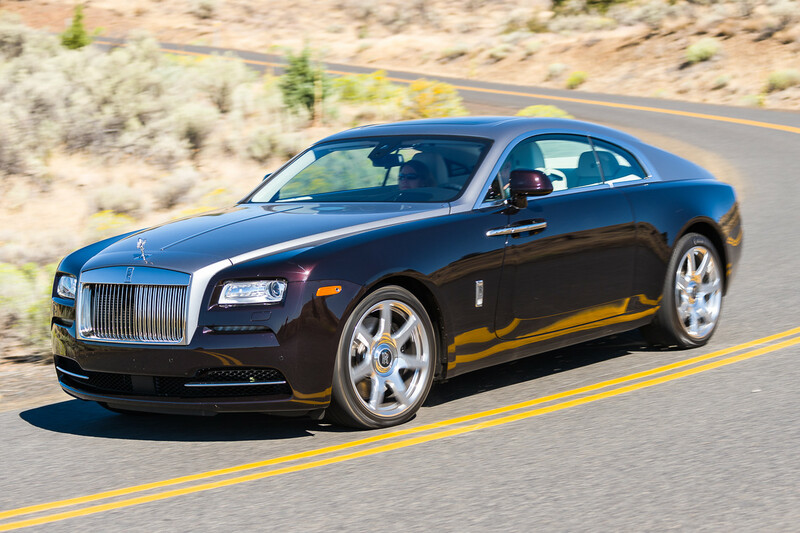 Twenty-five journalists drove 25 sports cars including a BMW i8, Alfa Romeo 4C, Dodge Challenger Hellcat, Bentley Continental GT convertible, Rolls-Royce Wraith Coupe, Chevrolet SS, Jaguar F-Type V8 Coupe, Nissan GT-R, Dodge Viper T/A and Cadillac ATS coupe among others. The Run to the Sun has been held in various parts of western Washington and Oregon, over the years, but recently the route has stabilized. The currently route winds though the Cascade mountains of northwest Oregon, around 11,000-foot Mt. Hood, then shoots into the wide-open high desert country east of Bend. The event now starts from a hotel at Portland International Airport, so manufacturers and journalists can fly in, and depart easily too. The ride overnights at Sisters in central Oregon, and karaoke at Hardtails bar has become a popular feature late in the evening. Journalists trade cars every 20 or 30 miles, while manufacturer’s representatives act as navigators with route maps, answer questions and prevent over-exuberant driving. Bone-headed behavior can result in a driver being sent home in the middle of the event. You have been warned. If you’re an accredited journalist who’s interested in participating next year, drop the Northwest Automotive Press Association (NWAPA) a line at www.nwapa.org to join the organization. If you fancy the Run to the Sun, sign up as soon as the 2015 dates are announced, as the list fills up quickly. Rather than write about every car that was entered, I’ll focus on my top 10 and list the others at the end. It’s strictly subjective, but hey, it’s MY list. Yours would probably be different. 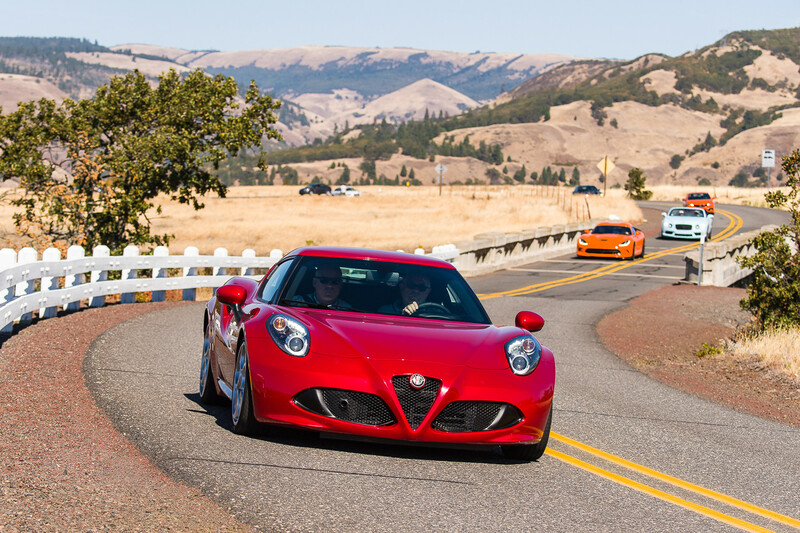 Thrilling mid-engine coupe marks Alfa Romeo’s return to the U.S. after 20 years (the 8C was a red herring). Rosso Competizione paint is an extra $1,500, but worth every penny. Durability is the only question mark; maybe a three-year lease? CONS: Complete carbon fiber tub, with nose about 3 inches off the ground and no bumper. What appears to be a removable bonnet is actually a solid casting, with steering and suspension locked away underneath. “Engine under Glass” is handsome, but somebody’s going to have to work on it. Room for a small soft-sided bag in mini-trunk. Book a great hotel and don’t let the valet park it. SPECS: All-aluminum, direct-injection, 1,750cc DOHC 4-cylinder turbo. 237 bhp, 24 mpg city/34 mpg highway. MSRP $53,900. Price as tested $64,045 (and you want the extras). Astonishing carbon-fiber hybrid supercar, with 2-speed electrically powered front wheels and 6-speed turbo-charged 3-cylinder driving the rear. Stylish touches draw crowds and intelligent electronics will require time to learn. PROS: Great take-off, brilliant handling. Comes in four levels of gadgetry Mega/Giga/Tera and Pure Impulse. Butterfly doors hinged on A-pillars draw crowds, as do rear Manta Ray wings. Genuinely looks like the future. CONS: Infernally complicated – the downside of new technology. Chunky carbon fiber A-pillars very difficult to see past on tight turns. Rapid running on remote country roads on Day Two sent car into 40 mph limp-home mode. It recovered at lunch to manage 70 mph, and overheated batteries were suspected. 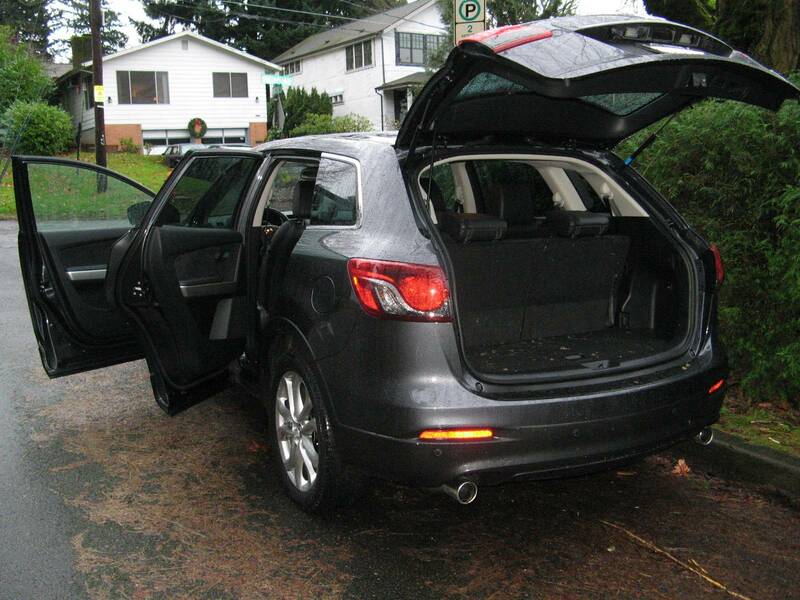 Passenger who managed to get into “2-crush-2” rear seat could not get out without assistance. Reportedly sold out for four years, but its complexity makes it a lease candidate, if you can find one. SPECS: Twin power, turbo 3-cylinder with direct injection and good for 228 bhp to rear wheels. eDrive 129 bhp from front-mounted electric motor adds up to total 357 bhp and 420 ft-pounds of torque. Power settings range from eDrive, Eco-Pro, Comfort and Sport settings. iDrive, top-level safety equipment, navigation, all power accessories. Electricity and gasoline 76 mpg, gasoline only 28 mpg. MSRP $136,650 - $147,450. Mad Max monster vividly illustrates what modern technology can do for the 1960s muscle car. 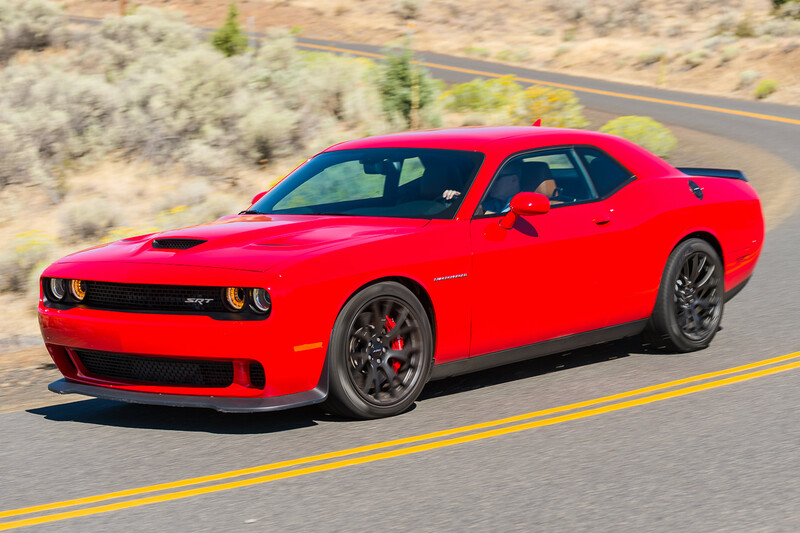 Supercharged 6.2 liter, 707 bhp Hemi V8 with 8-speed automatic (though 6-speed stick is offered). The 800-pound gorilla that everybody stared at and grinned. Drivers in other cars always waved it by to get the full effect of a low-level pass from a WWII Grumman F6F Hellcat. PROS: Feels well sorted, very stable, direct steering, great brakes. A big heavy car, but combines the bulk of a weight lifter with good balance. Be sure you’re pointing where you want to go when you floor it. Valet key which limits the engine to 4,000 rpm and allows only 2nd gear starts is a nice touch. 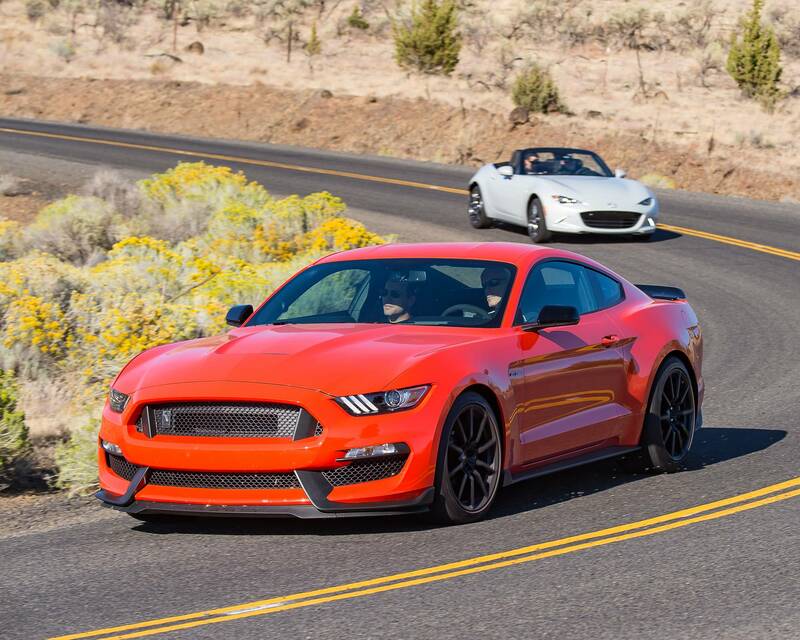 Does 0-60 in 4.1 seconds, ¼ mile in 11.2 seconds at about 120 mph. CONS: This car deserves an appearance package; a big wing, or an unforgettable paint job. Right now, it’s possible to order it in stealth colors, not a good idea, considering how fast it is. Tires and brakes will cost you a fortune if you drive it exuberantly. Front spoiler is very low. Expensive, but as Dirty Harry said “This is the most powerful handgun in the world and will blow your head clean off.” Amen to that. SPECS: Supercharged 6.2-liter Hemi V8 with 11.6 psi twin-screw blower. 707 bhp, 650 pounds foot torque, 8-speed automatic with electronic control, 275/40R20 Pirelli PZERO tires. 13/22 mpg (I showed 8.7). MSRP $59,595, as tested $65,470. Superfast convertible for the conservative one-percent, though Glacier Blue is the color of cheap eye shadow on certain blondes. “S” designation should be just $, but you get a 521 bhp Twin Turbo V8, and a claimed 191 mph top speed. Now all you have to find is someplace to do that. PROS: All-wheel drive, and well balanced, though you will be aware of 5,500 lbs wanting to go sideways. 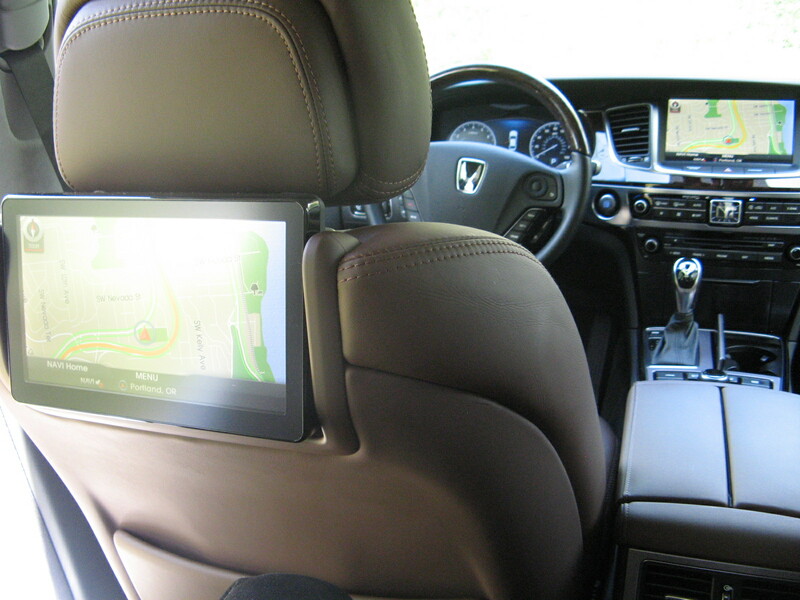 Gadgets lean to luxury, with power everything, heated/cooled seats, neck warmer, contrasting stitching, beautiful dash, etc. With the three-layer top up you almost want to whisper. The car you’d keep until a new model comes out. CONS: Mind-bogglingly expensive for a car (however well made) which looks like an Audi that went to a Swiss finishing school. Seems to be aimed at an “old” young person, or maybe an aging boomer who made a lot of money and thinks this represents an adventurous spirit. Such buyers may be seen with their nieces at The Quail Concours in Carmel Valley. SPECS: Twin-turbo 4-liter V8; 521 bhp, 8-speed ZF automatic with paddle-shift, all-wheel drive split 40-60. Motor completely concealed from view by grey plastic. 0-60 mph in 4.5 seconds, top speed 191 mph, 14/24 mpg (a good bit less at speed). MSRP $216,200. Price as tested $251,070. New model in 2014. One of the most successful recent designs, with a Bentley Continental R-Type fastback and suicide front doors, to ease rear seat access. Powered by 6.6-liter 624 bhp V12 with rear-wheel drive. U.S. Wraith package costs $38,825 but includes heads-up display, lane departure warning, night vision, camera system and other extras. Quiet as a crypt, simple dash with no gadgets, which conceals 10.25-inch screen. Perfect finish everywhere. The Spirit of Ecstasy retracts into the grill when the car is parked. PROS: Somebody you’ve never met cares a lot about you. Compared to the New Brutalism of the monstrous Phantoms, this is subtle and quite tasteful, unless you go for OPEC colors. Suicide doors make for easy access; they’re big, but have closing assistance, and there is an umbrella hidden inside the A-pillar. Every conceivable comfort you can imagine is included. CONS: It might be small for a Rolls-Royce, but it’s big compared to everything else. You’ll need a significant income to drive it without regard to expense. Oddly, the retracting Spirit of Ecstasy is much smaller than the one you’re used to seeing, which makes the car look even bigger. SPECS: 6.6-liter DOHC V12 , 624 bhp, 8-speed automatic. Every dynamic handling and active safety option available, every comfort and luxury one too. Self-leveling suspension, voice recognition navigation, 4-zone climate control, heated/cooled/massaging seats. 13/21 mpg, MSRP $284,900. Price as tested $370,850. 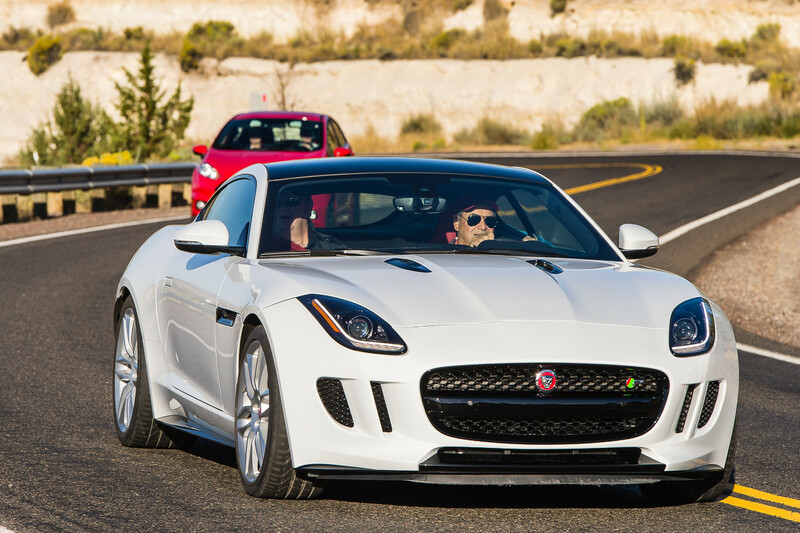 On last year’s Run to the Sun we had a Jaguar F-Type convertible, with a 380 bhp supercharged- V6. The car was praised for its light feel, excellent balance and F1 exhaust wail. This year brought the 550 bhp V8 R Type coupe, which was only about 100 lbs heavier and with an extra 170 bhp. It was a rocket. PROS: Handsome, comfortable, very smart telemetry that tracks steering and throttle by the second. 0-60 mph in under 4 seconds, top speed limited to 186 mph, but you’ll have to go to an Air Force base or the Autobahn to check that out. Dynamic setting on active exhaust means you will wake the neighbors. CONS: Some interior gear seems a bit cheap, only 11 cubic feet of luggage space in the pointed tail (still 3 cubic feet better than the roadster). Front spoiler very low. 8-speed quick-shift automatic transmission works fine, but I’d still like a 6-speed stick. Still looks too much like the last XKR and not enough like the E-type, for me. SPECS: 550 bhp, supercharged DOHC V8 engine, 8-speed automatic transmission, rear wheel drive, dynamic stability, climate control, navigation, panoramic glass roof, intelligent headlights, front and rear sensors. 16/23 mpg. MSRP $99,000,000. Price as tested $103,975. Twenty years after the Impala SS, Rip Van Winkle Chevrolet gets a phone call from Australia. The 415 bhp V8-powered Holden Commodore is coming home, and it’s made good. I guess the earlier Pontiac G8 never got a green card. At first available only a police package Caprice, the Holden is now available as a shorter-wheelbase four-door Chevrolet Super Sport sedan, just in time for GM to pull out of Australia. PROS: Rock solid, old-time GM tech, but much faster (160 mph), and with first-class brakes and very good handling. 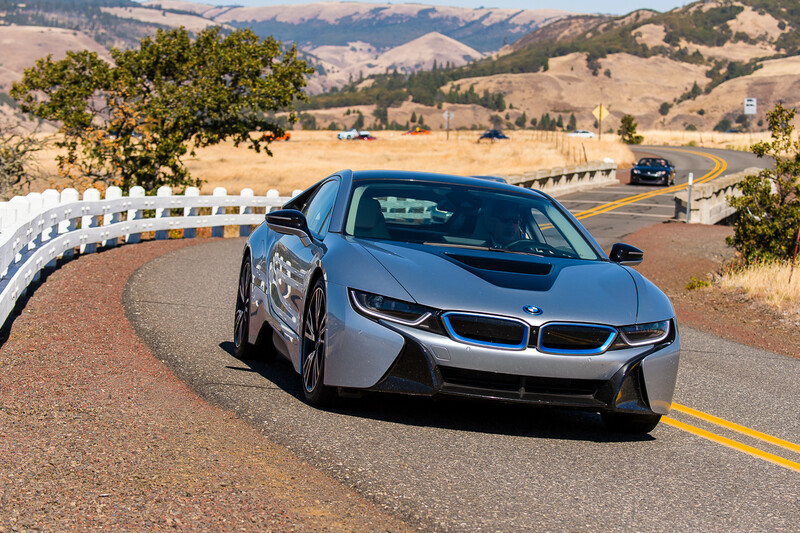 0-60 in 4.5 seconds, ¼ mile in 12.9 seconds at 111 mph. Has the older LS3 V8 motor, so variable valve timing and direct fuel injection still to come, but a good 6-speed automatic transmission. Pulls 0.95g on the skid pad and isn’t upset by bumpy corners. CONS: Styling is a bit bland, as is the interior, but it’s consistent with GM style, and in the old days would have been shared with Oldsmobile, Pontiac and Buick. Next year should bring a version of the Corvette LT1 V8 and a 6-speed manual transmission. I’d wait until then, or take a lease for now. It needs a real spare tire. A bottle of sticky goo won’t won’t fix a cut. SPECS: 415 bhp V8, 6-speed automatic transmission, all power options, full safety and stability equipment, dual zone climate control, On Star, navigation, collision alerts. 14/21 mpg. MSRP $43,475. Price as tested $46,670. How to feel like a successful German heart surgeon in Berlin with a place in the Bavarian Alps. This mile-eater is the equivalent of a Cessna 172, but quieter and much more comfortable. The driver assistance programs aren’t intrusive, but they keep you on the road, observe and monitor other traffic and conditions, warm (or cool) you and keep you comfortable, with six types of massage and even scented air-conditioning. The twin-turbo, 4.6 liter DOHC V8 generates 449 horsepower and the seven-speed paddle shift speeds you 0-60 in 4.9 second, to an electronically limited 132 mph. All-wheel drive keeps the weather at bay. PROS: This car is supremely competent. It is silent, elegant, fast, pretty simple to operate, without a dizzying number of controls, and with more gadgets than you can imagine, like parking assist, pre-safe braking with pedestrian recognition and cross-traffic assist. These you immediately decide you must have in the future, including the Burmester high-end 3D surround system. If you’ve ever fed your cat a special treat you’ll know what I mean. That’s what he wants from now on. CONS: It’s not cheap, it’s big, and it is unbelievably complicated. Fortunately it’s a top-of-the-line Mercedes, so it’s likely to last, but you’re unlikely to buy it unless you need it. SPECS: 4.6 liter, DOHC twin-turbo V8, all-wheel drive, 7-speed automatic transmission, most safety systems known to man, ditto the same number of comfort options. 16/26 mpg. MSRP $95,900. Price as tested $128,545,000. PROS: Exceptionally well balanced, with the engine up against the firewall, very nice six-speed, good brakes, great road feedback, posi-traction, decent economy, good looking and affordable. CONS: Needs more power: maybe a turbocharger? Seats are comfortable but interior very plain. Could use more signature colors, apart from the orange metallic. Unremarkable in dark colors. SPECS: 2-liter, 200 bhp flat four, 6-speed manual or 6-speed auto, rear wheel drive. 0-60 in 614. Seconds, 136 mph top speed. 22/30 mpg. MSRP $24,700. Price as tested $25,455. PROS: Significant “look at me factor” especially in the best colors, with contrasting stripes and convertible top. The turbo-charged engine is stronger than you’d think and the handling is utterly predictable. Lots of fun for the money. CONS: Unless this survives as an icon, which it could do, expanding the line could be difficult. Mini has hit the wall, facing just that problem. Long-term durability still unknown and back seat for short distances only. SPEC: 160 bhp 1.6-liter 4-cylinder engine with six speed stick or automatic, air-conditioning, convertible top. 0-60 mph 6.7 seconds, 129 mph top speed, 28/34 mpg. MSRP $26,095. Price as tested $31,704. Nissan GT-R: A Samurai sword. Severely styled but violently quick. 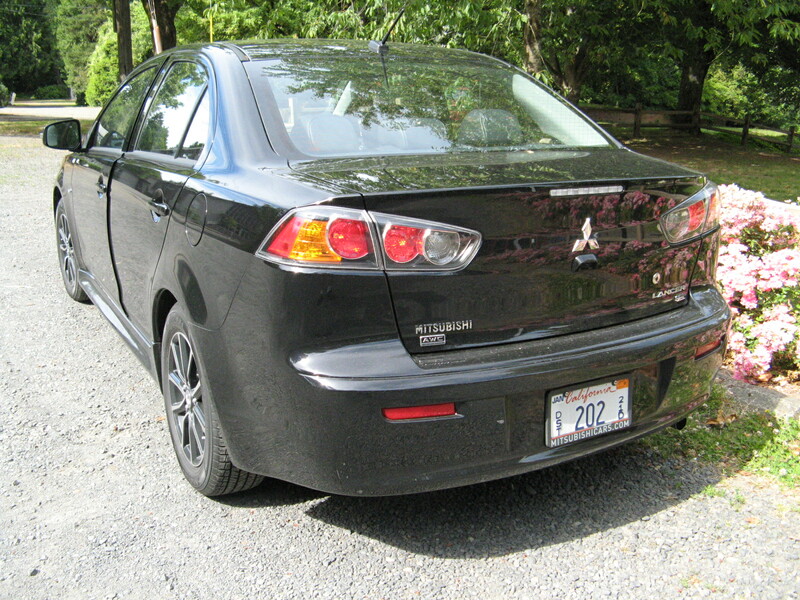 Mitsubishi Lancer SE: Not an Evo, which is all anybody asks about. Honda Civic Si Coupe: Improved in many details; but still the same. 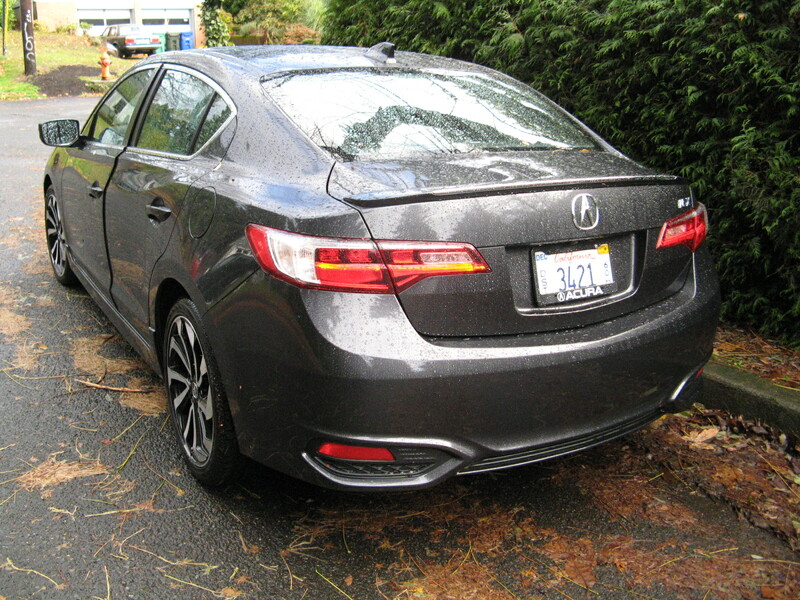 Acura TLX: Lively 4-cylinder with new 8-speed transmission, which sadly failed to proceed. Kia 900: Genesis competitor, if you can get past the dog patrol name. Dodge Viper T/A: Stripped out track version; fast, noisy, dated and claustrophobic. Mazda MX-5: Everybody wanted to know where the new one is. Very dated. Audi S4: Fast and capable, but oh so familiar. Haven’t I been here before? 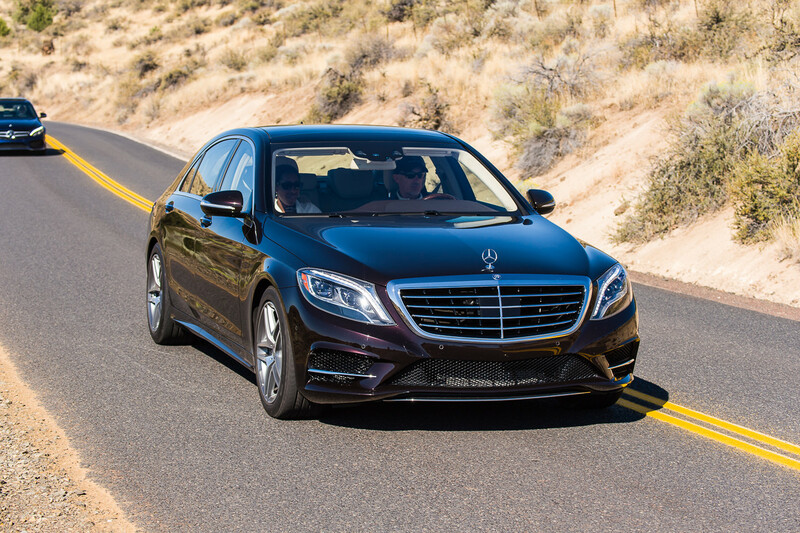 Mercedes-Benz C Class: Excellent, but unremarkable against the S550. Volkswagen Golf GTi: Excellent technology, unremarkable styling. Lexus IS F: The last version of this model. Time for a major update. Ford Fiesta ST: Quite lively, but the loudest road roar I have ever heard. Likes: Elegant coupe continues as spinoff from Sonata sedan. 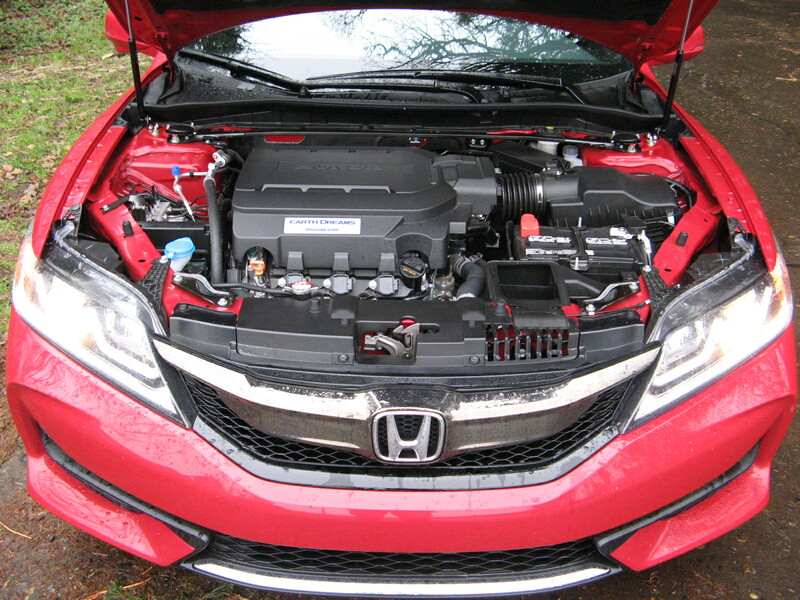 Power bumped 25 bhp to 173 bhp through bigger 2-liter DOHC 4-cylinder, with variable valve timing. Six-speed auto trans is quick-shifting, and has tilt-telescope wheel-mounted paddles for the fidgety. 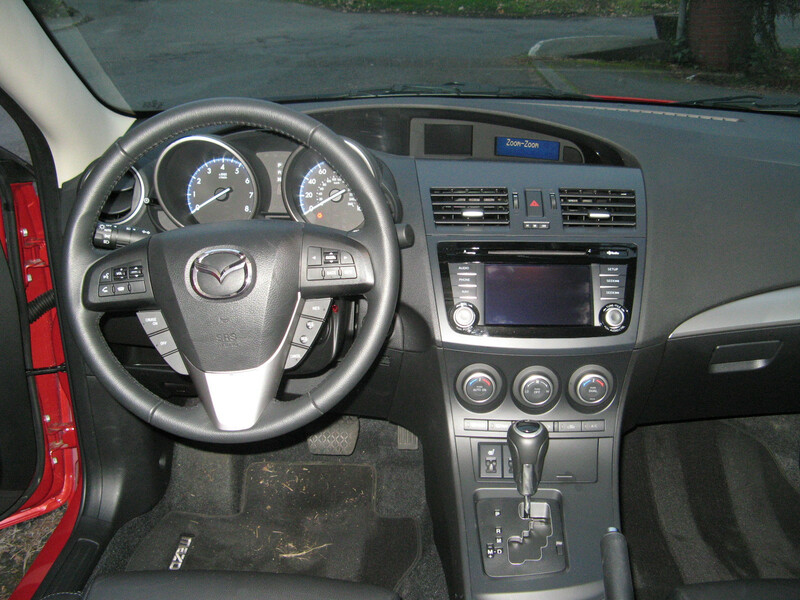 Stylish interior upgraded, gauges well placed, controls simple. Technology package includes very sharp 7-inch navigation screen and rear camera. Disc brakes all round, dual-zone climate controls, five air bags and curtains, and belt pre-tensioners, ABS, traction control, electronic stability, power windows, mirrors, remote locking. Nice interior materials, 7-speaker AM/FM/CD/MP3 XM stereo, Bluetooth. Generous 14.8 cubic foot trunk for a coupe. 60,000-mile, 5-year transferable warranty and roadside assistance 10-year 100,000 mile powertrain warranty. Surprisingly quiet on the highway, unlike comparable Honda and Nissan products. Crash test results excellent with highest results for all but offset front crash (which still rated OK). Dislikes: 40-60 split back seat is a squeeze for adults. Handsome mag wheels are frighteningly vulnerable to curb damage and there is no spare – just a fix-a-flat, which often won’t do. Chassis flexes on bumpy roads, front spoiler rather low for parking lots. Verdict: Pretty car with good manners. Like all Hyundai and Kia offerings, this combines a competitive price with decent performance. Even with the $4,200 technology package, which also includes sunroof, heater leather seats, automatic projector headlights and LED running lights and taillights, it’s still under $25K. Estimated mileage was close to real figures, but as usual I’d have preferred a 6-speed stick and I bet I could have done better on the highway. Likes: Redesigned with a spindle nose to fit in with the other Lexus models, but most recognizable as a Toyota Land Cruiser. In some markets it’s actually sold as the top-line Land Cruiser Prado. All of which means this is a truck with a separate frame and eight inches of ground clearance. It also has a full-time four-wheel drive system with locking Torsen limited-slip center differential and a low-range transfer case. You will not get stuck. On the other hand you’re not likely to risk this much money herding cattle on your 50,000-acre spread, or attempting to cross the Darien Gap. The 4.6-liter 32-valve DOHC V8 generates 301 bhp, moves the 5,200 pound rig from 0-60 in 7.8 seconds, and enables you to pull 6,500 pounds, which is a very large boat. Additional gadgets include ABS with electronic brake force distribution, brake assist and stability control and trailer sway control. Push-button start-up is convenient and practically universal now. Ten-way front seats have a memory system; the middle row seat splits 60/40, while the third seat is 50/50. The eight-inch touch screen offers navigation with voice-command and real-time weather and traffic conditions; the stereo includes MP3 and USB port, Sirius XM and Bluetooth hands-free phoning. 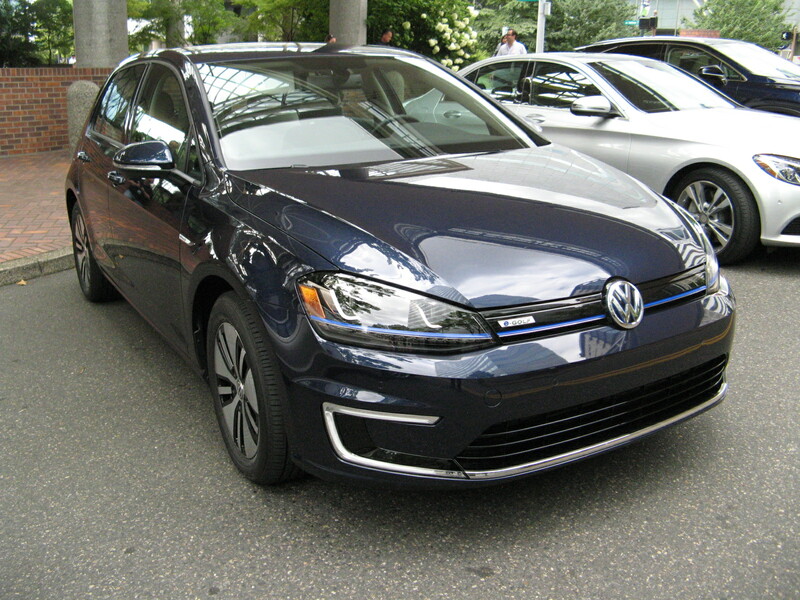 The test car had the $4,000 Premium package (there is now one above this) but this one has leather interior, with heated and cooled front seats, heated outboard second row seats, and three-zone climate control. This car also had the $800 blind-spot and rear cross-traffic alert, which at least enables you to sense how dangerous other drivers are - before they hit you. 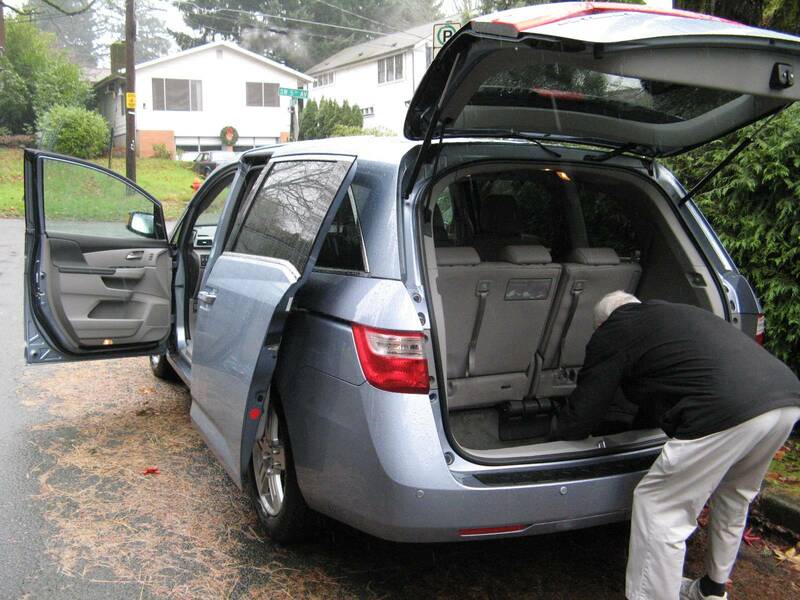 The car is stuffed with 10 airbags: driver and passenger have front, side and knee; second row has side, and all three have side curtains. Automatic collision notification is accompanied by a stolen vehicle tracker and an emergency assist button. Gripes: Not many; it’s a big vehicle that’s designed to minimize your awareness of that, so the experience of driving it is pretty insulated. The third seat is only suitable for children, and the nose is something only a mother could love. Verdict: This is overkill for soccer moms, but it’ll probably make them feel more secure. It’s also nice to know that its limits will probably never be tested by 99 percent of the owners. You get a lot for your money and it’ll last over 250,000 miles with decent maintenance. That’s 22 cents a mile in depreciation over 16 and a half years, at the current average of 15,000 miles a year. You’ll buy 14,705 gallons of gas in that time and if it stays at $4 a gallon, you’ll spend $58,823, or roughly what the GX460 costs you to buy. There’s a certain symmetry to that. Likes: By the time you read this, the new MX-5 will be on its way, as 2014 was the last of the original model, which was in production for 25 years and sold 1 million examples. In that time, the DOHC four cylinder engine grew from 1.6 to 2-liters and from 116 bhp to 167 bhp. 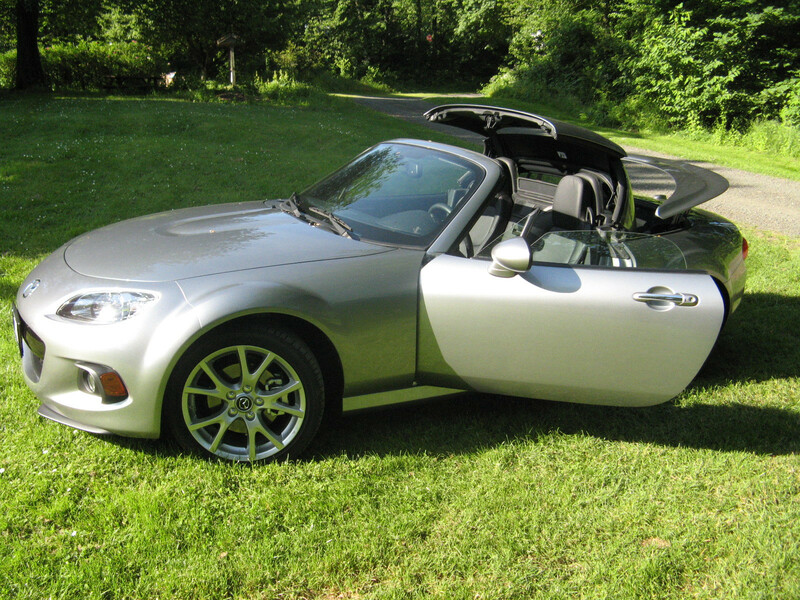 The Miata increased in price from $13,995 to $32,285, lost its pop-up headlights in 1998, gained an optional 6-speed gearbox in 2005 and a retractable hardtop in 2009. The final version is roughly two inches longer, wider and taller than the first one, and also available with a 6-speed automatic transmission. It’s more spacious inside, but all the gauges and switches remain familiar. Power rack and pinion steering is standard, along with disc brakes and a very smooth 6-speed manual transmission. The optional folding hardtop is even simpler than the old convertible top, with a latch in the center and “up” and “down” switches. 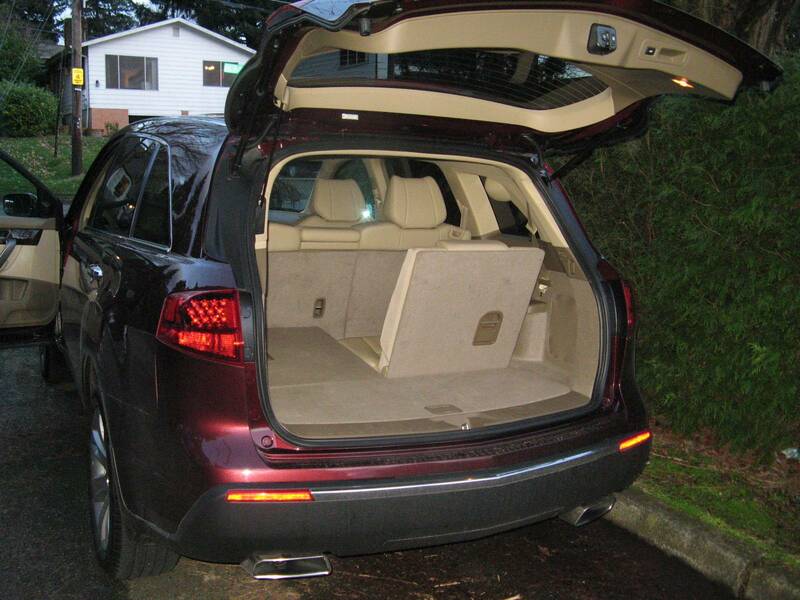 Heated seats are leather, there are power windows and door locks with a remote. Safety equipment includes multiple airbags. AM/FM/MP3/XM/CD with iPod and USB jacks. Automatic climate controls, push button start with smart key. Gripes: No spare tire, which means trunk is actually larger than previous models. However a tire pressure warning light offers little comfort compared to a dink spare, which I’d be inclined to buy. Verdict: The MX-5 is the most successful sports car ever built and will be a tough act to follow. It remains a thoroughly reliable, ideal first collector car, and with so many built prices are likely to remain reasonable. The local Mazda/Toyota wrecking yard has observed that if it wasn’t for the immensely popular Spec-Miata racing, they wouldn’t sell any parts at all. A colleague has one with 404,000 recorded miles, and it still looks nice. Likes: After four years, the popular SUV gets its first makeover, though it’s pretty subtle and actually smooths some of the character lines. The 2-liter DOHC 4-cylinder is recalibrated for lower torque and does 0-60 mph in 8.7 seconds, thanks to 164-horsepower and variable valve timing. The six-speed automatic transmission returns 31 mpg highway. 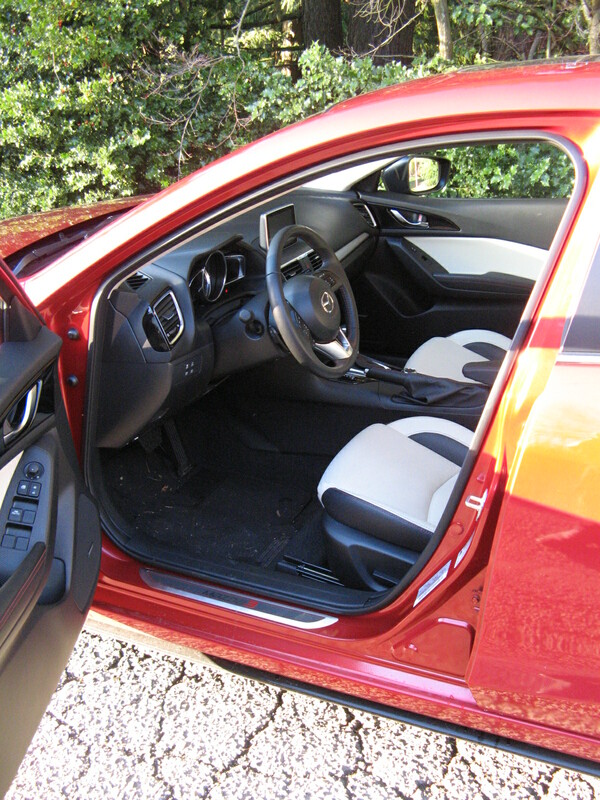 The interior has been refined, and the two appearance packages, Sun & Sound and The Whole Shebang add automatic climate control, a full-length sunroof, 8-inch navigation screen, infinity audio system, push-button start with smart key, heated and ventilated leather front seats, heated rear seats and steering wheel. The instruments remain clear, controls intuitive. 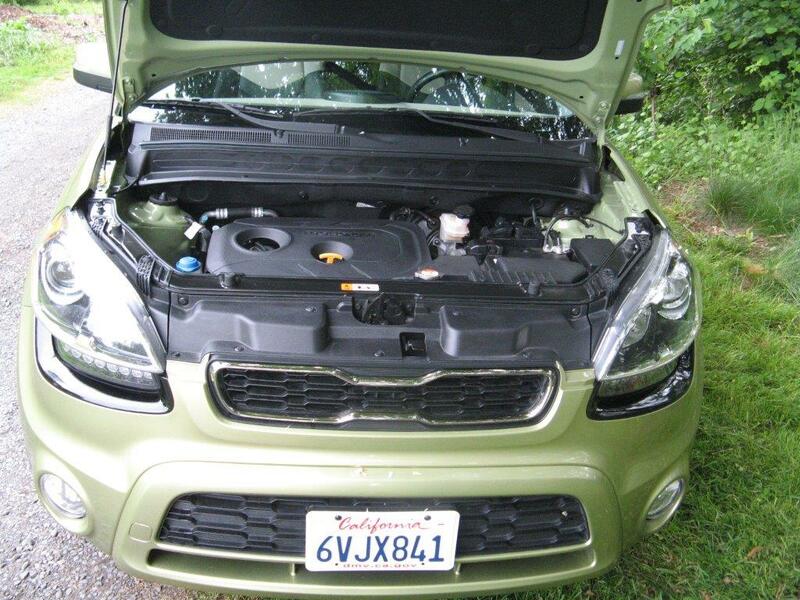 The Soul is reasonably quiet at speed, has capable handling, and handsome 18-inch mags. Excellent steering and AWD disc brakes, multiple air bags and curtains, active front headrests and five-star crash rating. Decent stereo/CD/XM/MP3 Sirius etc. and genuinely usable back seat, with 60-40 split. Remote entry, power windows, power folding mirrors, and backup camera, Interior space has improved to 61 cubic feet with rear seats down, 19 when they’re up. 10 year 100,000 power train warranty; 5-year 60,000 mile basic warranty and roadside assistance. Gripes: Not as much storage as the Scion xB’s 70 cubic feet. At this price you might expect AWD, and not offering the option is a surprising mistake. Sun & Sound package is a whopping $2,600 for nav, Sirius, heated leather seats and auto climate control; The Whole Shebang package is another $2,500 for remote key, heated and ventilated leather seats. I double-checked my math, and 19 mpg in the city was true and not good enough. Rear seats belt can be damaged by latches when return seatbacks to vertical. Verdict: This small SUV is well-designed and continues to be a big hit for Kia with 118,000 sold in 2013 – nearly double the entire Scion line. The 164 bhp engine scoots it right along, and it handles fairly well for a tall box. Surprisingly Kia never did exploit the 2012 Track’ster idea, even though the similar Hyundai Veloster made it to production. The Trackster’s chopped, three-door concept, had a 250-horsepower turbo four, 6-speed manual transmission, fender flares, wide wheels, and electronic all-wheel drive. Perhaps 19 mpg would have been acceptable in that. Likes: Hyundai steps up their game with this long wheelbase Santa Fe. It’s powered by a 290 bhp 3.3-liter direct injection V6, with seven-passenger seating and 5,000 towing capability. It’s also faster than the five-passenger turbo 4-cylinder Sport model, with 0-60 mph in 7.7 seconds. All-wheel drive includes locking central diff, 6-speed auto with manual override, all power, a/c, cruise control and an adjustable electronic power steering. Safety equipment includes stability/traction control, downhill brake control, hillstart assist, multiple airbags, seatbelt pre-tensioners. Excellent brakes, handles well. AM/FM/MP3/XM/CD with iPod and USB jacks and Bluetooth hands-free phone. Dual climate controls, push button start with smart key. SatNav with Sirius traffic; premium package includes leather interior, heated and cooled front seats (driver’s seat has lumbar support), heated captain’s chairs in second row 40/20/40 rear seats recline, panoramic sunroof, auto-dim mirror, cargo cover, heated folding mirrors, side-window sunshades. 10-year, 100,000-mile power train warranty ,with 5-year roadside assist. 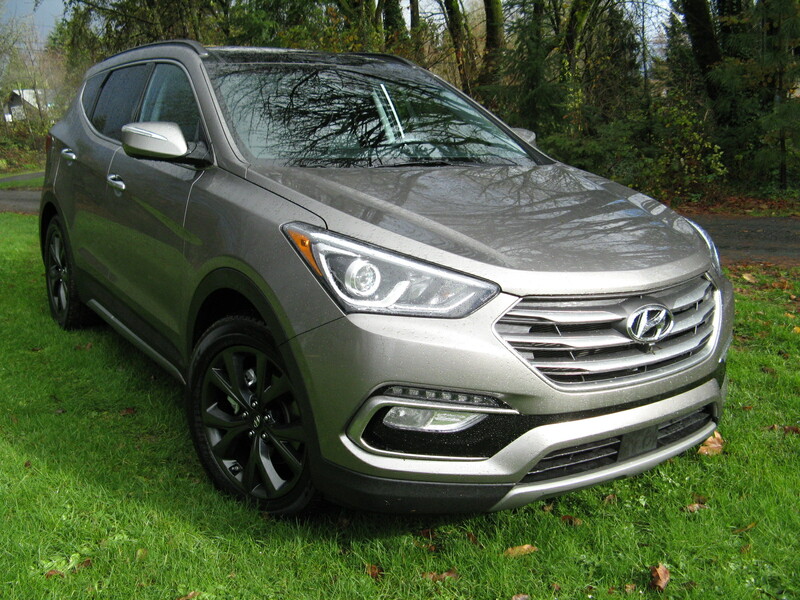 The Santa Fe is available in GLS, Premium and LTD packages and there’s a technology package which adds 19-inch wheels, navigation, 8-inch touch screen, rear parking sensors, full length sunroof, heated and cooled seats, heated steering wheel, xenon headlights, and 12-speaker Infinity sound system. Gripes: Mileage is marginal, but the turbo four didn’t do any better and this is a LOT more car. Restricted rear visibility with 3rd seat headrests makes backup camera essential, and mirrors must be checked, but blind spot monitor is a big help. 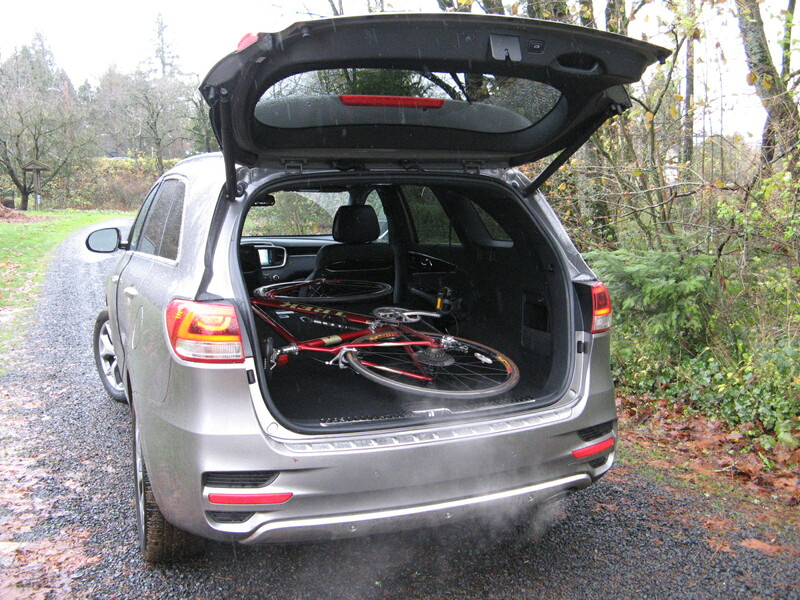 The ride suffers when it’s fully loaded, as a lot of weight is biased to the rear. The technology package seems a bit steep at $5,000, until you look at the overall price, which is remarkable. Verdict: The Santa Fe Sport is now the 5-passenger SWB version, while the former Veracruz is now this LWB model. Just like Kia, Hyundai is determined to think out of the box, to good effect. Comparison shoppers should check out the Mazda CX-5, Toyota RAV-4, Honda CRV, Subaru Outback and Ford Escape, but frankly, at $41,000 with AWD and every conceivable option, this is would be a very good choice. Likes: Handsome and fast, this is Hyundai’s luxury-level Lexus LS, BMW 7 Series, Mercedes-Benz S-Class and Audi A8 fighter. Powered by a 5-liter, 429 bhp, DOHC V8, with 8-speed automatic transmission and Normal, Sport and Snow settings, electronic air suspension, with continuous damping, and more gadgets than you can shake a stick at. Lexicon 17-speaker surround-sound stereo with HD, CD/DVD, iPod USB interface. Leather interior with heated and cooled front seats, nine airbags including roof-mounted side curtains. Blind spot detection system, with rear cross-traffic alert, lane-departure warning, active front head restraints, electronic stability, traction control and brake assist. Adaptive bi-Xenon headlights, power folding and auto-dimming mirrors, smart cruise control. Ultimate package includes forward view cornering camera, heated and cooled rear seats with lumbar supports, rear and side power sun screens, power door and trunk closure. Navigation includes traffic conditions. There are rear seat entertainment screens in front seatbacks, separate climate controls and a cooler in the center console. Handsome 19-inch spoked alloy wheels fitted with tires which actually protect them from curbs. 10-year, 100,000 powertrain warranty, and the 3-year, 36,000 mile no-cost maintenance includes valet service. Dislikes: It’s not really a sport sedan, even on sport settings, but it’s very quiet and fast. Equus name is cool, but badge looks rather like the old Chrysler Imperial eagle, with wings that aren’t so well-defined. 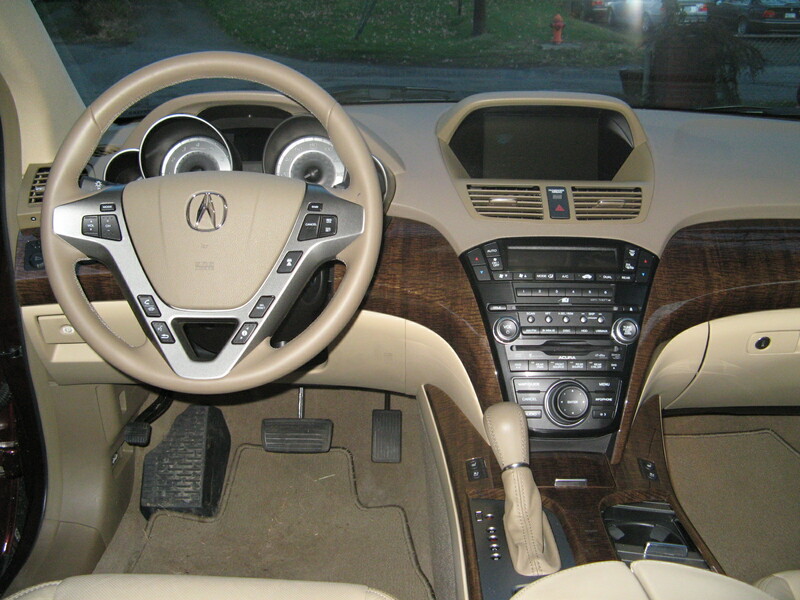 The leather interior is attractive, but it’s pretty soft, so who knows how it will wear. I’d like to see AWD and a hybrid, and at this price there’s room for both options. Verdict: With about 250 of these being sold each month, the Equus is 10 times rarer than the smaller and more anonymous Genesis. The $72,000 Lexus LS 460 is the obvious competitor, but that delivers only 386 bhp and the front-end design is a disaster. The Equus looks good from any angle. To get the same performance from a Lexus, you’d have to spend $120,000 for the LS 600lh, and about $100,000 for the others. The Equus is no VW Phaeton flop; ex-Audi designer Pete Schreyer also designed the Kia K900, which has been very well-received. 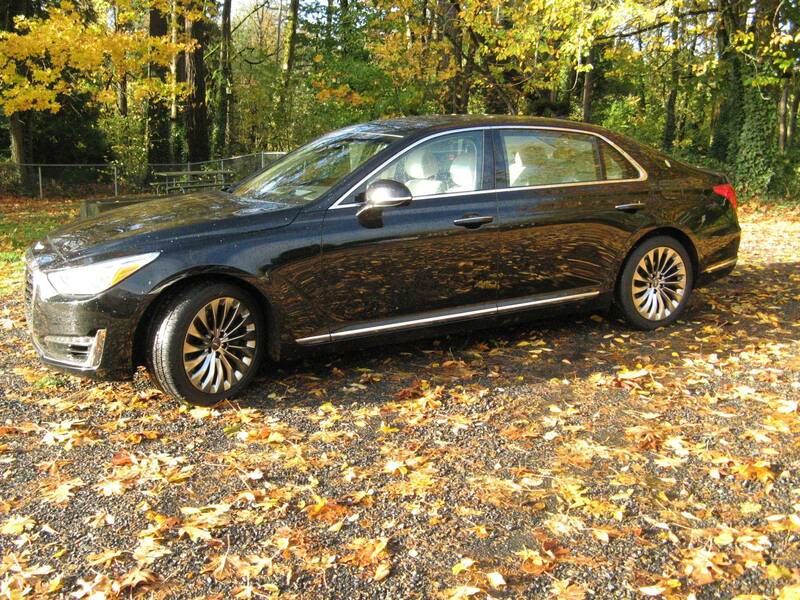 The Equus seems like a gift horse at $68,920, and unlike the Lexus, you can look this one in the mouth. Likes: Another minor revision of much criticized Civic. 143 hp, 1.8 liter SOHC 4 is acceptable. 5-speed auto transmission just OK, 4-wheel disc brakes have good feel, predictable handling, seats adjust and fit well. Anti-lock brakes, traction control, stability assist, air conditioning. Multiple air bags, decent stereo with AM/FM/CD/MP3 iPod etc. Superior window wiper sweep, power windows, door locks, brakes and steering. 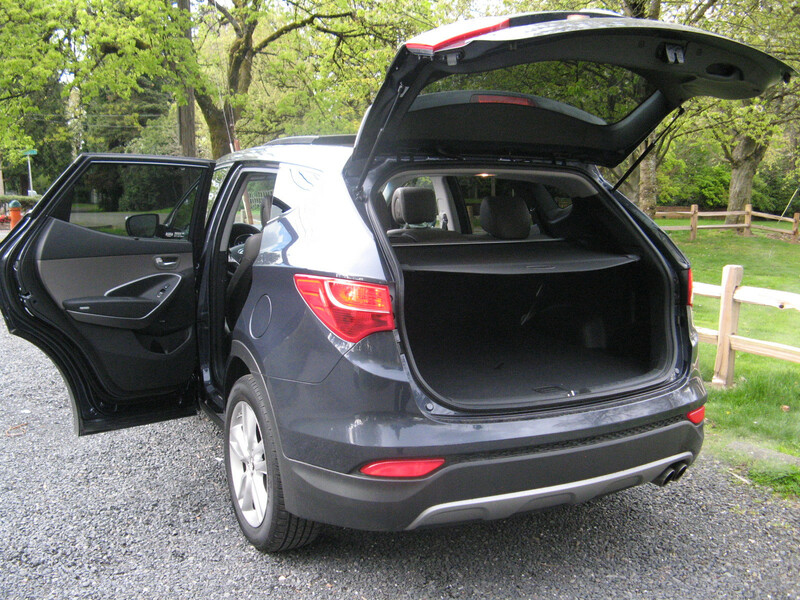 Pass through to trunk, 60-40 fold down rear seat. Rear view camera, lane watch on right. Gripes: Offensively noisy at highway speeds. Fragile grey cloth interior is one coffee spill from permanent disaster. No navigation, leather or XM at this price. Quirky dash now has irritating touch screen – even for radio volume. Transmission pauses before shifting into reverse, like an old VW Rabbit. Doors lock passengers in, which annoys them. Only 29 mpg in mixed driving. Verdict: Some cars are IQ tests; this is one of them. It’s a $16,500 car for $22,000. Bland, noisy, flimsy – the overall finish feels like a Fit. It’s an airport rental if ever I drove one. Honda and Toyota are struggling, and they’re falling into the old Big Three trap: they’re cutting corners on their cheap cars. Apparently they have forgotten that the value of their cheap cars in the past enabled them sell happy customers more expensive ones. Last year I wrote I’d buy a one or two year-old Honda Accord or a Toyota Camry and never look back. This time I’ll go further. Buy a new Kia or Hyundai, and combine value with style. Likes: On balance this is still the class leader, though the Toyota Sienna is close. It has a 248-horsepower, 3.5-liter V-Tec, SOHC V6 which provides 0-60 mph in 7.9 seconds. Six-speed automatic, 4-wheel disc brakes. Finally dash buttons are reduced from 80 to 20. 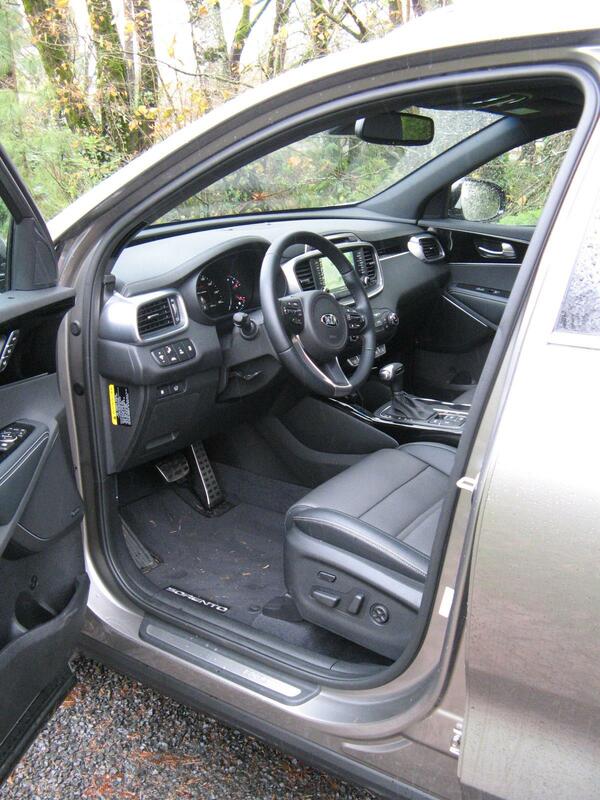 Heated front seats, can take seven adults easily, rear access is reasonable. Second row center seat can be moved forward to accommodate child seat, tumble-home third row disappears into floor. Tilt-telescope wheel, multiple-zone climate control, navigation with voice recognition, 16” DVD in rear can be split for two functions. 12-speaker AM/FM/DVD/XM stereo with MP3, Bluetooth, USB port and headsets. Noise-canceling technology quiet at highway speed, Superior brakes and handling for a minivan, multiple airbags, power everything, brake assist, electronic brake distribution, power moonroof, rear view camera, blind spot warning, collision warning, lane departure warning. Two power sliding doors, power tailgate. Enormous: 38 cubic feet with all seats in place, 93 when third row folded, 148 when second row removed. 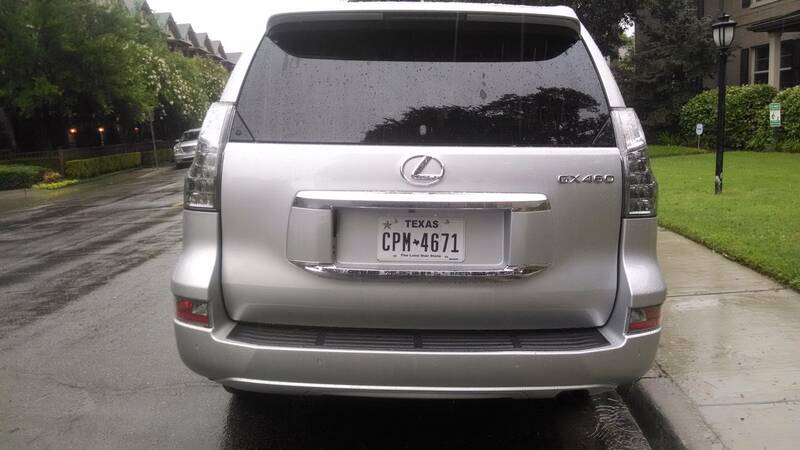 Dislikes: Expensive when fully loaded, though LX model does start at $28,675. Power side doors are fiddly to work. Second row seats must be removed for maximum storage; they do not fold forward or down, which is quite a nuisance. No 4WD availability, and standard tires useless in snow. Verdict: Still the best mini-van you can buy – though you won’t spend this much unless you have a job for it to do. That said, it has near Accord performance in something that feels twice as big. With seats removed, it was able to transport three 72-inch by 31-inch by 12-inch bookcases. Tumble-home third row seats still a brilliant idea. However the Toyota Sienna offers AWD – and at this price you’d probably want it – while the Nissan Quest and Dodge Grand caravan have a second row of seats that fold away. Still, if you have multiple kids who play sports, you can figure on a useful 250K miles from the Odyssey. This might be the only car your children know, until they start driving themselves. Likes: The latest version of the Mazda6 is the company’s BMW 3-Series and remains well regarded in Europe, where people drive their cars much harder than here. It’s now built for American measurements and is an excellent performer, with a distinctive driving signature. The DOHC, 2.5-liter, 185 bhp Sky-Active four scoots it from 0-60 in 7.6 seconds, through a six-speed automatic, with well-sorted suspension and brakes. Traffic proximity warnings are useful, along with a rear camera to account for the high trunk. It has multiple airbags and side curtains, ABS, dynamic stability, traction control and hill-start assist. 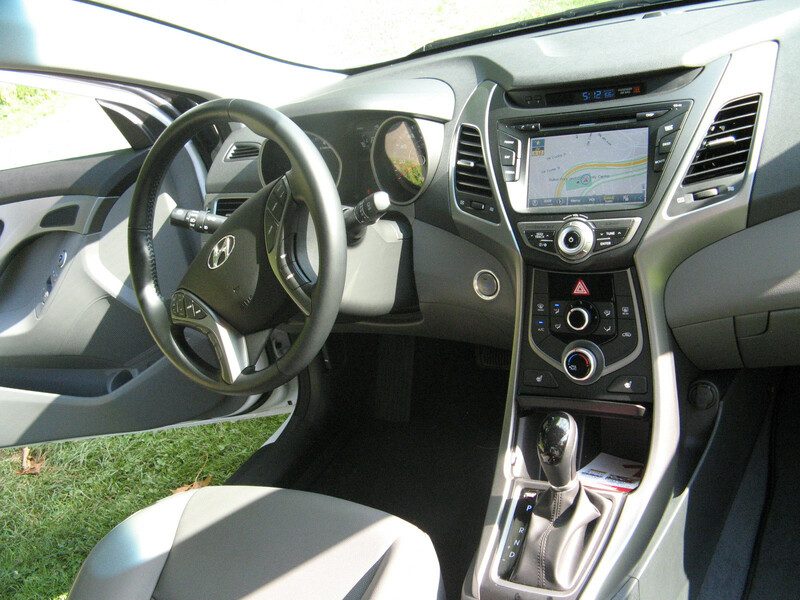 The interior is simple but well-finished with intelligent dash layout and dual-zone climate controls. 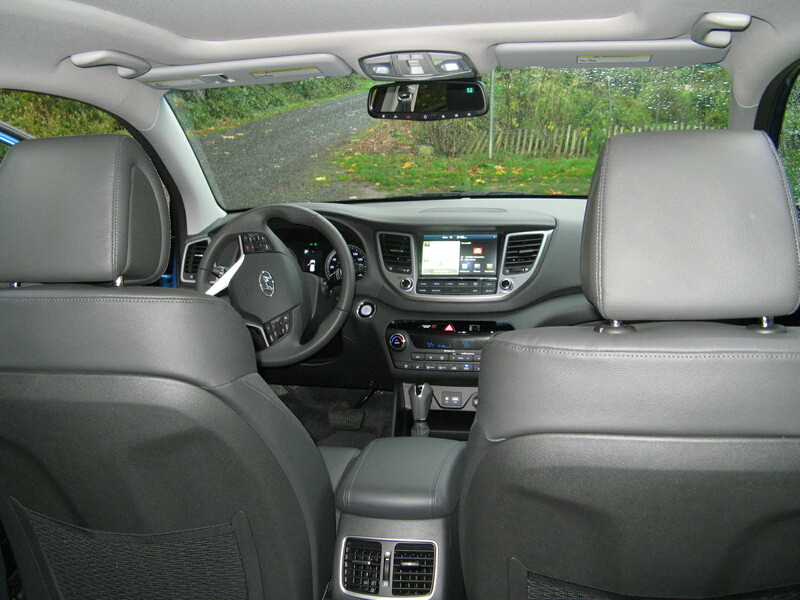 Leather seats are comfortable; the rear seat is adult-sized and splits 40/60 to fold flat. Stereo includes MP3/Bluetooth capability and CD. Navigation system is adequate. Dislikes: Touch screen is fussy, small and annoying. Just give me switches. Automatic transmission is smooth, but fussy in sport mode. XM station signed itself off halfway through a 200-mile trip, and out of cell-phone coverage. Verdict: I drive few new cars I’d buy, but this is still one of them. It’s not aggressively FWD, fast enough, handles and stops well, and has personality, unlike the Honda Accord, Toyota Camry and Nissan Altima. The front end has been transformed from the “Cheshire Cat” to something elegant. I averaged 30 mpg in mixed driving, which is my benchmark but it did not improve much on the highway, which was surprising. Perhaps the 6-speed stick would do better; it’s certainly much more fun to drive. Likes: Probably the most efficient big SUV, with full Prius power train system. Comfortable and predictable, with 3.5-liter DOHC 24-valve Atkinson-cycle V-6, producing 295 hp. The front-wheel drive models use two motors; one acts as a starter-generator and the other provides propulsion, while the all-wheel-drive test vehicle added a third electric motor to drive the rear wheels. 0-60 comes up in 7.5 seconds, the CVT transmission has manual shifting mode, but adapts to dual-power system quite well. The interior has a beautiful finish, heated and cooled comfortable seats, the car is very quiet at speed and gets 30 mpg on the highway. Three-zone climate control, 10 airbags; all current safety devices, including collision avoidance, lane-change warning and speed sensitive power steering. Excellent Mark Levinson stereo, heated and cooled seats, reclining and slide split rear seat, power rear lift gate, rear camera proximity warning. The 2014 model adds Siri Eyes Free for newer iPhones. Gripes: Not that fast off the mark unless you really tromp on it. Navigation system not intuitive, console infotainment “mouse” control annoying. No third seat. Verdict: If you can manage without the third seat, this is probably the best SUV you can buy, as it gets 8 or 9 mpg more than the other big ones. Quiet and surprisingly economical, and will undoubtedly last for 300,000 miles. The basic model is $47,810, but if you’re going to spend that much, add the comfort package for $825 and get the rain-sensing wipers, and heated and ventilated front seats. For another $4,920 you get dual rear entertainment screens with audio video inputs for the kids, navigation and voice command, and Sirius XM nav-traffic (very useful). The $6,055 Luxury Package includes leather, moon roof, heated and folding mirrors, blind spot monitor, bamboo wood trim and 19-inch wheels. You can also add the Mark Levinson stereo for $995, which is state of the art, and parking assist for $500 (though if you can’t park it ... should you buy it?). Likes: Finally, I get a Mazda 3 with the smooth 6-speed manual gearbox it deserves. 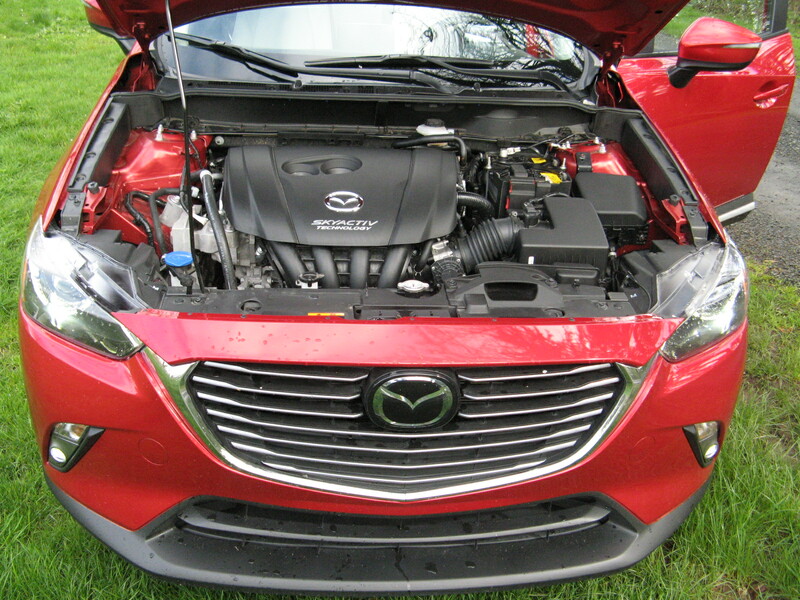 Mazda’s Skyactive high-compression, 2-liter engine generates 155 bhp and returns 40 mpg on the highway. It’s good for about 8-seconds from 0-60 mph and fast enough to get you a very expensive ticket. The economy/performance package revolves around high compression (13:1) and long intakes that go 4-2-1, so that the extra heat can be dissipated. The Mazda 3 has excellent handling, thanks to front/rear sway bars, and has effective disc brakes all round. The dash is well-organized, with my favorite “3-wheels” for temp/mode/fan, and numerous steering wheel controls. The stereo delivers the usual AM/FM/CD/XM/MP3 with Bluetooth hands-free phone capability. Extras include air-conditioning with pollen filter, power windows (one-touch up-down on driver’s side), power door locks, and intermittent front and rear wipers. 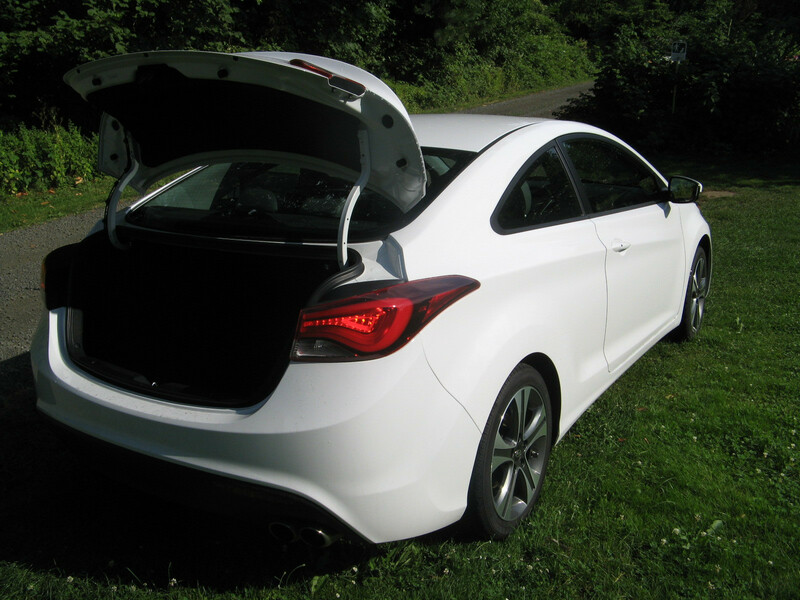 The rear lift gate opens to a good-sized trunk, and rear seats split 60-40. Safety items include multiple air bags, active front headrests, side impact bags, ABS traction control and dynamic stability control. Dislikes: Rear visibility demands a camera, as the high tail for increased trunk space and almost wagon-sized C-pillars create a noticeable blind spot, thankfully now with a warning light and beep. Road noise is the usual problem. 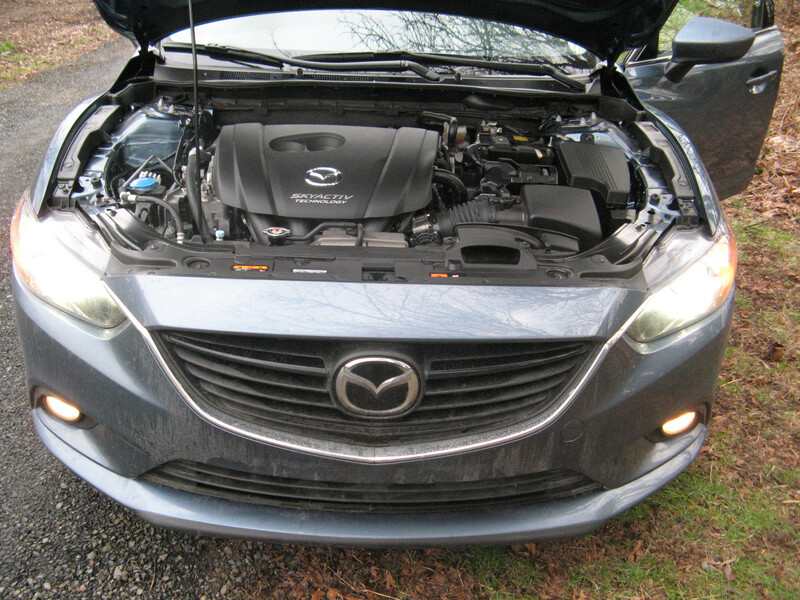 Verdict: The Skyactive engine package gave Mazda a big jump on its competitors when it was introduced, and 40 mpg highway is the price of entry in this class. Road noise is about the same as the Toyota Corolla; it’s annoying but not impossible, like the Honda Civic. The Mazda 3’s gas mileage is up almost 30% from 2011 and it’s competitively priced at a base of $23,500, with just about everything included. This is a driver’s car, that’s quite elegantly designed, beautifully finished, and has a very distinct signature, rather like BMW. Considering that Ford was in partnership with Mazda for so long, it’s amazing how little it learned. Likes: Bulletproof 1.8-liter DOHC 4-cylinder dates back to the 1990s but now has 132 bhp, with variable valve timing and quicker acceleration. Decent road feel through electric power steering, capable handling and excellent 4-wheel disc brakes. Quieter at speed than comparable Honda Civic. Anti-lock brakes, traction control, stability assist, multiple air bags, anti-whiplash front seats, seat belt pre-tensioners. Climate control, simple dash with obvious functions. Excellent stereo with AM/FM/CD/XM/MP3 ipod connectivity, hands-free Bluetooth phone and music streaming, etc. Heated seats with taller side bolsters in S package. 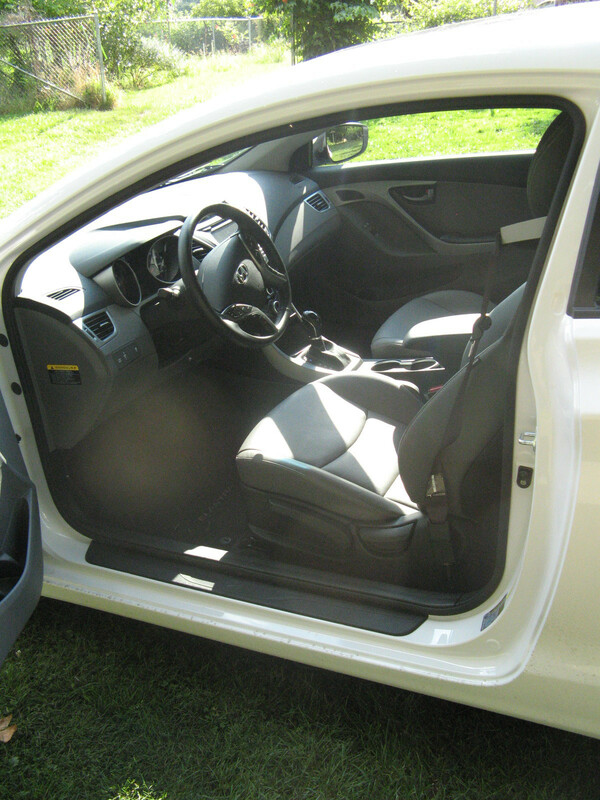 Rear seat legroom increased by a whopping five inches, and rear seat also splits and folds. LED low-beam lights. 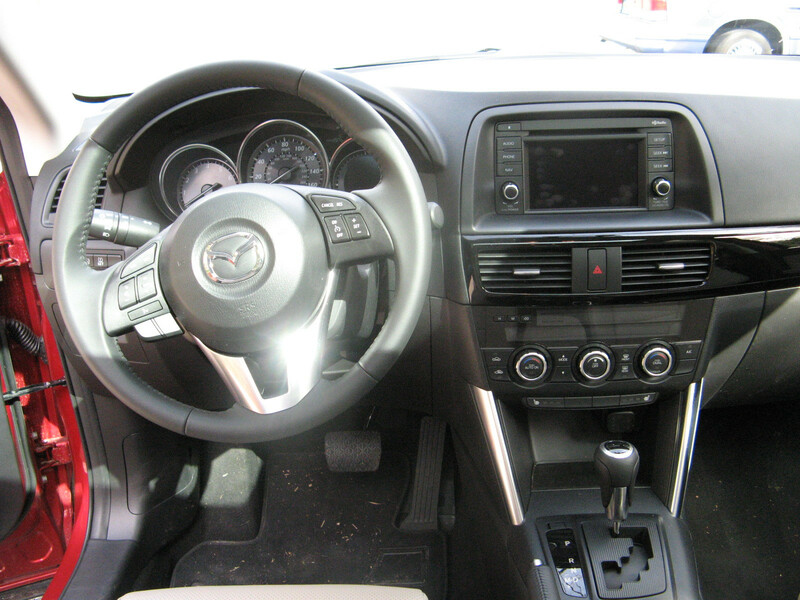 Premium package includes keyless entry and push-button start, navigation with traffic and weather display. Gripes: Continuously variable transmission drones, and still feels like an ordinary box that’s giving up. Paddle shifters pointless, I’d rather have the six-speed manual gearbox. 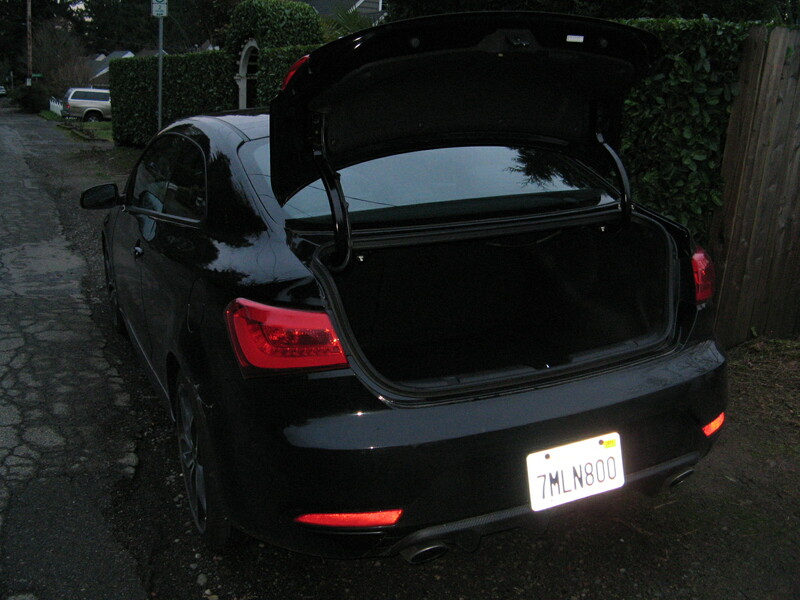 Belt line and trunk seem high, and rear camera is necessary. This is described as an aggressive redesign, but it’s pretty tame. Verdict: Still a durable contender in its market segment (my 1996 has 200,000 miles on it), but it feels like it’s being left behind. When the new Honda Accord is getting 50 mpg and European diesels are headed this way with even better figures, 30 mpg around town from a Corolla is not that impressive. To put it in perspective, the city/highway mileage on this car is exactly the same as on my old car, and that’s not good enough any more. Still, Toyota has thrown every option at the Corolla and still brings it in at $23,000 (and you can save $850 if you nix the sunroof). If this car lasts like my old one, somebody will be driving it in 2030, though I’m guessing the gas mileage will be worse than a new Cadillac by then. 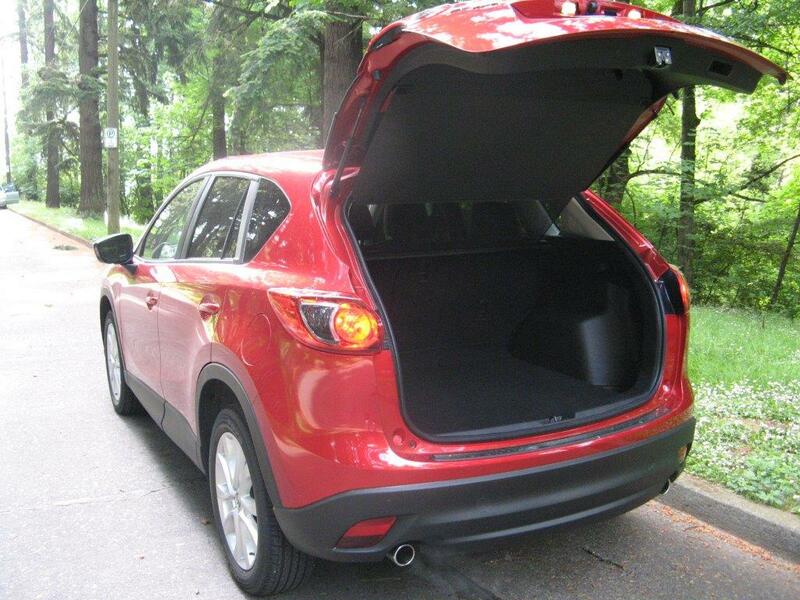 Likes: After a couple of flubs (Tribute, good but slow selling CX-7) Mazda has hit the ball solidly with the CX-5. It’s both sporty and useful, with positive steering, good handling and firm ride. The Skyactive DOHC 2-liter four-cylinder engine is boosted to 184 bhp from 155 last year, with direct injection, variable valve-timing and 13:1 compression to make all that happen. 0-60 comes up in about 8 seconds, not bad for a 3,300 lb AWD SUV. The six-speed automatic transmission can be manually shifted, there are disc brakes all round and the steering is electronic, but has good feel. 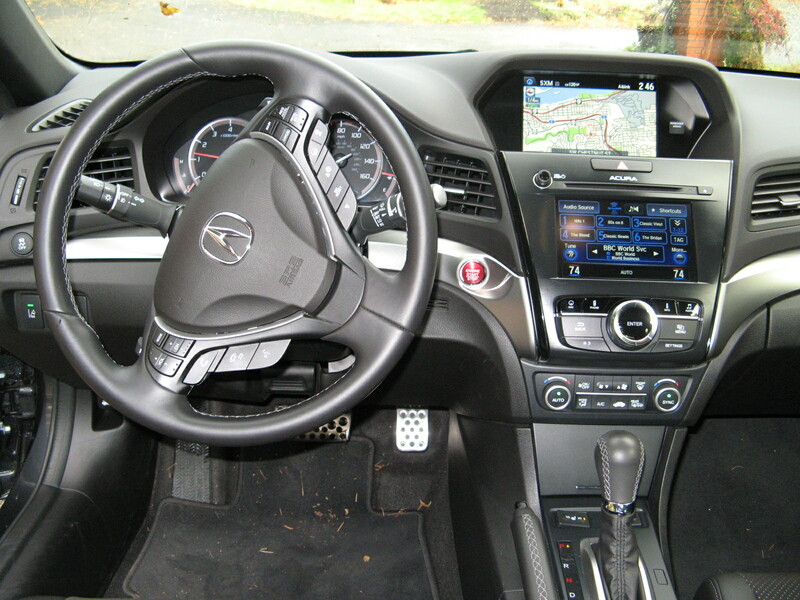 The dash is well-organized and well-finished, including a 5.8-inch screen, with a rear-view camera, and the Grand Touring test car had dual climate controls, heated leather seats (driver’s has 3-position memory), 40-20-40 rear seat split, multiple air bags and rain-sensing wipers. Mulitple airbags were accompanied by ABS, stability control and hill-launch assist. The stereo was a Bose AM/FM/CD/XM/MP3 with Bluetooth hands-free phone capability, and the Nav system was by Tom Tom. Dislikes: Not many. My main gripe from last year – not enough power – has been addressed. 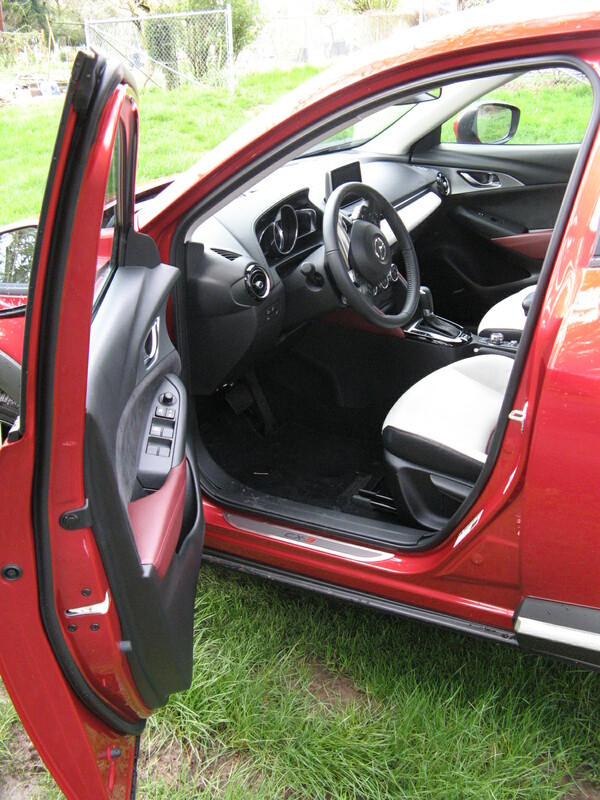 Doors must still be closed firmly or they don’t latch, and that includes the rear hatch. Brake pedal requires firm pressure. Technology package seems a bit steep at $1,825. Verdict: The boost in power and generally sharper exterior design makes this a very competitive rig. It reminds me a lot of what the first Subaru Forester first set out to do, 15 years ago, being smaller than the CX-9 and CX7, but better looking and and more efficient. Call it sensible shoes in a bright Soul Red color. Now, click your heels. Likes: Mazda is concentrating on its Skyactive high-compression, 155hp, 2-liter engine, which returns 40 mpg on the highway. It’s a little slow on takeoff, but it’s still fun to drive, and the 6-speed auto transmission shifts quickly and has a manual override, if you’re fidgety. The secret to the economy/performance package is high compression (13:1) and very long intakes that go 4-2-1, so that the extra heat can be dissipated. The Mazda 3 has decent handling, thanks to front/rear sway bars, effective discs all round, and does 0-60 in about 8 seconds. 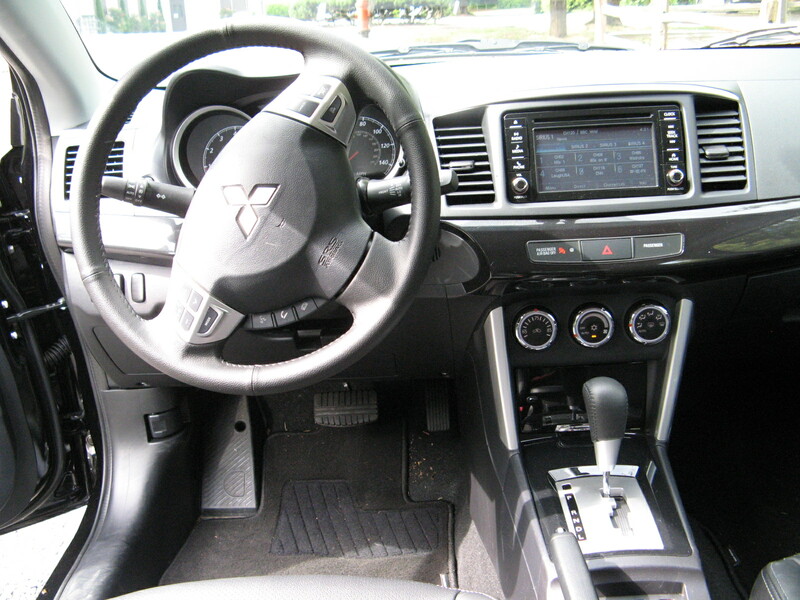 The dash is well-organized, with my favorite “3-wheels” for temp/mode/fan, and numerous steering wheel controls. The stereo delivered the usual AM/FM/CD/XM/MP3 with Bluetooth hands-free phone capability. Extras include air-conditioning with pollen filter, power windows (one-touch up-down on driver’s side), power door locks, and intermittent front and rear wipers. 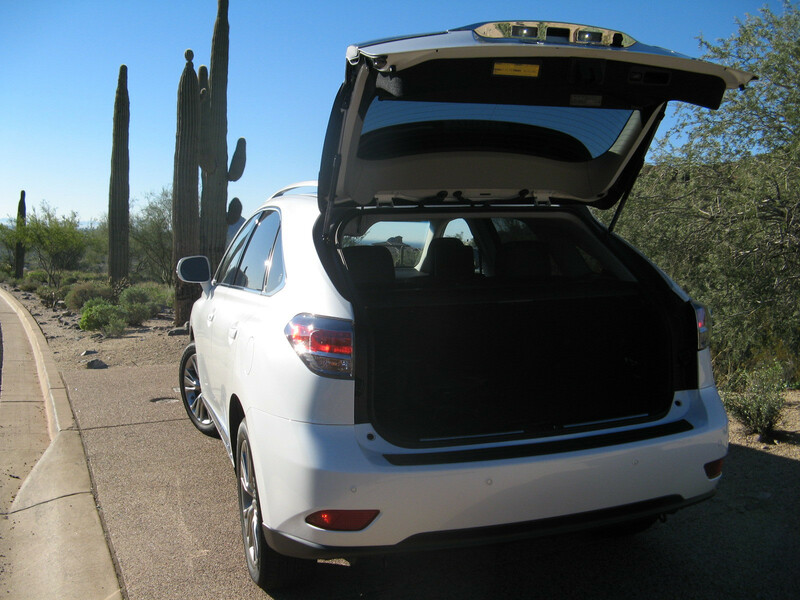 The rear liftgate opens to a good-sized trunk and rear seats split 60-40. Safety items include multiple air bags, active front headrests, side impact bags. ABS traction control and dynamic stability control. Dislikes: Rear visibility demands a camera, as the high tail for increased trunk space and almost wagon-sized C-pillars create a noticeable blind spot. Road noise is the usual problem. Verdict: The Skyactive engine package gave Mazda a big jump on its competitors when it was introduced, and 40 mpg is now the target for this class, which includes the Toyota Corolla, Honda Civic and Subaru Impreza. The Mazda 3’s gas mileage is up almost 30% from the 2011 model and it’s competitively priced at a base of $23,500, though I’d pass on the $1500 technology package on this car. It smacks of the old “undercoating and Scotch guard interior treatment”. Thank God the Cheshire Cat grille is almost gone. 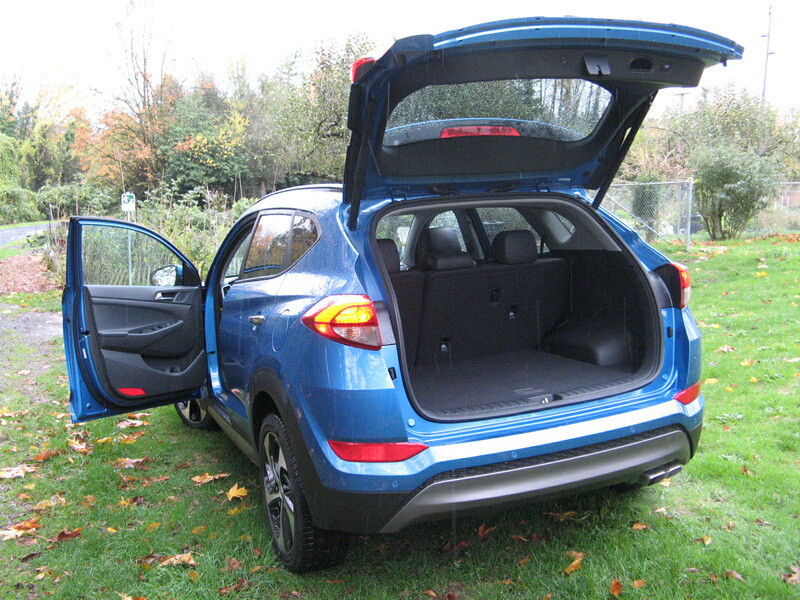 Likes: Top-of-the-line Sportage is handsome effort to get away from crossover box . Excellent finish, very fast, with 0-60 mph in 6.5 seconds, from 260 bhp, DOHC, 2-liter Turbo, 4-cylinder. 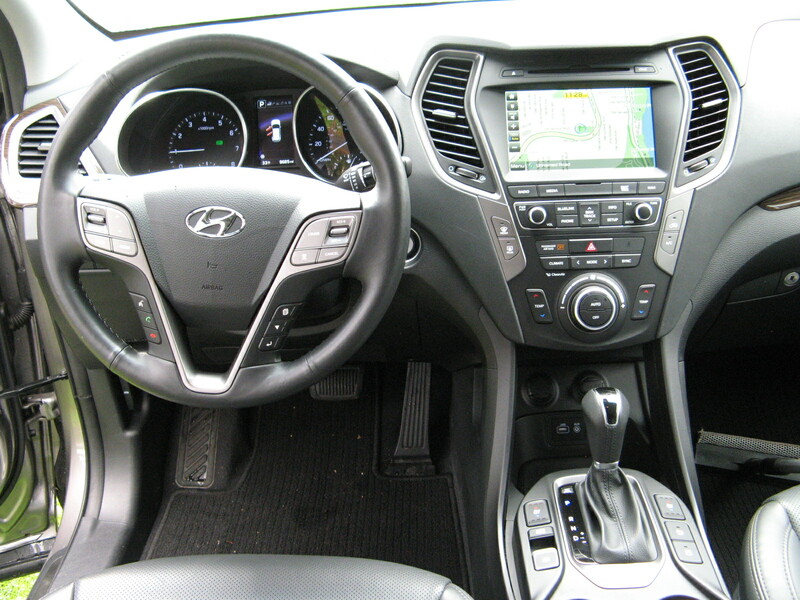 All-wheel drive includes locking cetral diff, 6-speed auto, all power, a/c, cruise control, electronic power steering. Extensive safety equipment includes stability/traction control, downhill brake control, hillstart assist, multiple airbags, rollover sensors, seatbelt pre-tensioners and active head restraints. Good brakes, handles well. AM/FM/MP3/XM/CD with iPod and USB jacks and Bluetooth hands-free phone. Dual climate controls, push button start with smart key. SatNav with Sirius traffic; premium package includes leather interior, heated front seats (driver’s seat cooled), panoramic sunroof, ato-dim mirror, cargo cover, heated, folding mirrors.100,000-mile warranty with roadside assist. Gripes: 16 mpg is unacceptable around town. 54 cubic feet of storage is 25 per cent less than RAV 4 or CRV. Firm ride may annoy some passengers, fairly tight rear seat. Miserable rear visibility makes. Backup camera essential and mirrors must be checked carefully. Verdict: Give Kia credit for pushing the limit of style in this segment, with consequent compromises in space and visibility. Kia got away with this approach with the Soul, so it may work. Comparison shoppers who need more room should check out the new Mazda CX-5, Toyota RAV-4, Honda CRV, Subaru Outback and Ford Escape. Buy a little Tom Tom instead of the $1,200 Nav package and eschew the $2,000 luxury package and you’re down to $29,200, which is competitive. But the gas mileage is a deal-breaker for me. 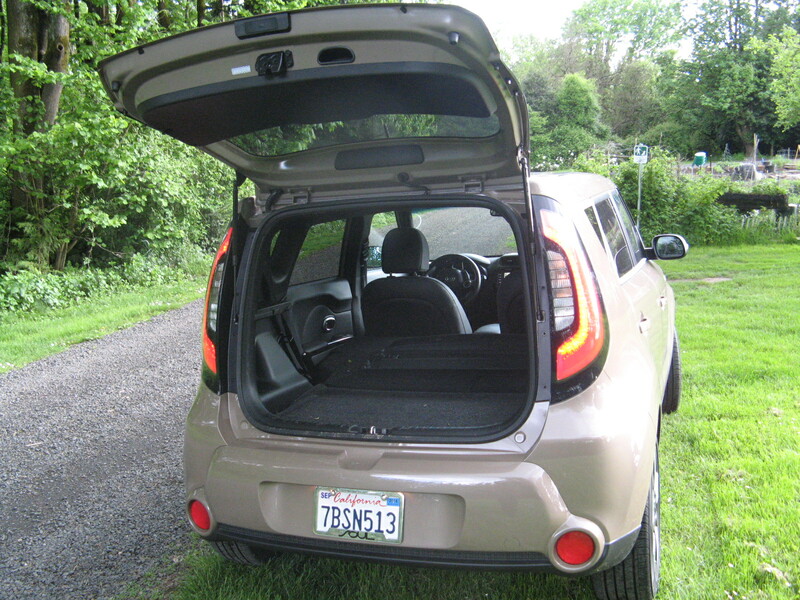 Gripes: Not as much storage as some competitors (the Scion xB has 70 cubic feet). Could be quieter, AWD would be attractive option. Dashboard design still a bit clunky. 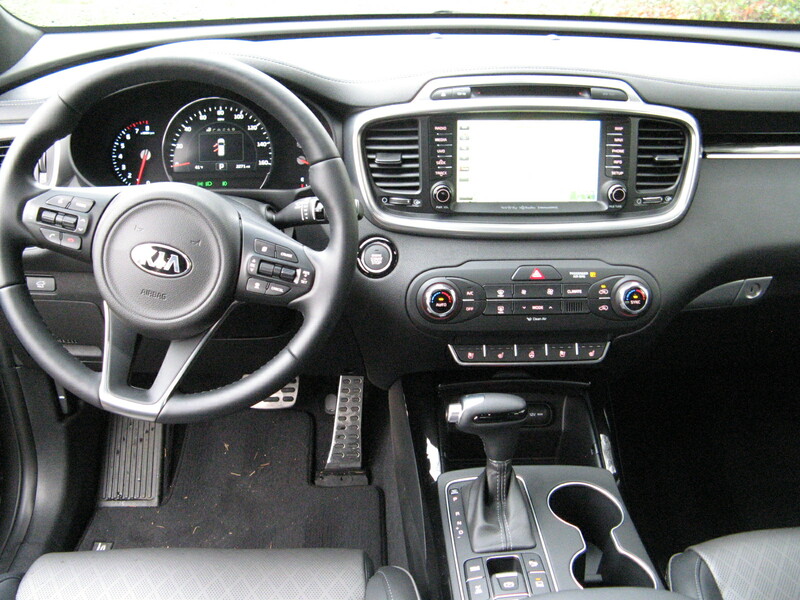 Premium package is a whopping $2,500 for Nav, Sirius, heated leather seats and auto climate control. 22.9 mpg is marginal, and I’d have to think hard about that. By the way ! is the top line package. Really. Verdict: This charming small wagon is good value and has been a big hit for Kia with 115,000 sold in 2012 – more than the entire Scion line. The 164 bhp engine scoots it right along, and it handles quite well for a tall box. Too bad Kia seems to have dropped last year’s Track’ster idea. That chopped, three-door concept, had a 250-horsepower turbo four, 6-speed manual transmission, fender flares, wide wheels, and electronic all-wheel drive. Unsually for Kia, I’d say it’s missing a bet. Gripes: Some highway noise, but nothing like the little Hondas. As I said last year, $2,350 seems like a lot for navigation, push-button start, a sunroof and leather seats. Buy a Garmin and take a vacation. Suspension is on the choppy side of firm, but handling much more capable than older models. Verdict: The Kia Rio remains a good-looking contender, with the top level SX having a base price of only $17,700. We’re approaching the end of the model year, so look for deals. City mileage was 30 mpg, which is enough that you quit calculating it. Likes: Another handsome effort to get away from crossover box. Excellent finish, nippy 264 bhp, DOHC, 2-liter Turbo, 4-cylinder. All-wheel drive includes locking central diff, 6-speed auto with manual override, all power, a/c, cruise control and an adjustable electronic power steering. Safety equipment includes stability/traction control, downhill brake control, hillstart assist, multiple airbags, seatbelt pre-tensioners. Good brakes, handles well. AM/FM/MP3/XM/CD with iPod and USB jacks and Bluetooth hands-free phone. Dual climate controls, push button start with smart key. SatNav with Sirius traffic; premium package includes leather interior, heated front seats (driver’s seat has lumbar support), 40/20/40 rear seats recline, panoramic sunroof, auto-dim mirror, cargo cover, heated folding mirrors, side-window sunshades. 10-year, 100,000-mile powertrain warranty ,with 5-year roadside assist. Gripes: 18 mpg is unacceptable around town. Adjustable steering a bit numb on all settings. Restricted rear visibility makes backup camera essential, and mirrors must be checked carefully. Adding $6,000 of extras seems a bit much. 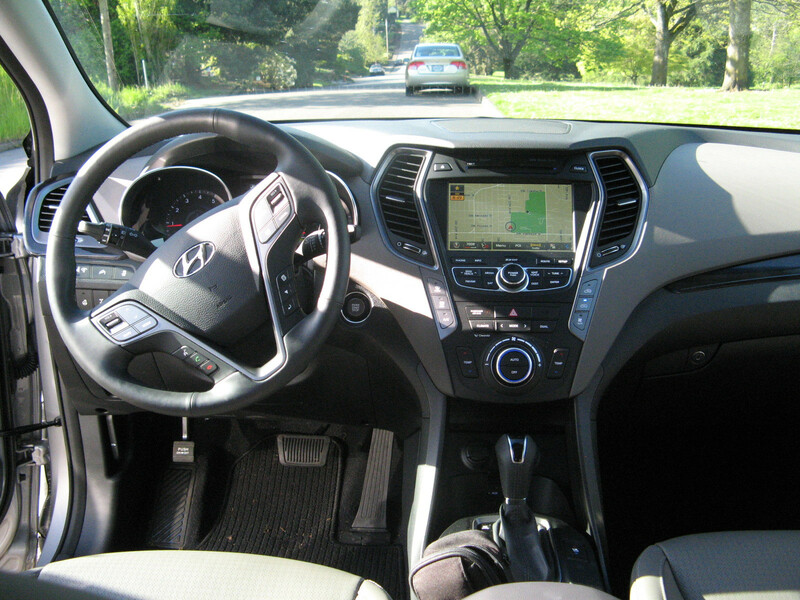 Fun to drive ***Fun to look at ***Overall experience**Verdict: The Santa Fe Sport is now the 5-passenger SWB version of the line as the Veracruz will return for 2014 as the 6/7-passenger LWB model. Just like Kia, Hyundai is determined to think out of the box (literally), though I think somebody in design has a picture of the 1999 Isuzu Vehicross on his desk. Comparison shoppers should check out the new Mazda CX-5, Toyota RAV-4, Honda CRV, Subaru Outback and Ford Escape. Like the Kia’s Sportage’s 16 mpg, the Santa Fe’s 18 mpg city is a deal-breaker for me. Chevrolet Cruz Hybrid was one winner in the face-off. The world of electric cars is changing rapidly but it was still quite an achievement for Bengt Halvorson of the Northwest Automotive Press Association to gather 17 electric, diesel and hybrid vehicles for Drive Revolution, a comparison test at the Oregon Museum of Science and Industry on July 11. It certainly seemed like a “Portlandia” event in the self-proclaimed greenest city. Press fleets rarely have more than one or two oddballs on each coast and the vehicles had to be shipped to Portland, Oregon, especially the six pure electrics, which couldn’t driven in further than Hood River anyway. On hand were 18 journalists who chose their favorite cars in each of the three categories at the end of the day, and 15 manufacturer’s representatives to answer questions. Electric cars included the Fiat 500E, Ford Focus electric, Mitsubishi – MiEV, Honda Fit, Nissan Leaf, Smart Electric and Scion iQ, which was a late arrival, and not insured for us to drive. That summarizes Toyota’s marketing of that unfortunate vehicle. I drove one 750 miles in the UK, and thought it excellent. 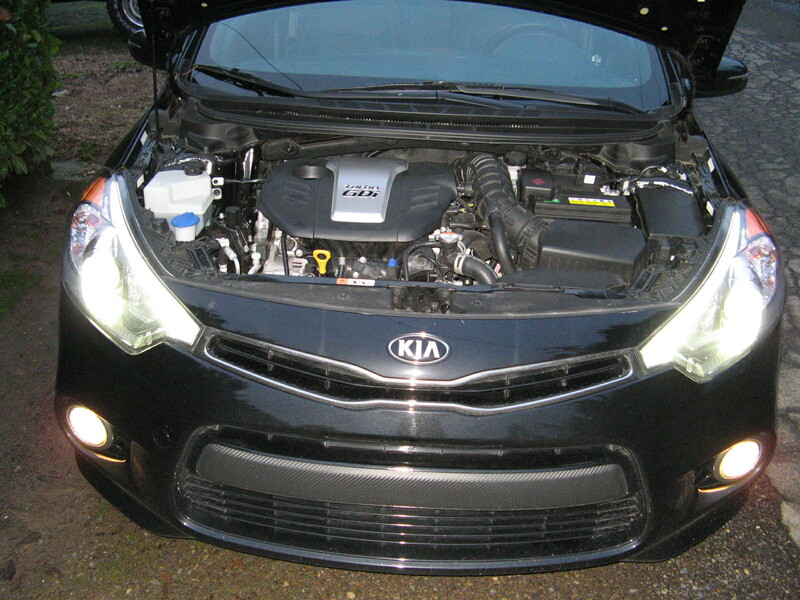 Hybrids were the Chevrolet Volt, Ford C-Max, Kia Optima, Lexus LS 600h L, Toyota Prius V, Volkswagen Jetta. The Fiat 500E, above, was an electric winner. Diesels included the Audi A8L TDI, Chevrolet Cruze Turbo, Mercedes Benz GLK 250 Blu-tec Turbo, Volkswagen Beetle TDI convertible, Volkswagen Passat TDI. Winners were: Electric: Fiat 500E; Hybrid: Chevrolet Volt; Diesel: Chevrolet Cruze Turbo. 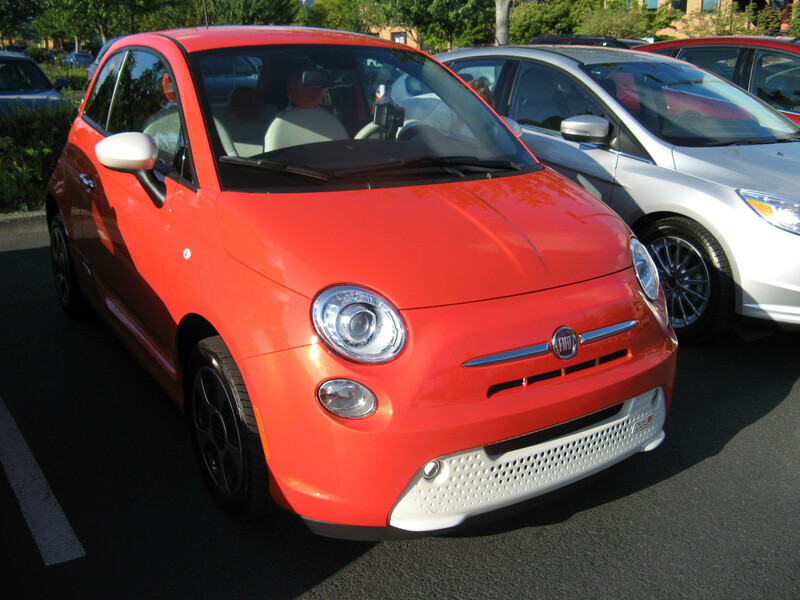 I agreed with the Fiat 500E electric coupe, which was a blast to drive – for about 60 miles anyway. It will undoubtedly win many stoplight races, chirping tires at will, was finished in Electric Orange Metallic and had a stylish interior in orange white and black that could only be Italian. Available only in California for now, it retails for $33,495 – but when did you see an electric car that was more than just sensible shoes? This is a 4-inch, high-heeled, single-strap stiletto from Milan. 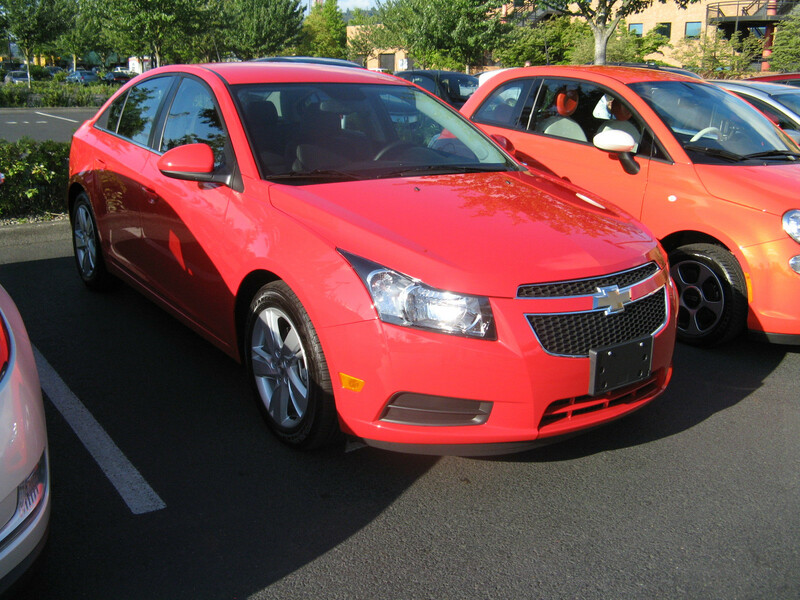 The Chevrolet Cruze made it two wins for The General, but I thought it noisy, and neither stylish or well done. At $25,795, it was undoubtedly good value and a handy performer, but against the $28,690 Volkswagen Beetle convertible TDI, it was just an airport rental car. In bright white, with a black leather interior, the VW convertible is an even better upgrade of the funky New Beetle, than the curved windshield Super Beetle was in 1972 over its iconic forefather. Speaking of airport rental cars, the two electric Honda Fits were also blisteringly fast in “power mode” but you couldn’t get away from the idea that every penny that could be pinched, had been. Equally surprising was how old-fashioned the Smart car now feels. Electric or not, 1998 was 15 YEARS ago, and it sure feels like it. The Mitsubish i-MiEV seems to work well enough, but it’s oddly proportioned for American roads, as tall and narrow as one of those little “toaster” vans you see running around airports. Overall, it seems that electric and hybrid offerings fall into the “so goofy it must be alt-power” like the Mitsubishi iMiEV, Nissan Leaf, Toyota Prius or original Honda Insight, or so bland you can’t tell what powers it, like the Ford Focus and Fusion, Honda Civic and Accord, Chevrolet Cruze, Toyota Camry, or Highlander. Also, please can we get away from little car diagrams with colored arrows zooming back and forwards to tell you if you’re accelerating or decelerating. If you don’t know that, should you even be driving? How about a screen in the back, for the occupant of the child seat, instead? Oh, no “green” symbols either, please. I really don’t like my dash being engulfed by green vines, like Sleeping Beauty’s castle. For what it’s worth, my runners-up were the Mercedes Benz GLK 250 Blu-Tec 4-Matic, which was surprisingly fast with a 200 bhp, 2-liter turbo diesel at $50,485. I also picked the Kia Optima hybrid, which is handsome and has been tweaked to have a much better power delivery, this year. It costs $32,275. In the electric class, I was also impressed with the overall finish of the Nissan Leaf, at $36,910, even though it still looks funny. The Leaf’s price was cut this year this year and (probably as a result) it sold 2,225 units in June, four times last June’s total. The Ford C-Max and Fusion electric seemed acceptable in most regards, but I dislike the distracting and unreliable touch-screen almost as much as the 68 buttons on the Cadillac Allante dash, and that rules them out for me. Ford is also scrambling to increase hybrid mileages to approach the sticker claims, offering technology upgrades. Stay posted on that. Like buyouts at The Oregonian, this may be only the first one. As a final note, with U.S. sales on track for over 15 million units this year, how ARE the electrics and hybrids performing? After 6 months, the Toyota Prius is the leading hybrid, with a total of 116,000 liftback, C and V models sold. 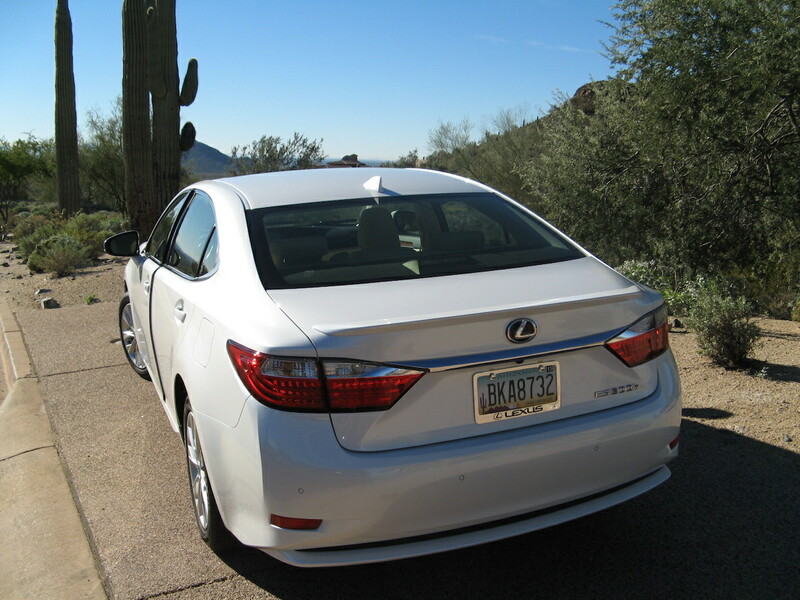 The surprisingly good Toyota Camry hybrid has sold 23,834 units and the Lexus hybrid variations total 20,742. Ford’s C-Max hybrid wagon has sold 17,858 units, the Fusion hybrid 20,283. 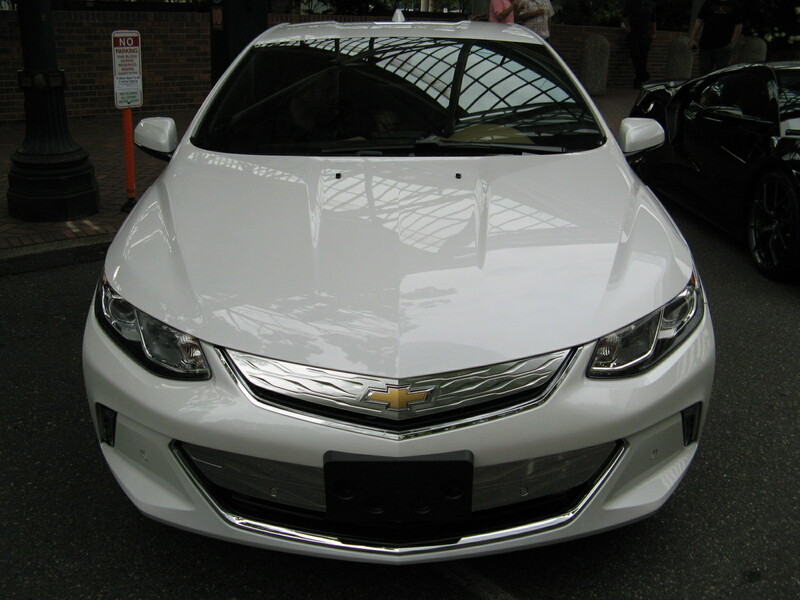 The Chevrolet Volt has 9,855 units out the door. In the pure electrics, nothing comes close to the Leaf’s 9,839 6-month total. Likes: Overall, still the benchmark family sedan. 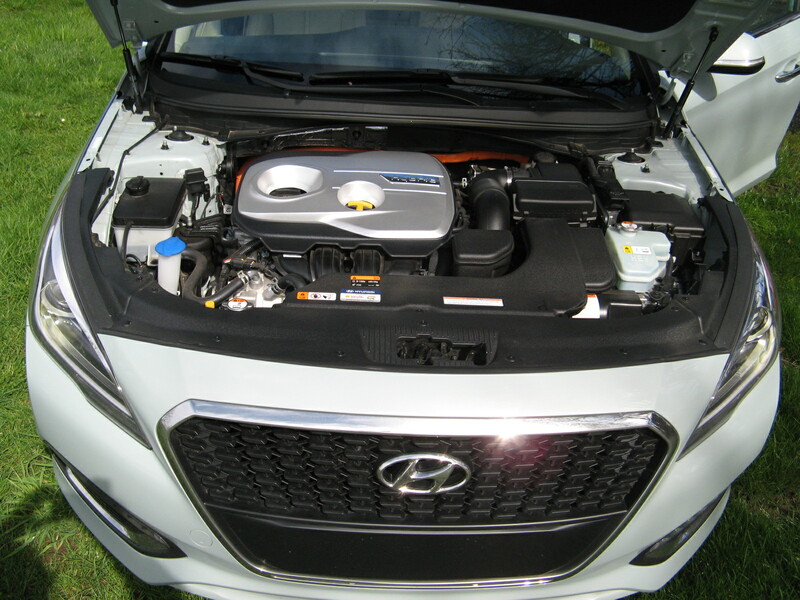 2.4-liter, 189 hp V-TEC, 4-cylinder with variable cylinder management is adequate, 10 airbags, vehicle stability assist, brake assist, tire pressure monitoring, pre-tension seat belts, active front head restraints. Handling, brakes and steering capable. Solid finish, plenty of room, smart instrument layout, dual-zone climate control, power driver’s seat, windows, locks, huge trunk with pass-through, rear view camera. 160-Watt AM/FM/6CD/MP3 radio with Pandora and bluetooth. Will probably last 300,000 miles. Dislikes: Plain Jane Accord is $8K cheaper than loaded V6 version, but it’s not fast, has lots of highway noise and the CVT transmission is annoying. 23.5 mpg around town, so 35 mpg highway might be a stretch. 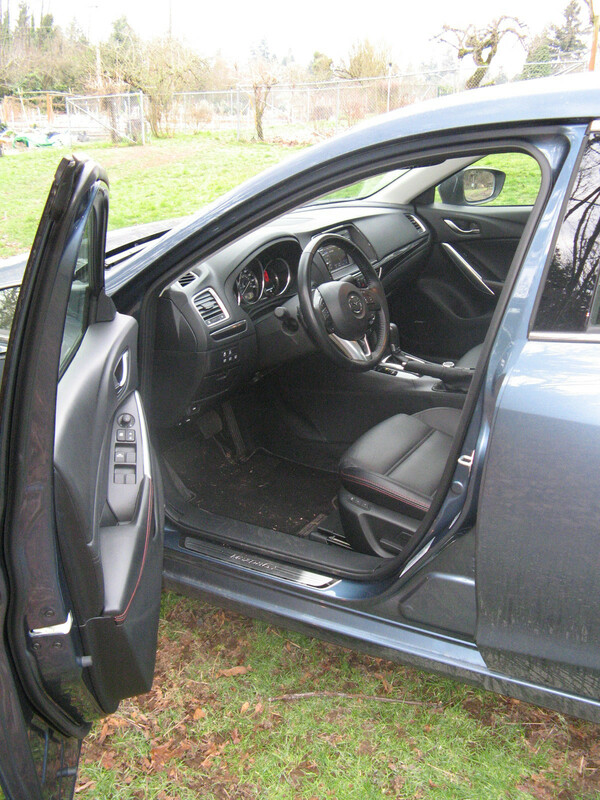 Cloth interior still cheap for an Accord, rear seat does not fold down. No XM radio. Unlocking doors to let passengers out is a pain. Cheaper wheels and tires can be curbed. Verdict: Still a good lesson in not cutting corners, the upgraded version of this car is significantly better in all regards and will be much more fun to own. I’d opt for a low-mileage or leftover 2012 V6. Likes: Excellent design blends Sonata cues into a useful five-door hatchback. 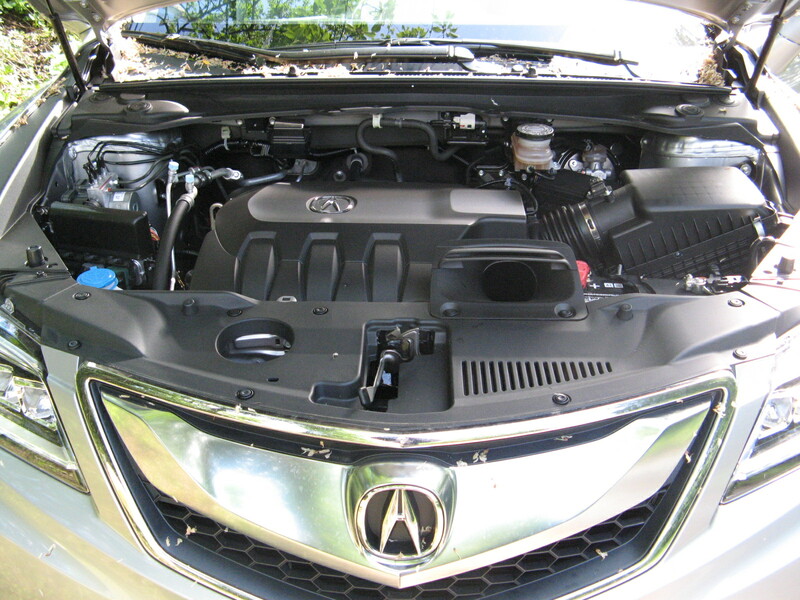 148 hp, 1.8-liter DOHC 4-cylinder has variable valve timing, and is faster than you think. 6-speed auto trans is quick-shifting, with tilt-telescope wheel-mounted paddles for the fidgety. Stylish interior is well-finished, with panoramic double sunroof. Gauges well placed, controls simple and obvious and 7-inch Nav screen very sharp. Disc brakes all round, dual-zone climate control, multiple air bags and curtains, active head rests and belt pre-tensioners, ABS, traction control, electronic stability, power windows, mirrors, remote locking. 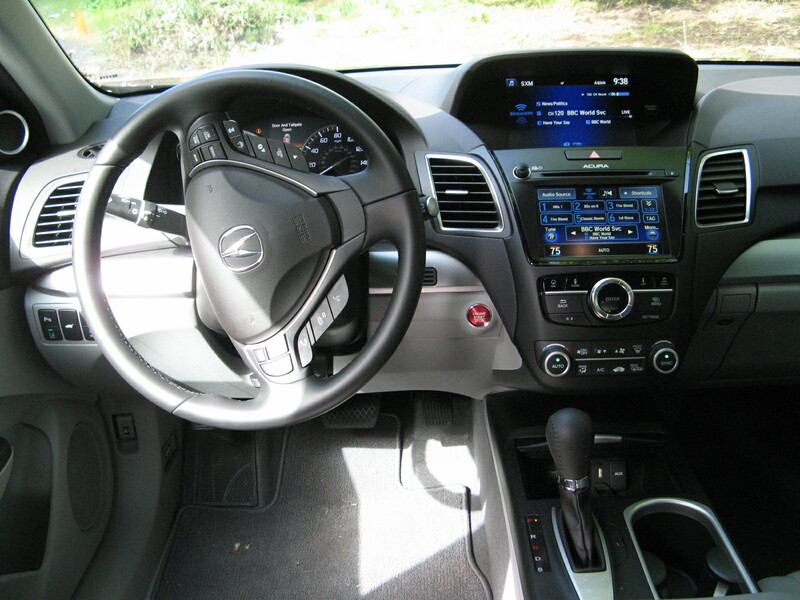 Nice interior materials, heated leather seats. Back seat suprisingly OK for adults. 7-speaker AM/FM/CD/MP3 XM stereo, Bluetooth. 14.8 cu ft trunk, and 100,000-mile, 7-year transferable warranty. Surprisingly quiet on the highway (take note: Honda and Nissan). Dislikes: The same old complaint about mag wheels and curbs and these wheels were really nice. Steering rather dead on center, front spoiler rather low for parking blocks. Verdict: Very pretty car, with good manners. Combines bargain price with decent performance, good looks and decent inside space. 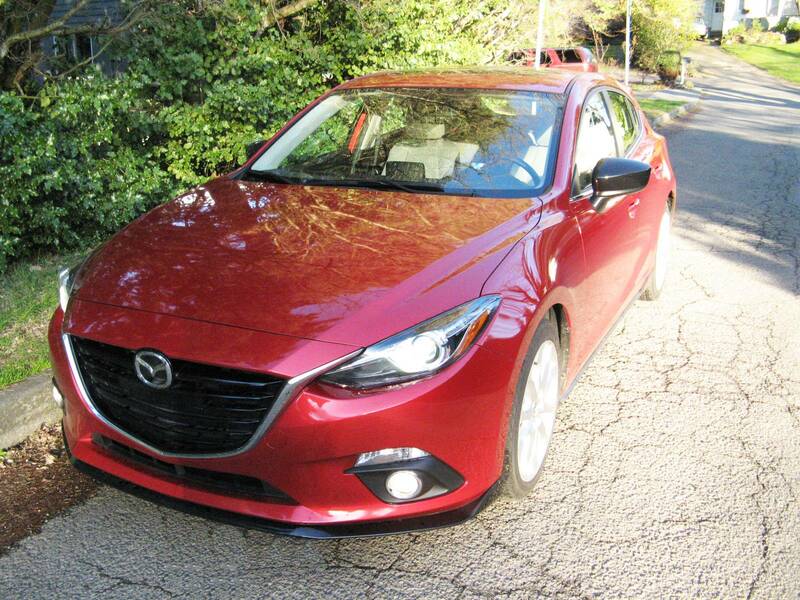 In all, an excellent package for $24K, a hatchback sedan that’s really got away from the four-door Rabbit effect. Despite the recent fuss, estimated mileage was about right. I’d have preferred a 6-speed stick. Likes: Capable mid-size sedan with every bell and whistle you can imagine. 3.7-liter SOHC, 310 horsepower VTEC V6 has plent of zip, 6-speed auto is worth using manually with paddles. 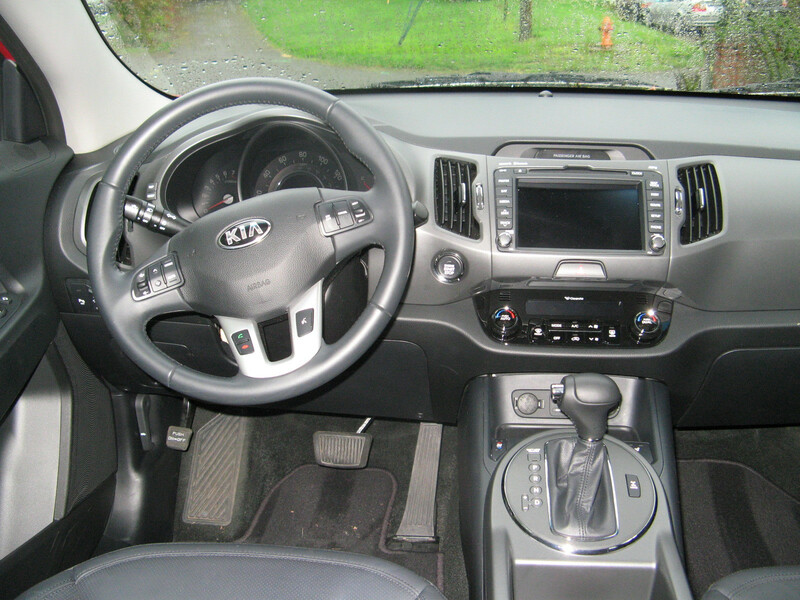 Controls simple, all seats are heated leather and front seats are 12-way adjustable, multiple safety systems, include airbags, traction control, adaptive cruise control, lane keeping assist, departure warning, blind spot information, collision mitigation braking, navigation with voice recognition, real time traffic conditions, AM/FM/DVD-A/CD/DTS/XM radio, with 14 speakers, Bluetooth hands-free phone. Power moonroof, navigation with voice recognition, automatic brake warning, very cool multiple jewel LED headlights. Dislikes: Expensive and, dare I say it, over-engineered. Still with no cachet. Bland exterior. Thirsty. Verdict: Acura ditched the slow selling AWD RL (379 total sales in 2012) for the front-wheel drive RLX, clearly aimed at the 5 series BMW. Even with the RLX’s four-wheel steering, an Edmunds track day determined that a 2011 BMW 535i came out ahead on every category. Then there’s the issue of branding, which leads to resale demand. BMW sold 56,798 5 Series sedans in 2012. That popularity is likely to be sustained throughout the 5 Series life, while Acura is looking more and more like an expensive historical footnote. Likes: If it ain't broke, don't fix it. 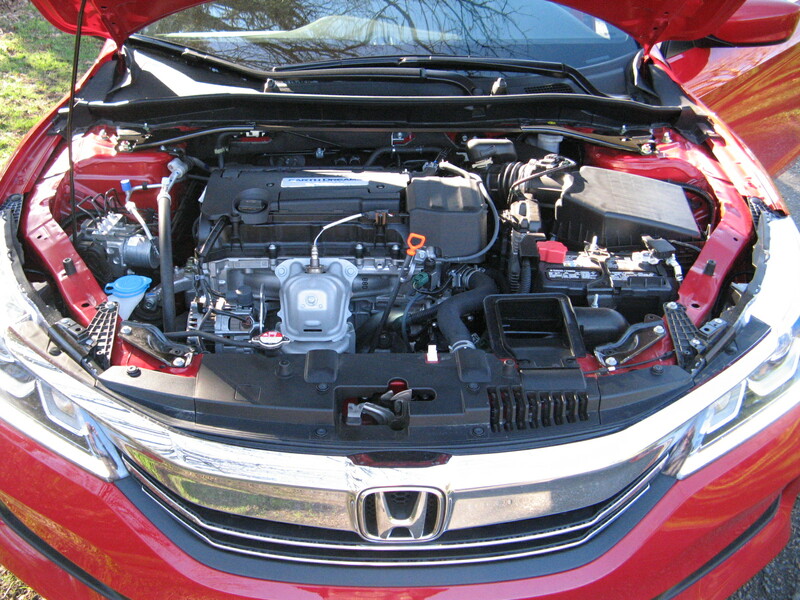 Still the class leader; 248-horsepower, 3.5-liter V-Tec, SOHC V6 provides 0-60 mph in 7.9 seconds. Six-speed automatic, 4-wheel disc brakes. 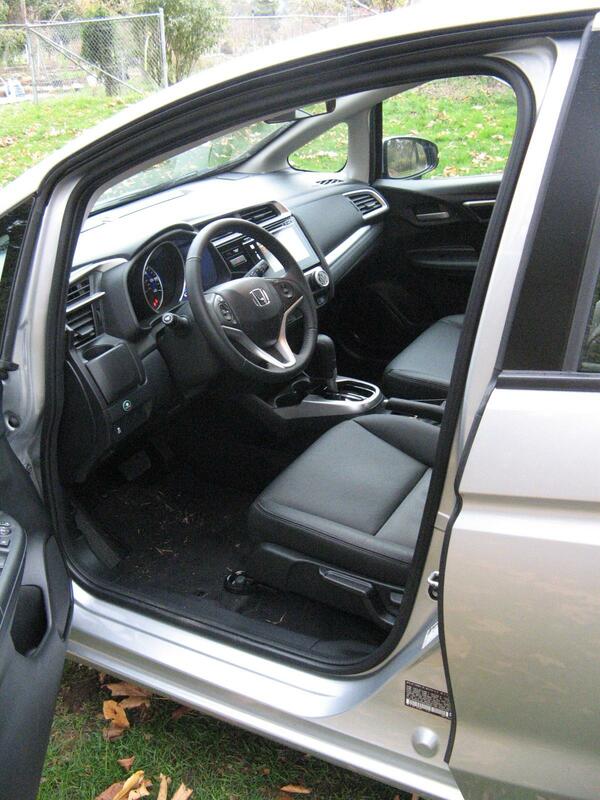 Heated front seats, can take seven adults easily, rear access is reasonable. Second row center seat can be moved forward to accommodate child seat, tumble-home third row disappears into floor. Tilt-telescope wheel, multiple-zone climate control, navigation with voice recognition, 16” DVD in rear can be split for two functions. 12-speaker AM/FM/DVD/XM stereo with MP3, Bluetooth, USB port and headsets. Noise-canceling technology quiet at highway speed, Superior brakes and handling for a minivan, multiple airbags, power everything, brake assist, electronic brake distribution, power moonroof, rear view camera, blind spot warning, two power sliding doors, power tailgate. Enormous: 38 cubic feet with all seats in place, 93 when third row folded, 148 when second row removed. 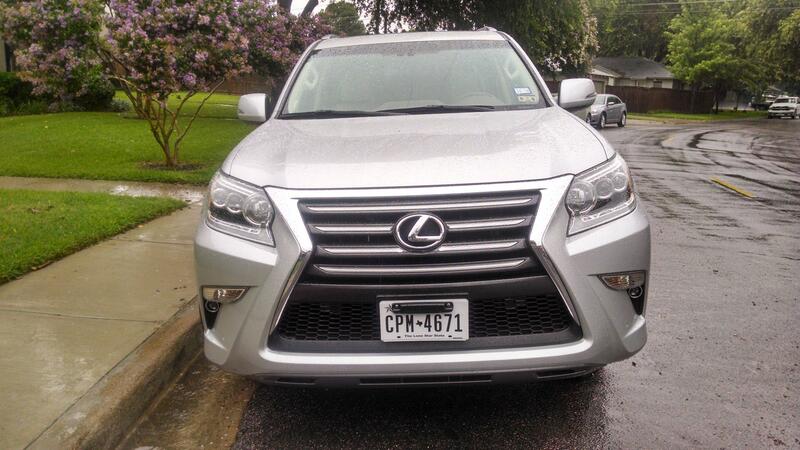 Dislikes: Expensive when fully loaded, though LX model does start at $28,675. Dash controls busy (80 buttons), power side doors are fiddly to work. 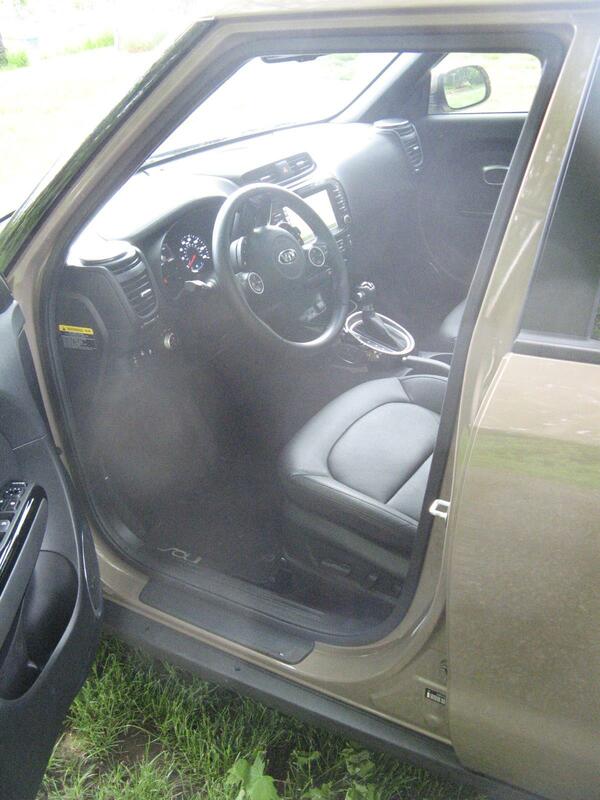 No door lock on passenger side; if you have to use key, you must risk stepping into traffic. Second row seats must be removed for maximum storage; they do not fold forward or down, which is a nuisance. No 4WD availability. Verdict: Still the best mini-van you can buy – though you won’t spend this much unless you have a job for it to do. That said, it’s a no-brainer, with near Accord performance in something that feels twice as big. Tumble-home third row seats a brilliant idea. However the Toyota Sienna offers AWD – and at this price you’d probably want it – while the Nissan Quest has a second row of seats that fold away. Still, if you have multiple kids who play sports, you can figure on a useful 250K miles from the Odyssey. This might be the only car your children know, until they get their driving licenses. 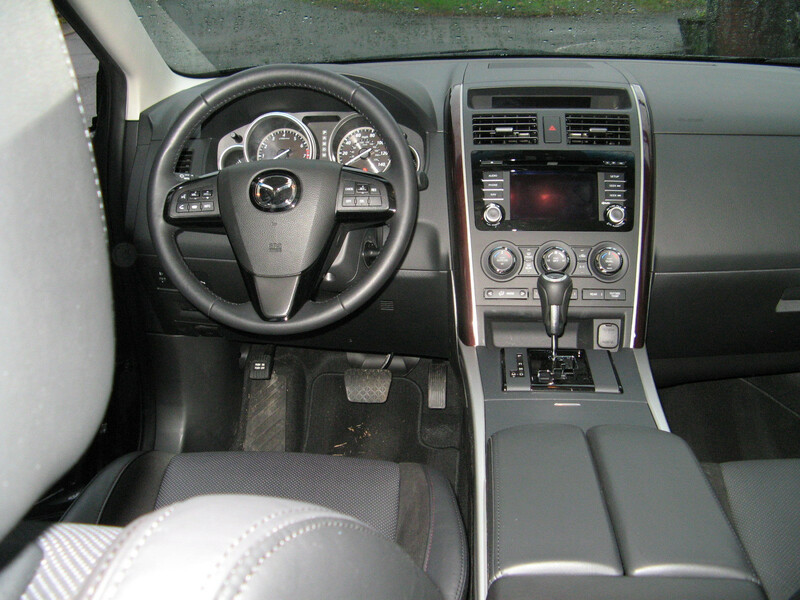 Likes: New Mazda SUV is sporty and useful at the same time, with positive steering, good handling and firm ride. In fact it won NWAPA’s compact category in the 2012 Mudfest contest. The Skyactive DOHC 2-liter four-cylinder engine offers 155 hp, with direct injection, variable valve-timing and 13:1 compression to make all that happen. 0-60 comes up in about 8 seconds, not bad for a 3,300lb AWD SUV. The six-speed automatic transmission can be manually shifted, there are disc brakes all round and the steering is electronic, but has good feel. 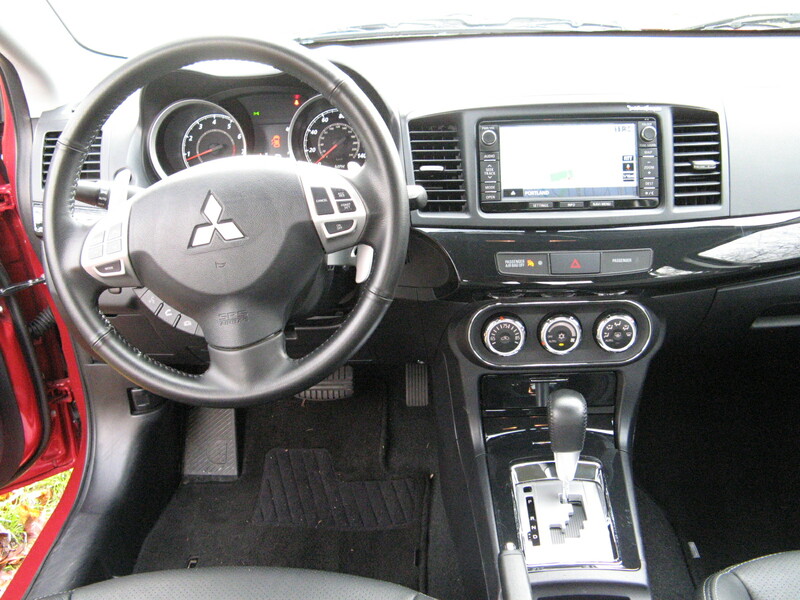 The dash is well-organized and well-finished, including a 5.8-inch screen, with a rear-view camera, and the test car had dual climate controls, heated leather seats (driver’s has 3-position memory), 40-20-40 rear seat split, multiple air bags and rain-sensing wipers. The stereo was a Bose AM/FM/CD/XM/MP3 and Bluetooth hands-free phone capability. Dislikes: Not many. It must be driven hard to be quick, which suggests towing anything bigger than a Sunfish might be a challenge. 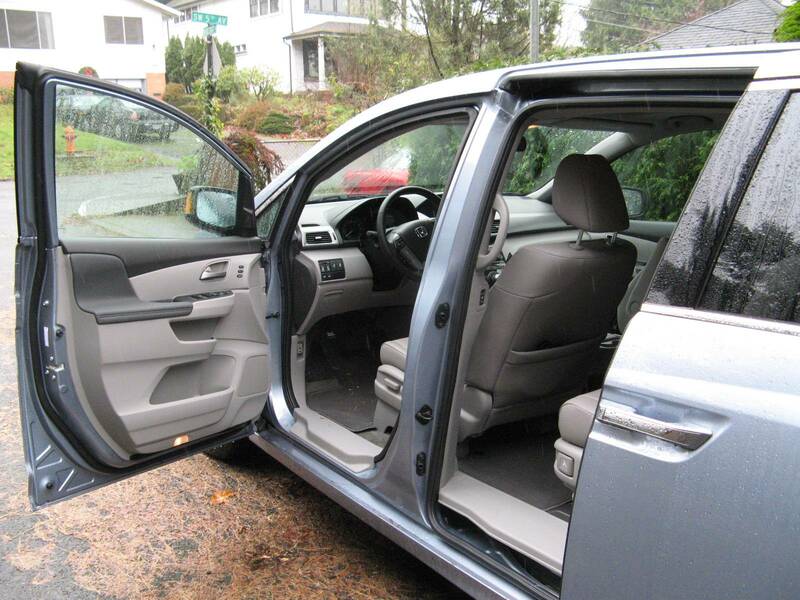 Doors must be closed firmly or they don’t latch, and that includes the rear hatch. I’d rather have the 6-speed stick than the 5-speed automatic, to get the best out of the revvy motor. Brake pedal requires firm pressure. Verdict: This reminds me a lot of what the first Subaru Forester first set out to do, 15 years ago. It’s noticeably smaller than the CX-9 and CX7, but boxier and more practical. It’s lively and fun and does not assume you’re going seriously off road or will be pulling a trailer. Thank God the Cheshire Cat grille is gone. Now, where are my sensible shoes? Likes: If it ain't broke don't fix it. Best seller in segment since 2007 and sold 281,652 units last year, 100,000 ahead of #2 RAV-4. 185 hp, 2.4-liter DOHC 4-cylinder engine with variable valve timing is surprisingly nippy, 5-speed auto very smooth. Intelligent all-wheel drive, multiple airbags, vehicle stability assist, electronic brake distribution, brake assist, tire pressure monitoring, pre-tension seat belts, active front head restraints. Simple climate controls. Handling, brakes and steering excellent. Enormous console storage, simple controls, 71cubic-foot storage area with covered rear, split rear seat with ingenious, sprung and fold-flat arrangement. 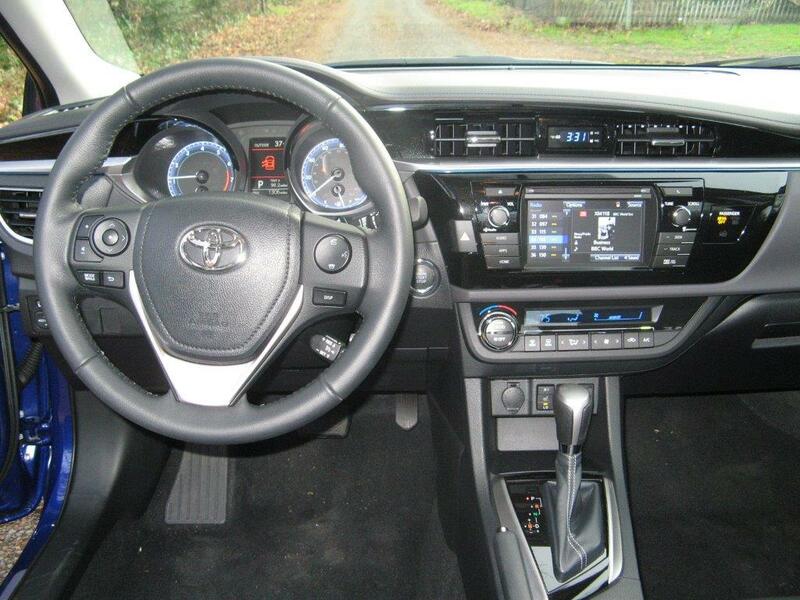 Heated leather seats, straightforward Navi system, moonroof, rearview camera. 270-Watt Pandora AM/FM/6CD/MP3/XM radio, with Blue Tooth and traffic. Surprising 26.5 mpg in the city. Dislikes: Could be quicker but 30 mpg is a good trade-off. No third seat, and limited towing capacity with 4-banger. Verdict: Jury’s out this year, with a vastly improved Toyota Rav-4 coming to market. My guess is it will take sales from the others and the CR-V will stay comfortably ahead, until the next redesign. Will last for 250,000 miles, and buyers could reasonably expect their children to go from baby seats, to driving it to the prom. Likes: Handsomely redesigned, immensely capable grand routier, easy to drive fast, comfortable and predictable. 3.5-liter DOHC 24-valve Atkinson-cycle V-6, produces 286 hp, 254 lb-ft of torque but permanent magnet electric motor gives a combined power rating of 338 hp. The front electric motor handles the charging, rear adds power when you want it. Surprisingly fast in sport mode, when eco-meter turns into tach. 0-60 in 5.7 seconds; top speed limited to 136 mph. CVT transmission has manual shifting mode, but adapts to dual-power system quite well. Beautiful finish, heated and cooled comfortable seats, very quiet at speed and 35 mpg on the highway. Sun shades for rear passengers. Three-zone climate control. Multiple airbags; all current safety devices, including collision avoidance and lane-change warnings. Mark Levinson stereo, heated and cooled seats, speed-sensitive steering. Gripes: Navigation system still not intuitive, console infotainment “mouse” control annoying. Verdict: Unobtrusive as a Savile Row suit. Quiet and surprisingly economical. Will undoubtedly last for 300,000 miles. Amortize the purchase price over that distance and it’s .23 cents per mile. Of course the gas will cost you about $30,000 in that time, at $3.50 a gallon. 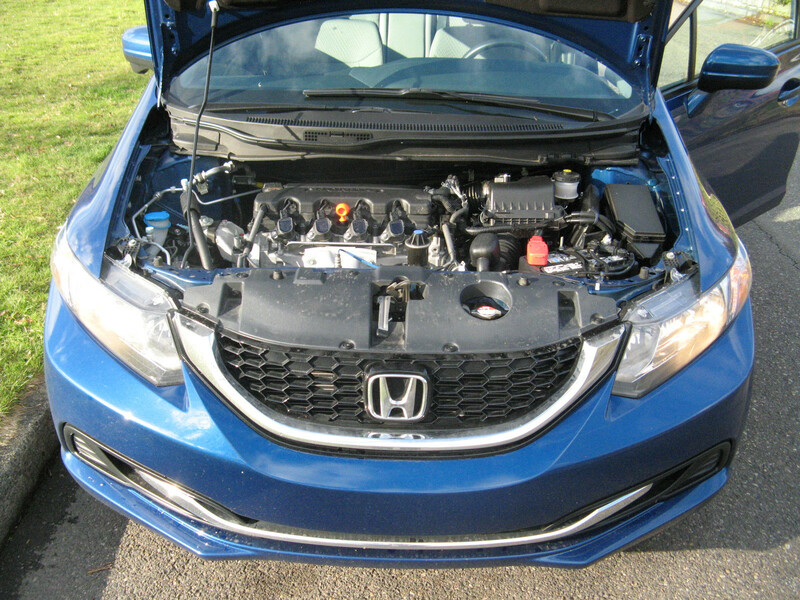 Likes: Decent performer: 150 hp SOHC 2-liter 4-cylinder much better than feeble 111 hp 1.5-liter hybrid . Five speed automatic transmission, (no CVT thank God) anti-lock four-wheel disc brakes, traction control, stability assist, 10 air bags, dual-zone air conditioning, moon roof, multiple air bags, navigation with voice recognition, straightforward controls. Decent stereo with AM/FM/CD/XM/MP3 ipod etc hard disc. Heated leather seats a huge improvement over the Civic’s flimsy cloth. Superior wiper sweep, power windows, door locks, brakes, electronic steering and rear camera. Gripes: Like all Civics, the ILX is offensively noisy at highway speeds. 24 mpg not impressive in this category. No spare tire. Verdict: 40 mpg is the new 30, and when bigger cars like the Toyota Camry and Honda Accord get better mileage than this pipsqueak, it’s clear that somebody at Acura was surfing the web during office hours. I’m not sure where Honda goes from here; the Acura ILX is small for the money, noisy and doesn't get very good mileage. The bar in this category has been raised a lot since this platform was laid down five or six years ago. Maybe this is Honda’s Cadillac Cimarron: no matter how that was fancied up, it was a Chevy Cavalier at heart. Would you pay $32,000 for a Honda Civic? Thought not. Me neither. Buy an Accord or a Camry and have some decent resale too. Likes: Mazda’s most sophisticated SUV has benefitted from a facelift but otherwise it’s still well sorted. All-wheel drive; DOHC, 3.7-liter, 273hp V6 has enough grunt to scoot its 4,400 lbs from 0-60 in 7.9 seconds through 6-speed auto trans with sport shift. Precise speed-sensitive power steering and excellent brakes. Well balanced; car can be driven aggressively without scaring yourself. Active torque split AWD, rain-sensing wipers, Traffic proximity warnings, backup camera. Speed sensing door locks, multiple airbags, mostly 5-star safety ratings. Keyless entry, heated leather seats (driver’s with memory), dash well organized, gauges clear, three-zone climate controls, power moon roof. Excellent Bose sound system with MP3/Bluetooth capability CD and XM. 100cubic feet of storage with all seats down. Power tailgate a nice touch. Dislikes: Not many. Middle passenger in back seat won’t be comfortable. Third seat confined to short, athletic children. 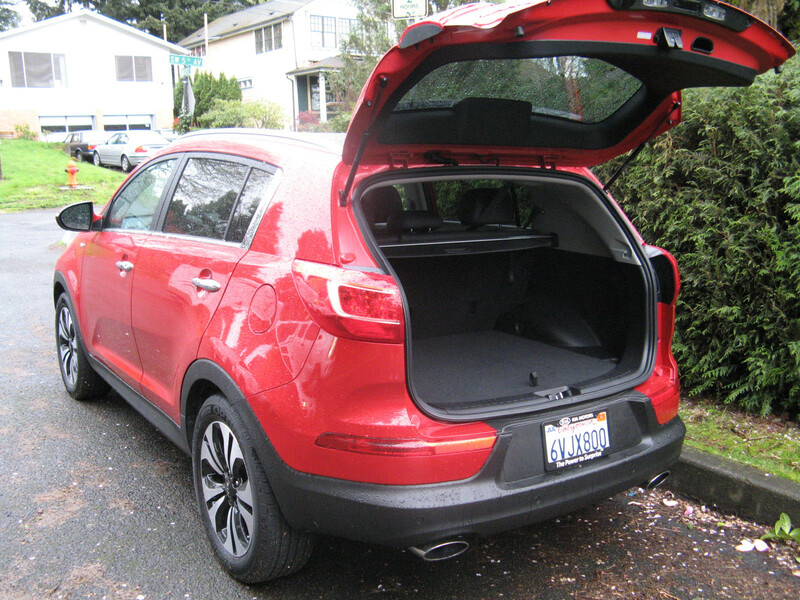 Not much rear storage with all seats up (17 cu feet), though underseat locker helps. Thirsty – 16 mpg around town. Traffic proximity warnings a bit cautious. Verdict: Useful mid-size SUV, but the new CX-5 sold 43,319 units this year, all at the expense of the CX-7 and CX-9, so mileage must be a big factor. The CX-9 is good but it’s showing its age. If 40 mpg is the new 30 for mid-sized sedans, 27 mpg is the new 15 for mid-sized SUVs. Unless gas prices continue to go down, the disparity in sales between the CX-9 and CX-5 will widen. Likes: Updated and nippy SUV, which somehow extracts more style from a little box than you expect. 0-60 in 8.8 seconds, thanks to 164-horsepower VVT DOHC 4-cylinder and six-speed automatic transmission, which returns 34 mpg highway. Simple interior, instruments clear, controls intuitive. Reasonably quiet at speed, capable handling, handsome 18-inch mags. 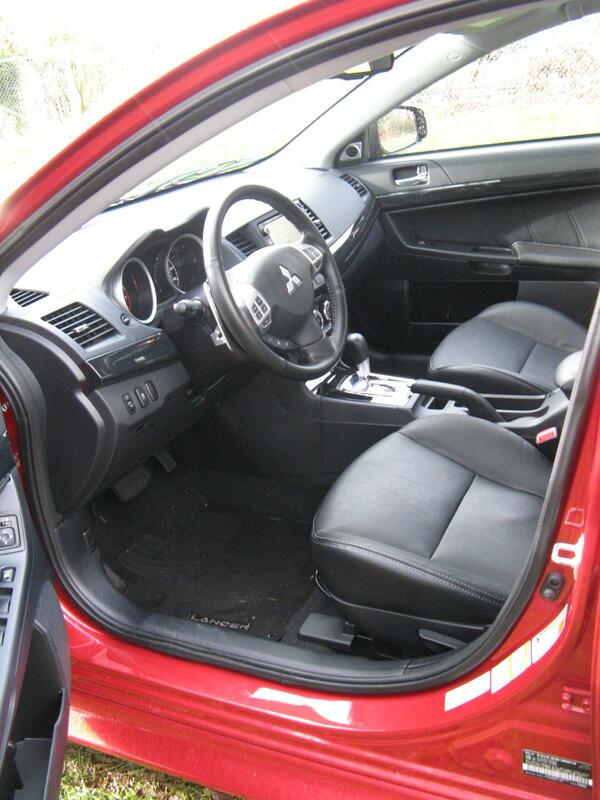 Excellent steering and AWD disc brakes, multiple air bags and curtains, four star crash ratimg. Decent stereo/CD/XM/MP3 etc. 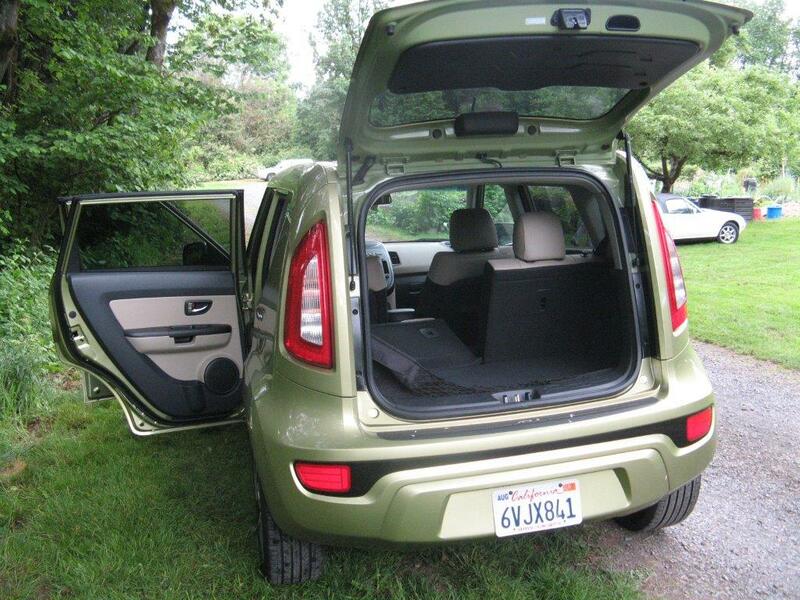 Remote entry, power windows, moonroof, backup camera, 53 cubic feet with rear seats down, 19 when they’re up. Will seat four adults. 10 year 100,000 warranty. Quirky interior lighting. Gripes: Not as much storage as some competitors, especially with seats up. Could be quieter, AWD would be attractive option. Dashboard design still a bit clunky. Verdict: Charming and useful small wagon that’s very good value as well. Responsive and handles quite well for tall, boxy configuration. Look for Kia to grow the brand the same way Mini has, and check out Chicago Auto Show Track’ster, a chopped three-door concept, which has 250-horsepower turbo four, 6-speed manual transmission, big fender flares and wide wheels like Renault R5 Turbo, and electronic all-wheel drive. WRC anyone? If you have ever wanted to get a taste of racing, or just experience the thrill of going quickly in a safe environment, PIR track days are for you. Whether you are in a car or on a motorcycle, we offer the path for you to get on the track or drag strip. Click here for more info. Pro Drive is PIR's nationally recognized driving school, offering a wide variety of programs, from driver safety and car control courses in Skidcars, to full racing schools and even race car "arrive and drive" programs. Click here for more info. Take a look at the diverse venue options PIR provides and discover the perfect area to host your event. From company picnics to team building driving events, we've got you covered. For a truly unique and memorable experience, make PIR the site of your next event. Click here for more info.